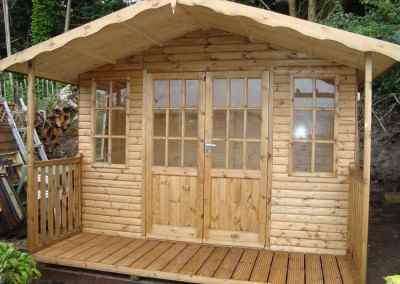 There are lots of optional extras available. 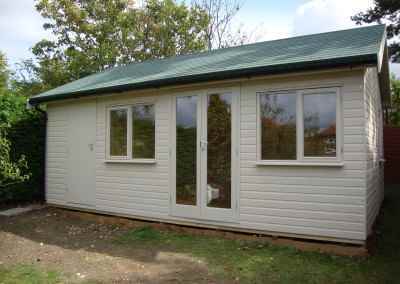 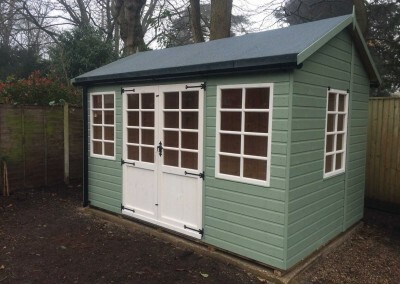 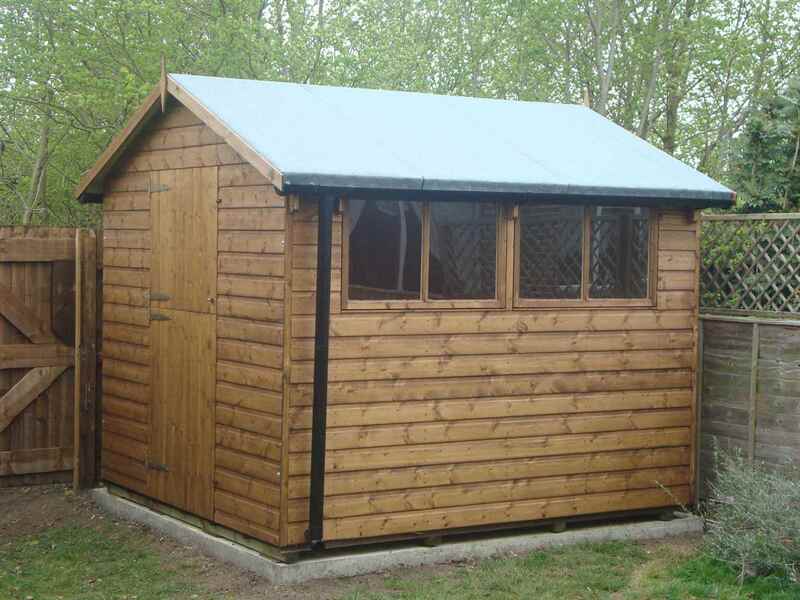 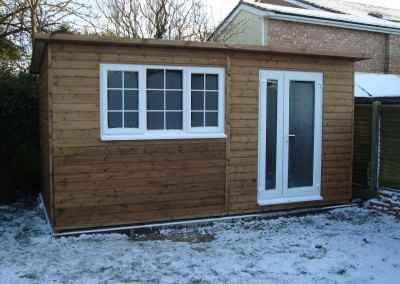 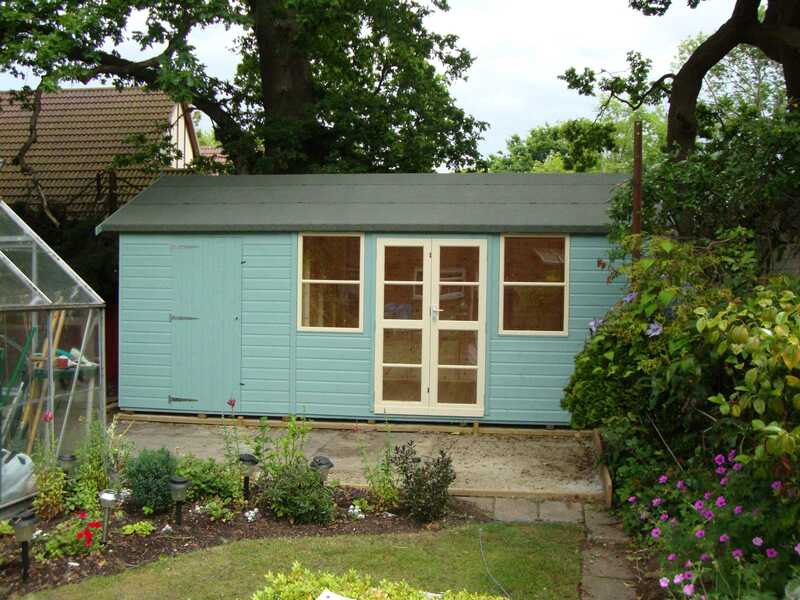 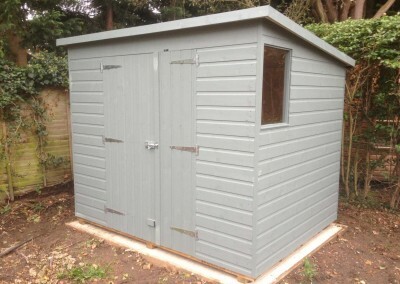 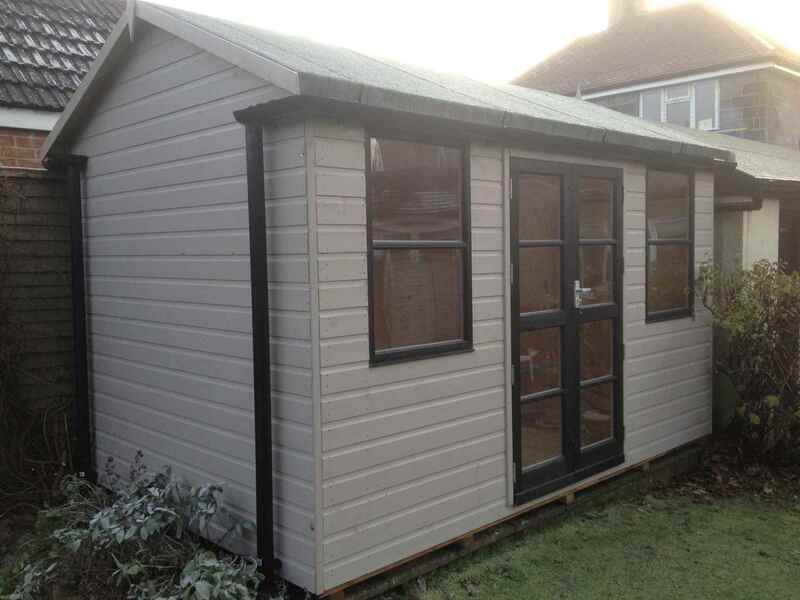 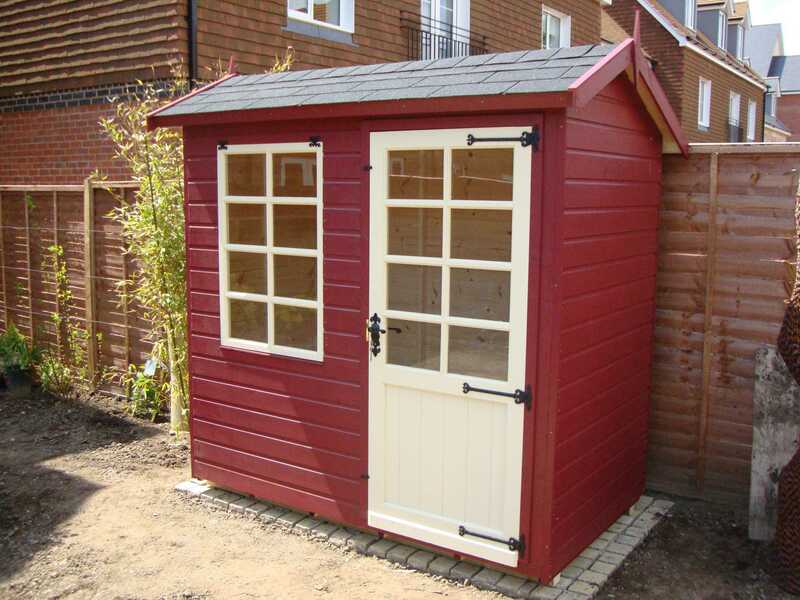 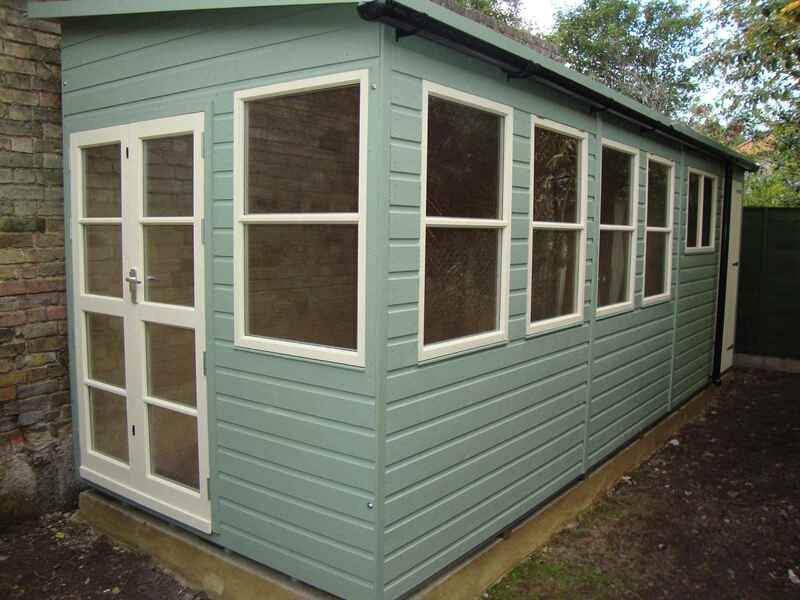 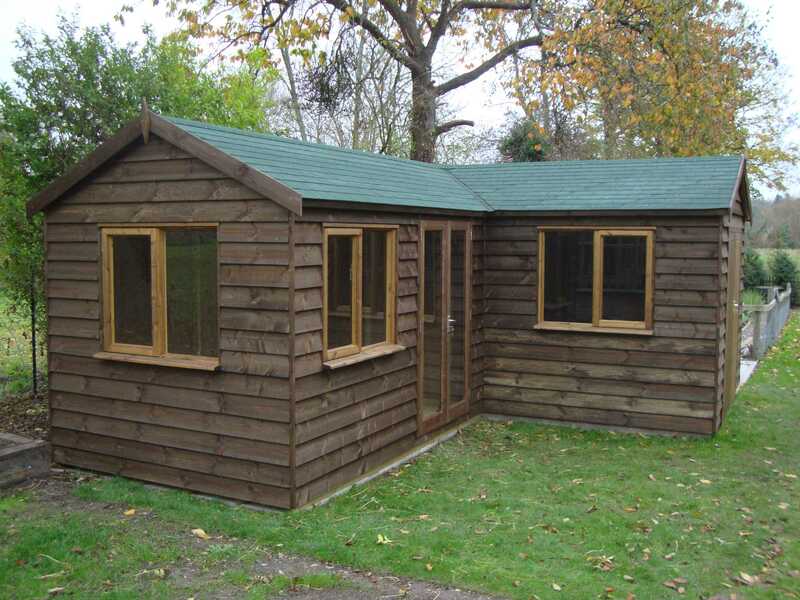 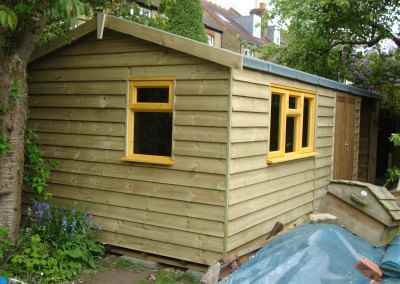 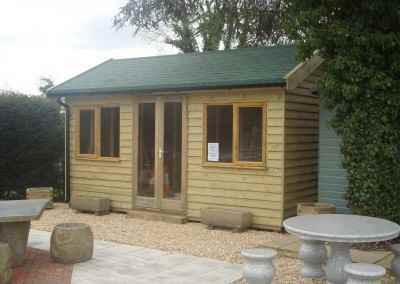 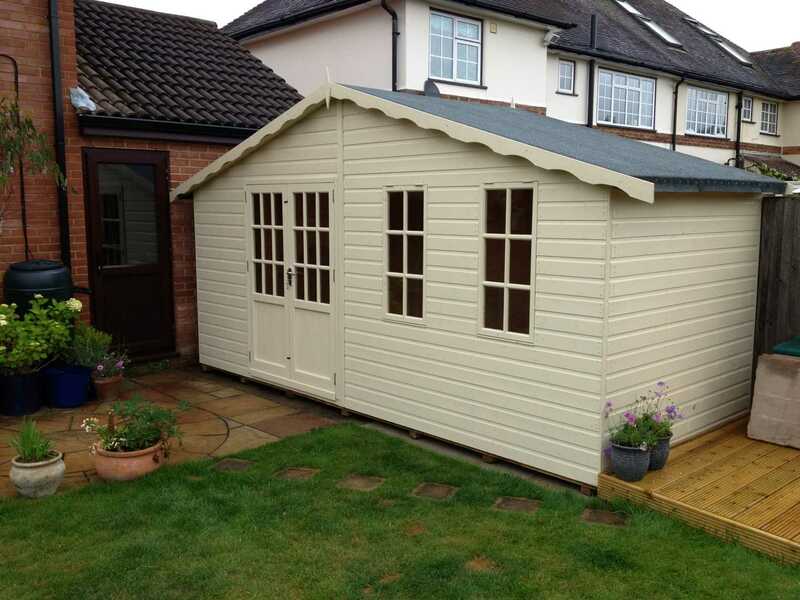 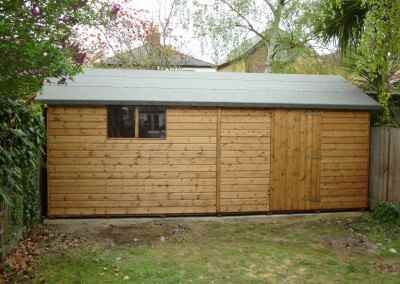 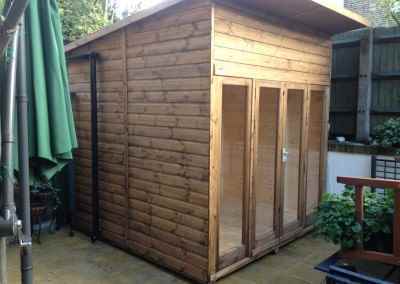 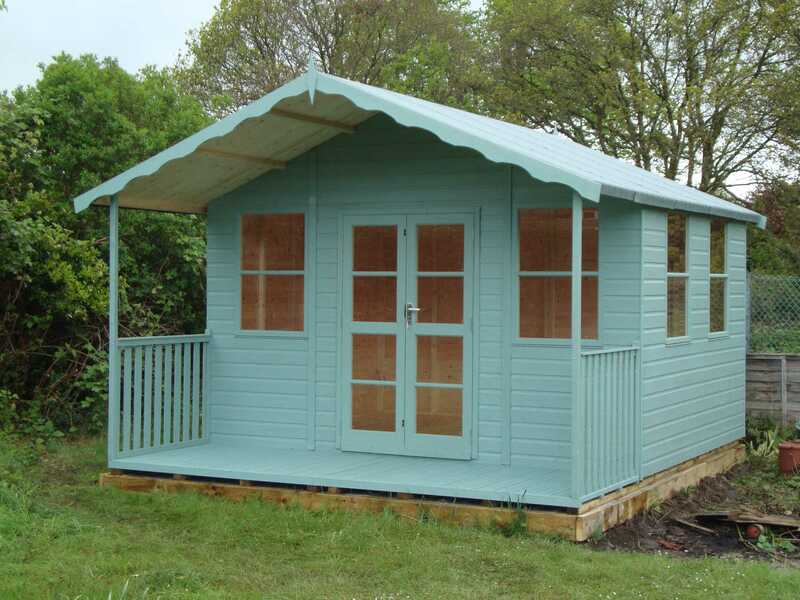 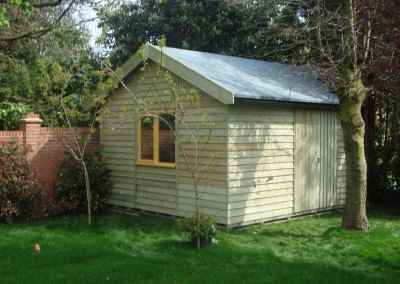 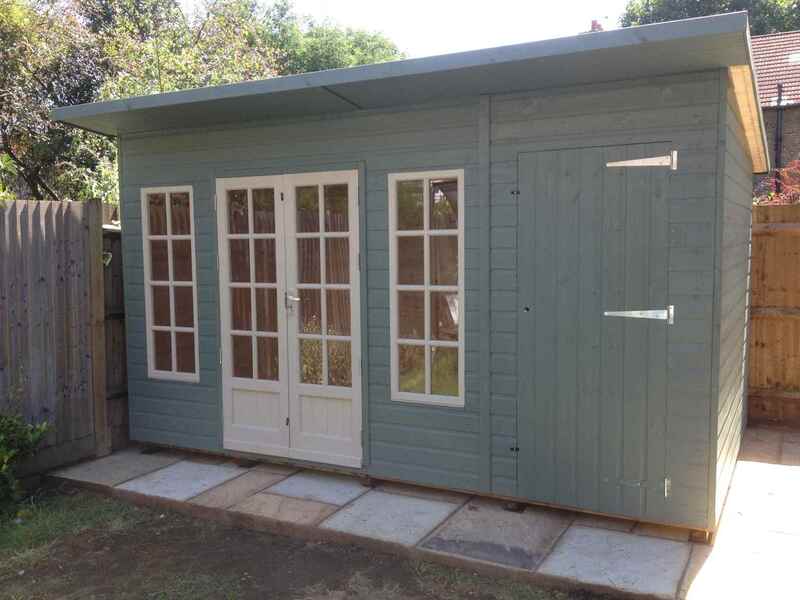 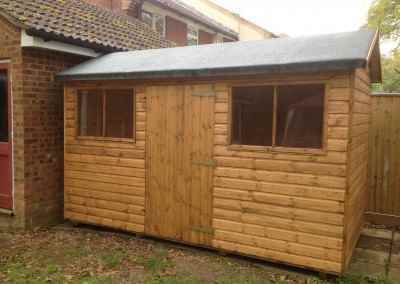 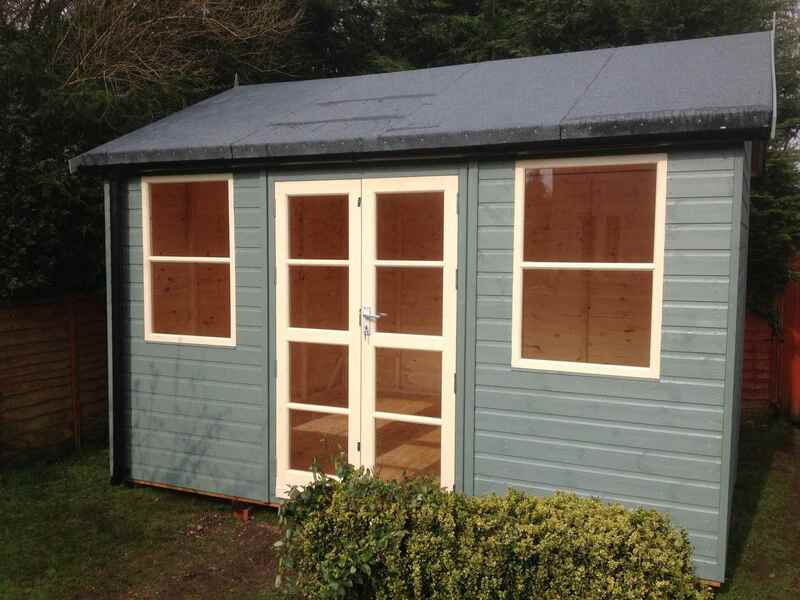 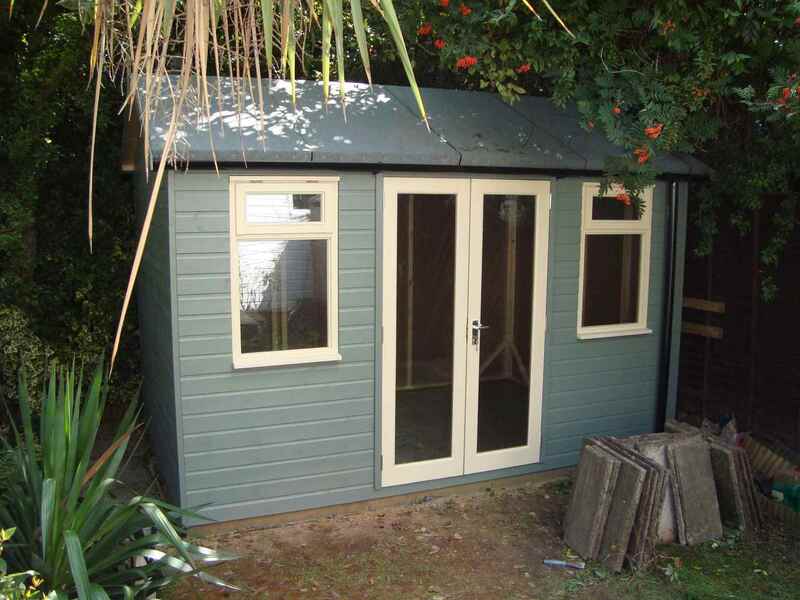 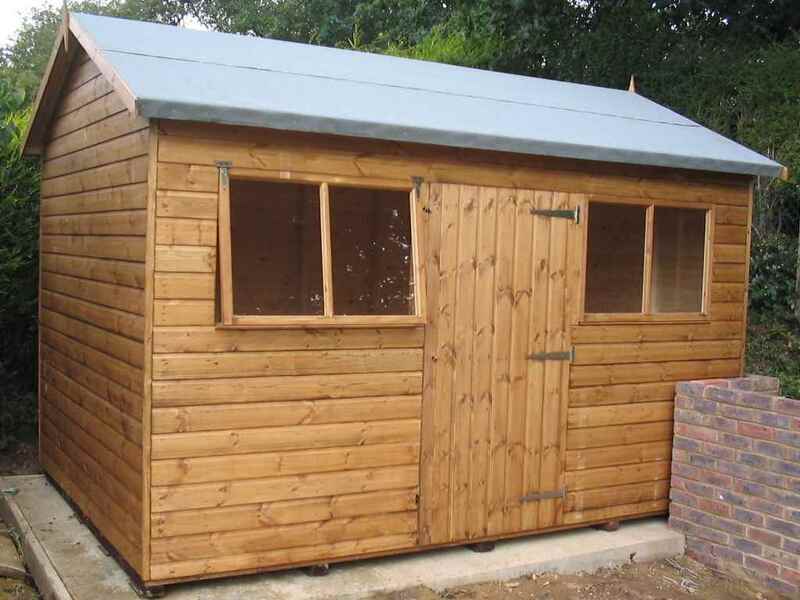 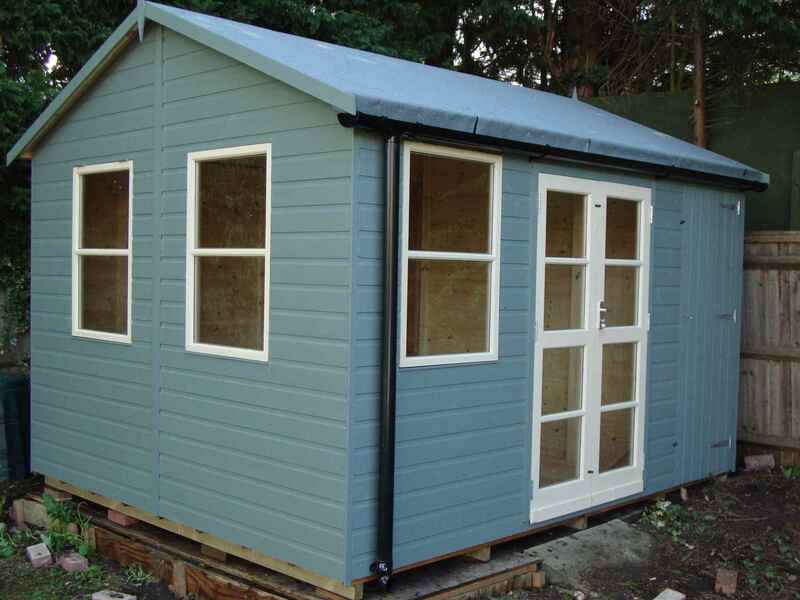 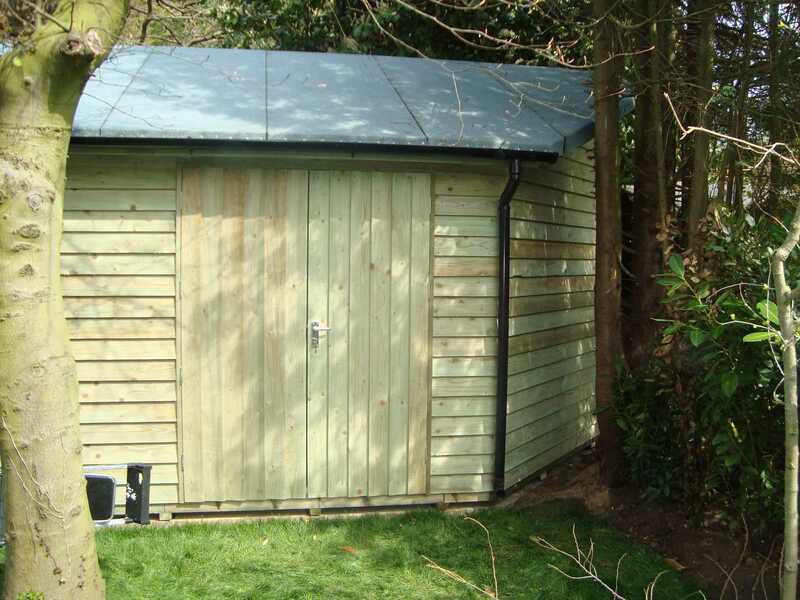 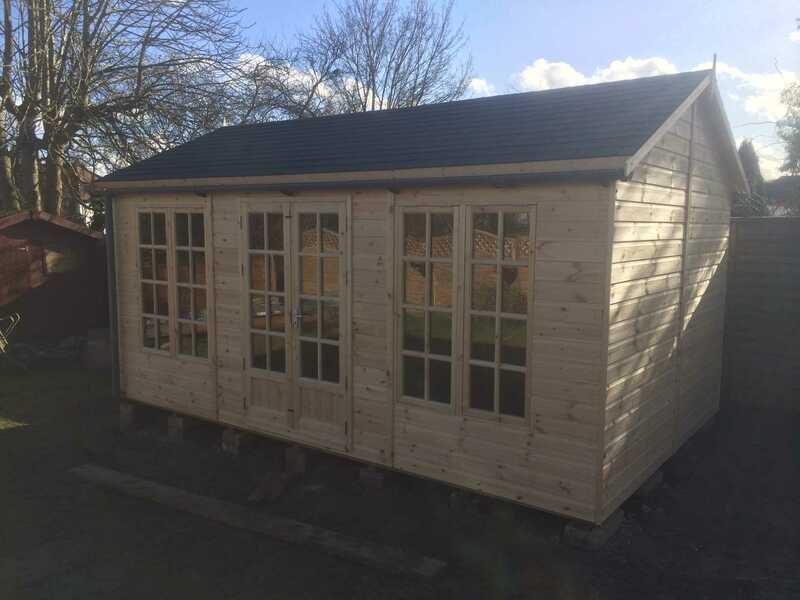 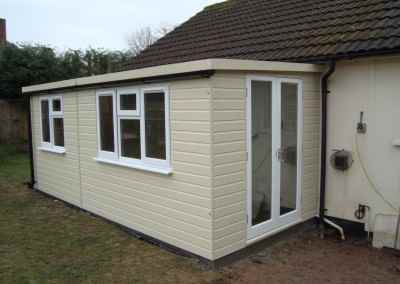 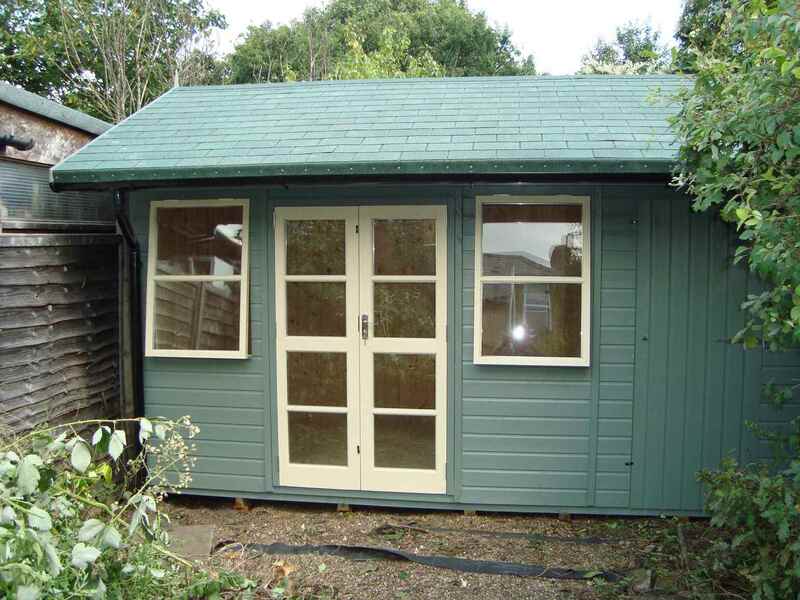 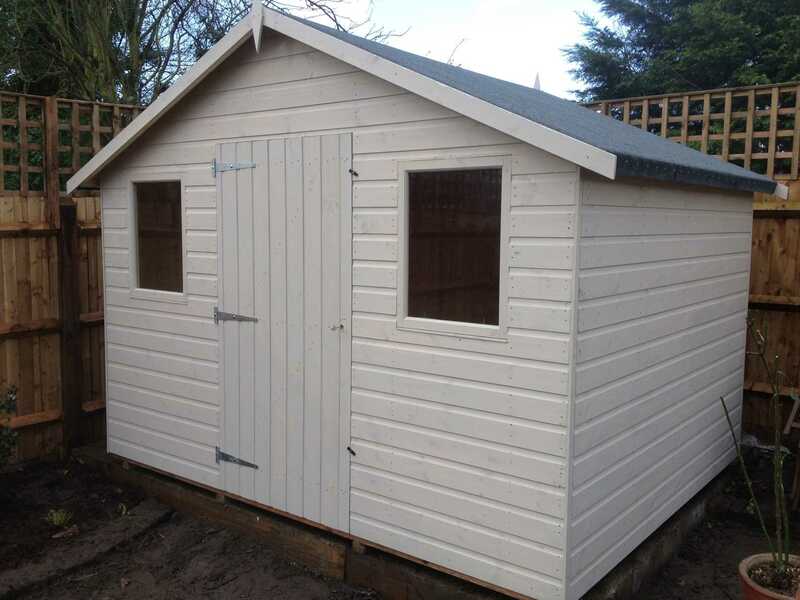 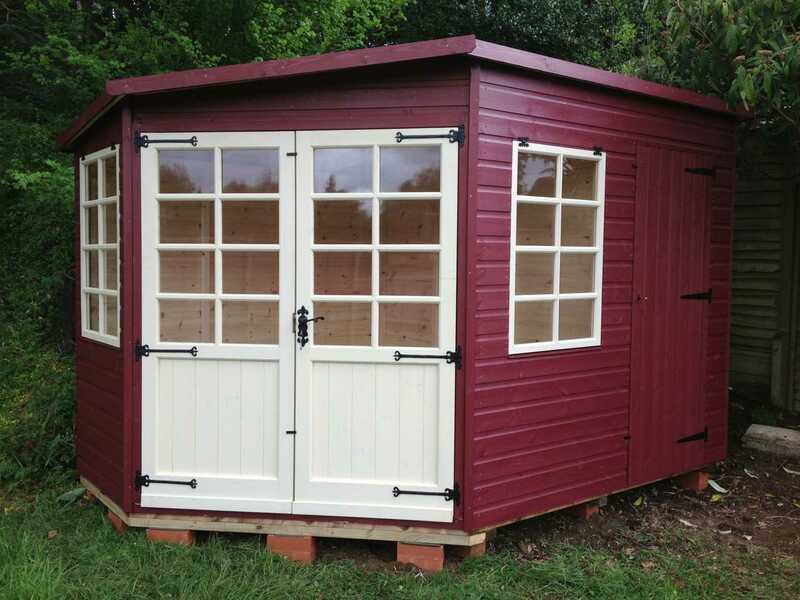 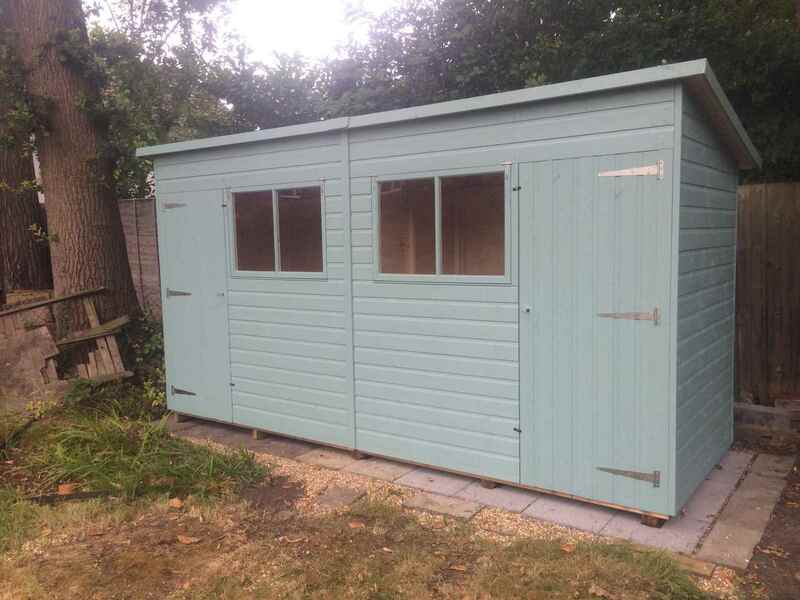 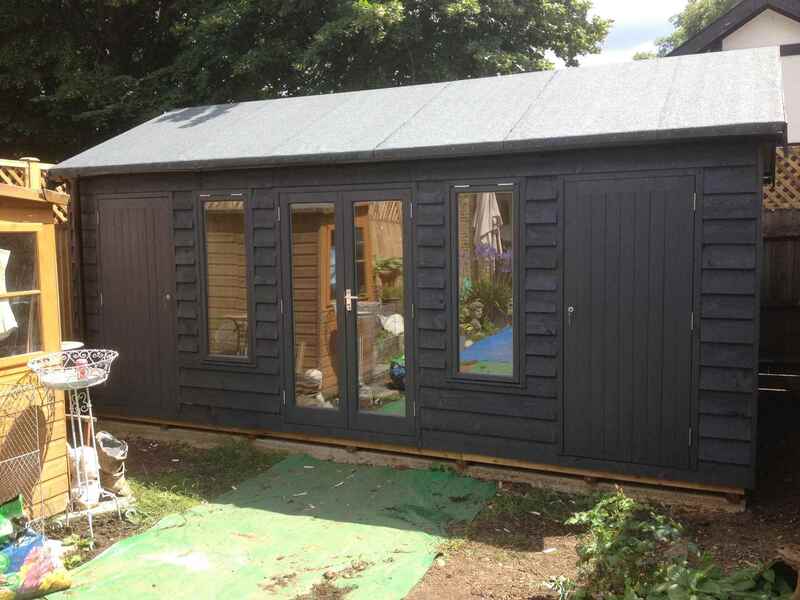 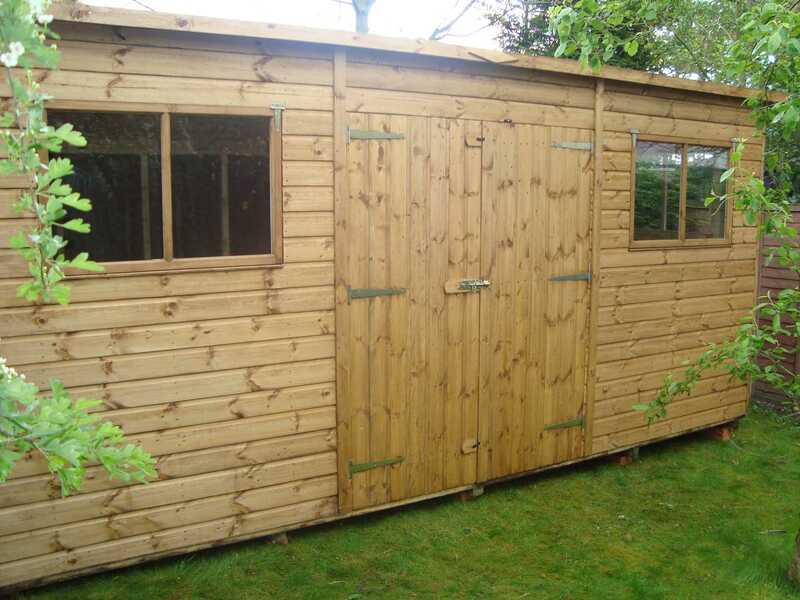 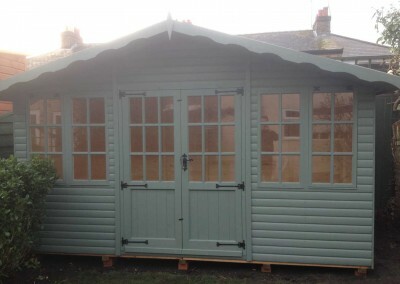 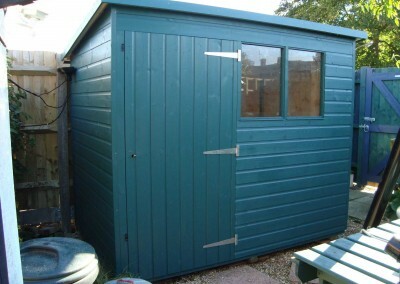 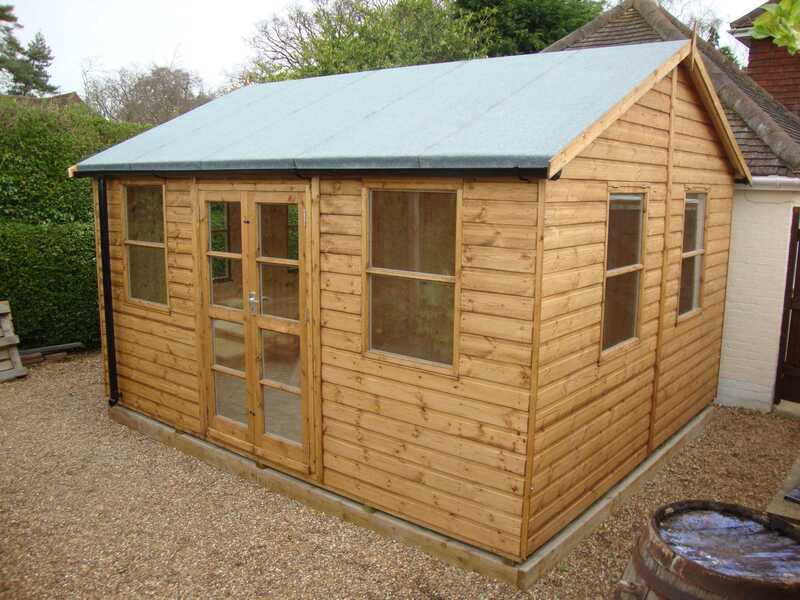 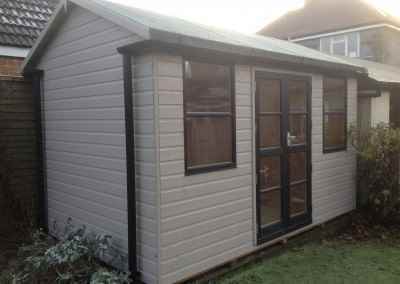 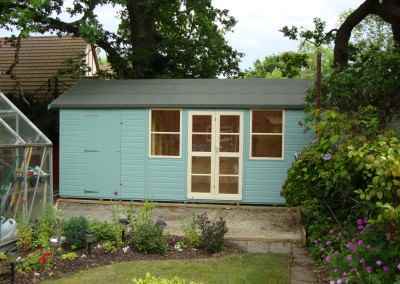 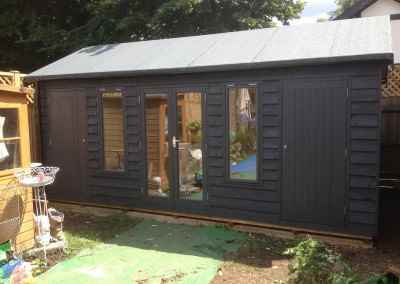 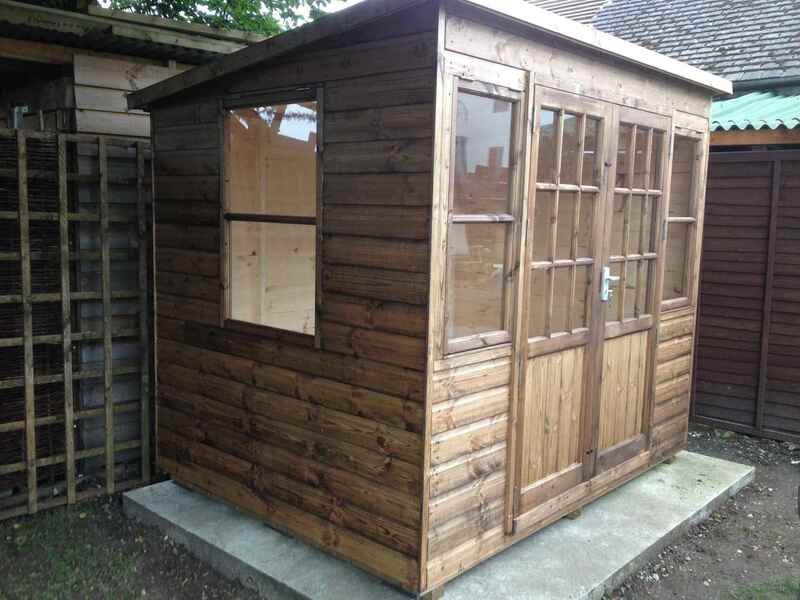 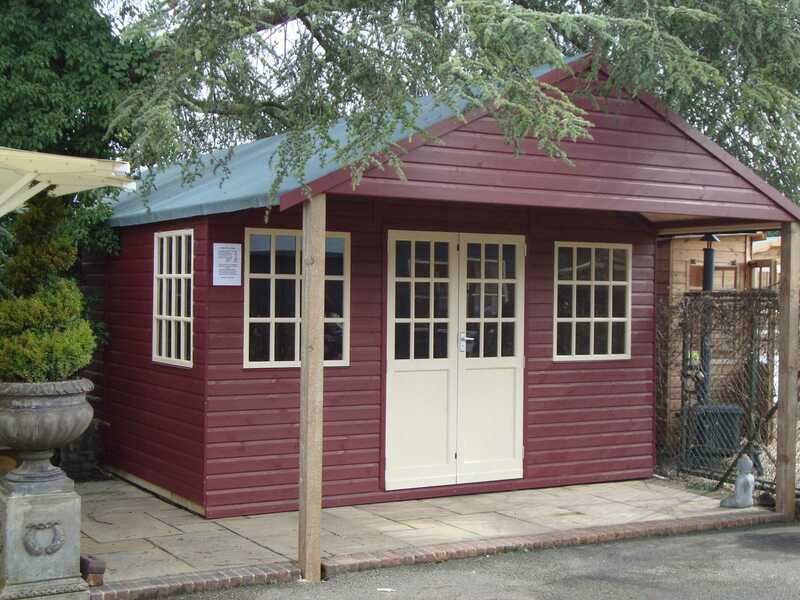 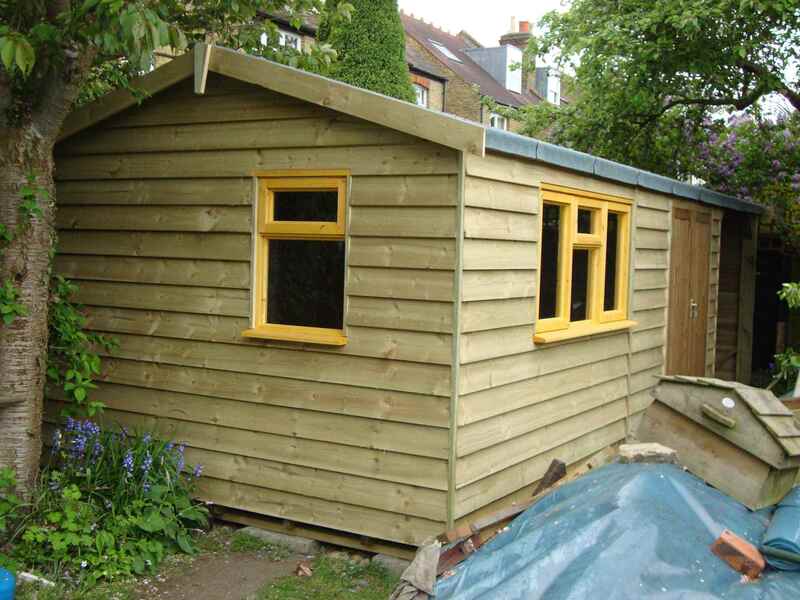 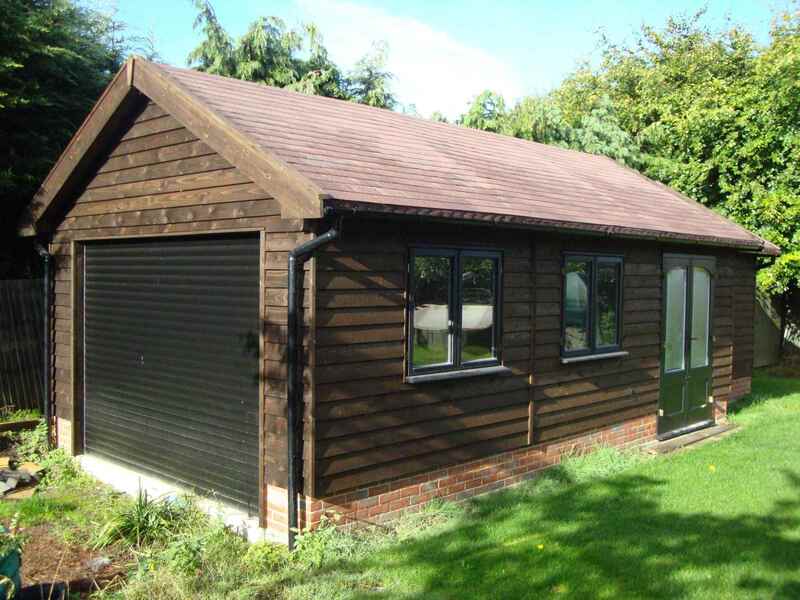 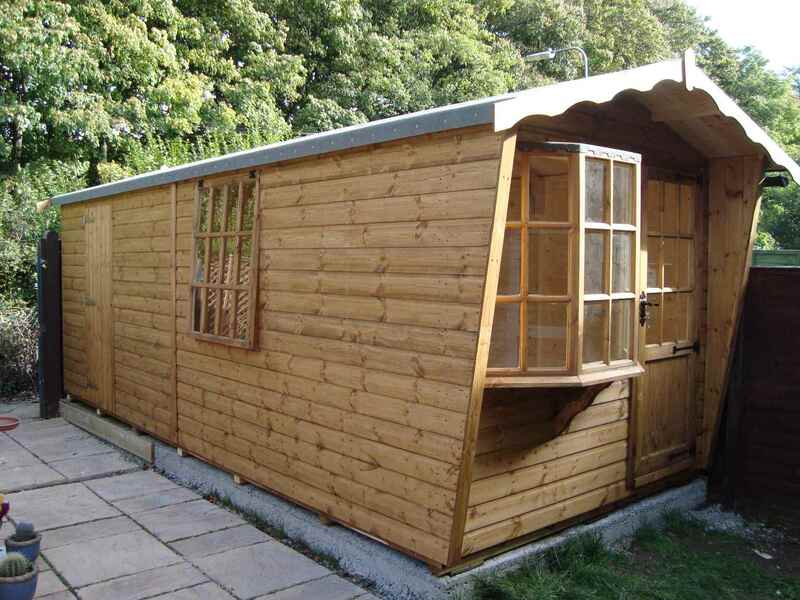 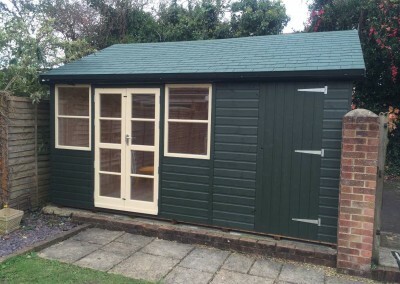 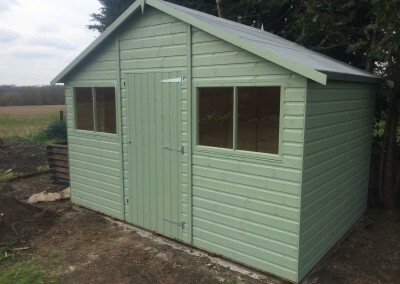 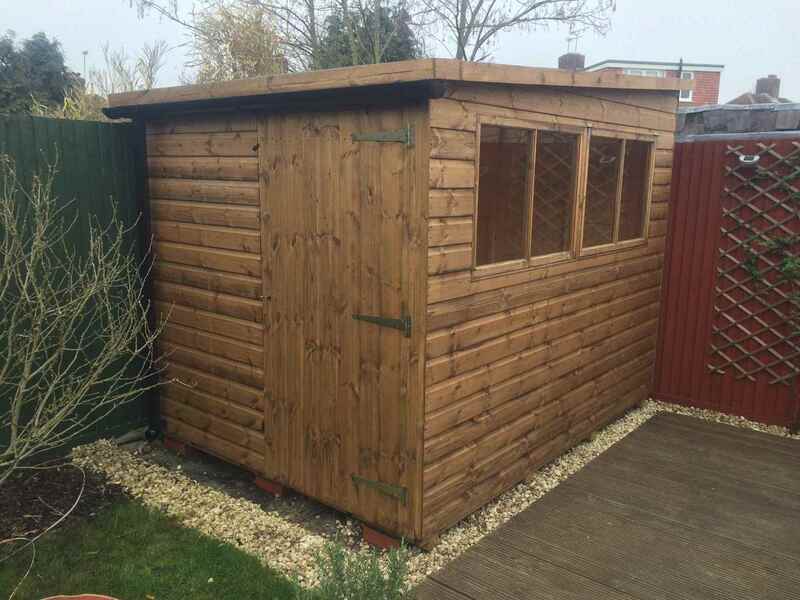 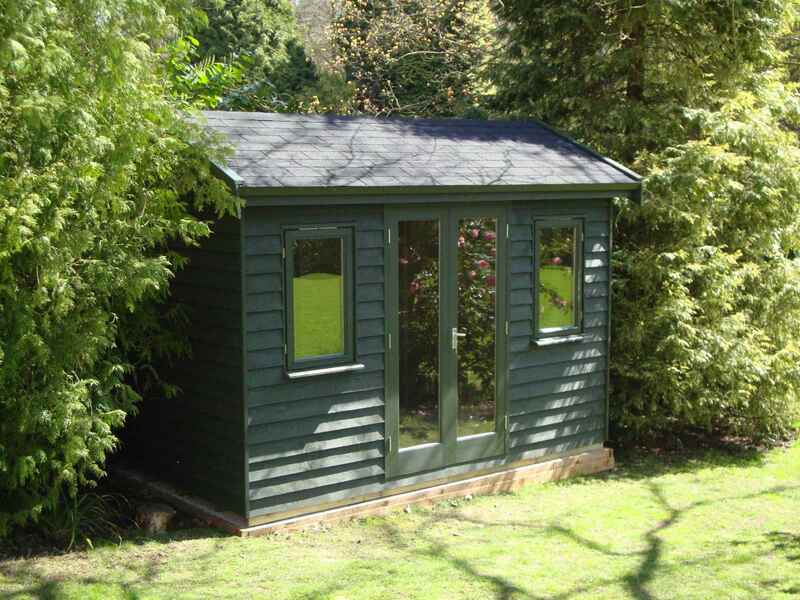 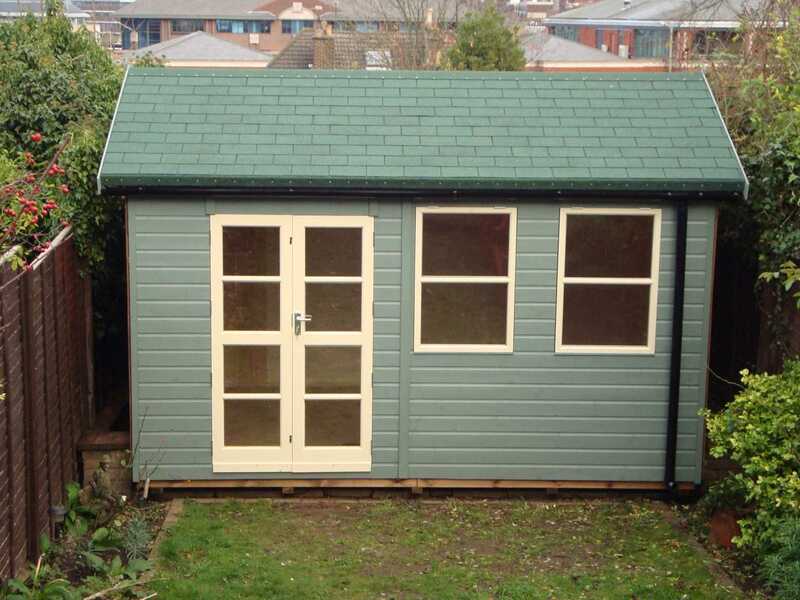 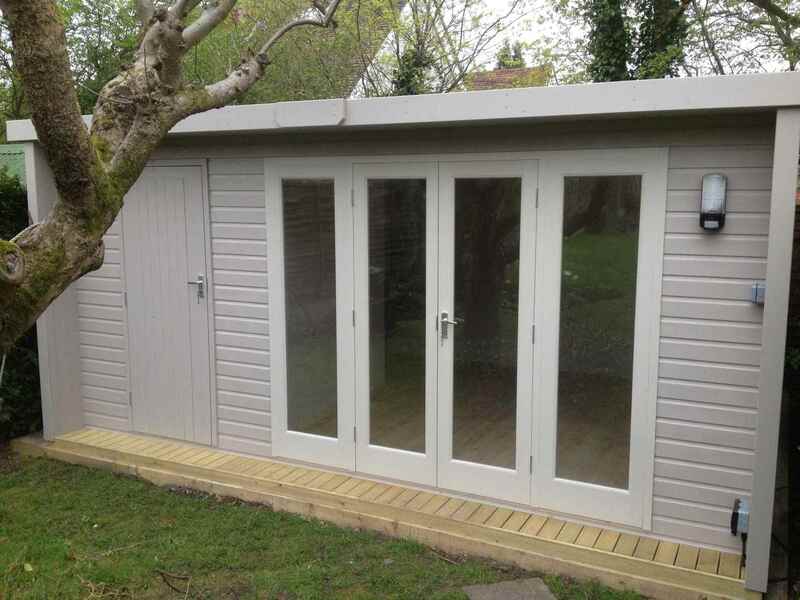 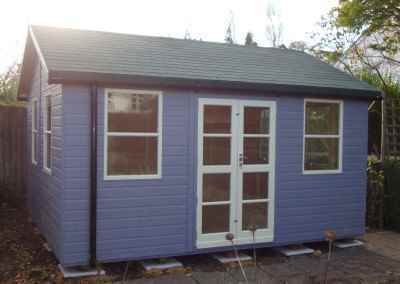 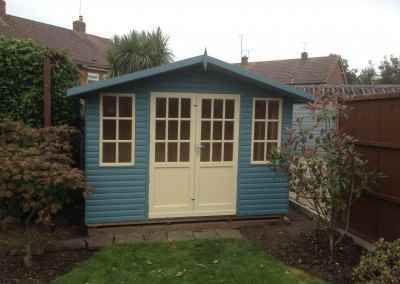 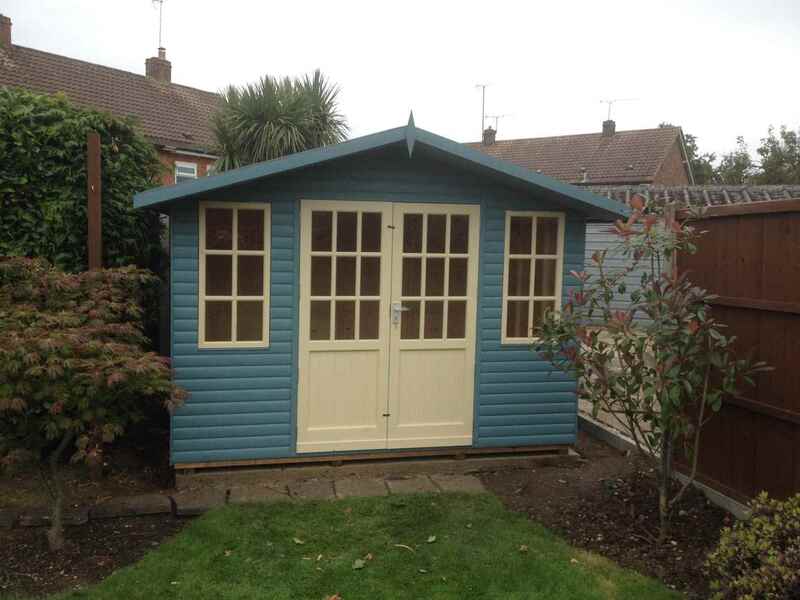 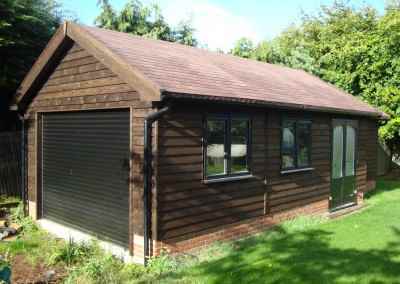 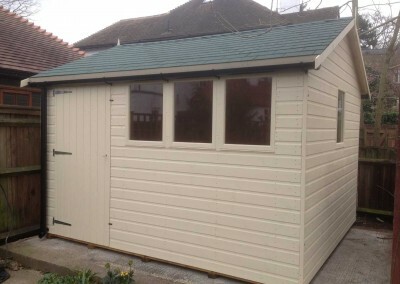 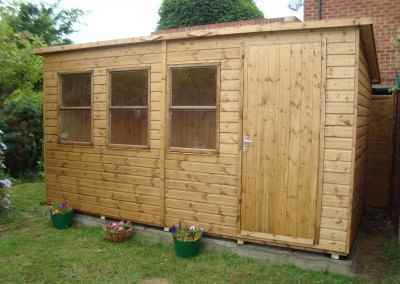 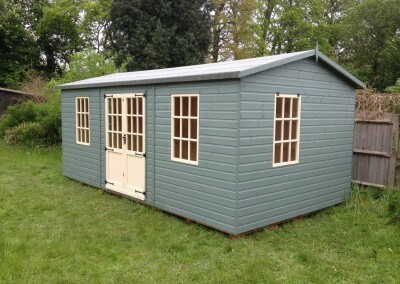 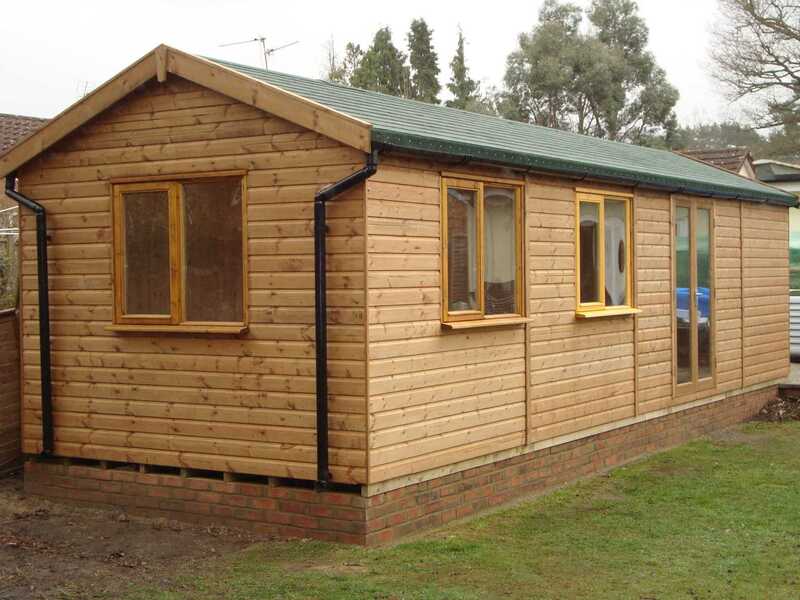 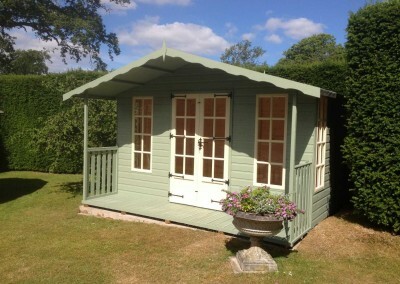 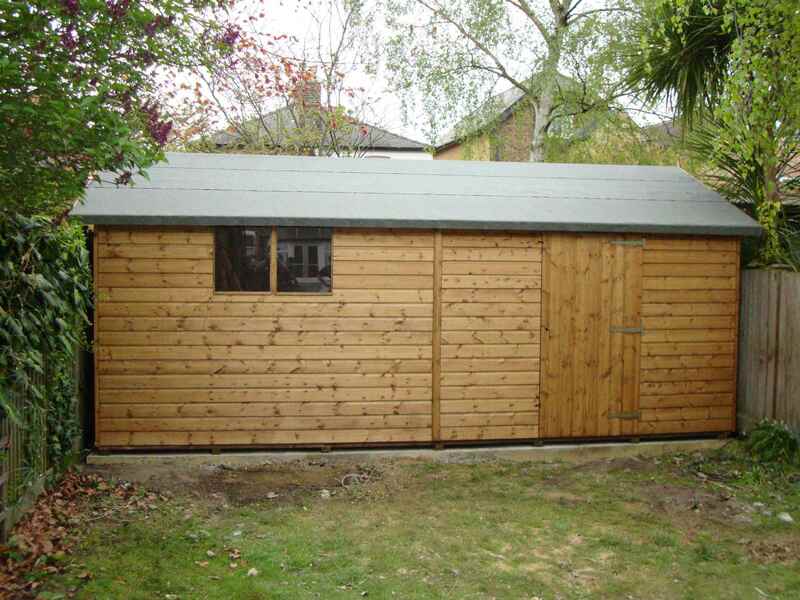 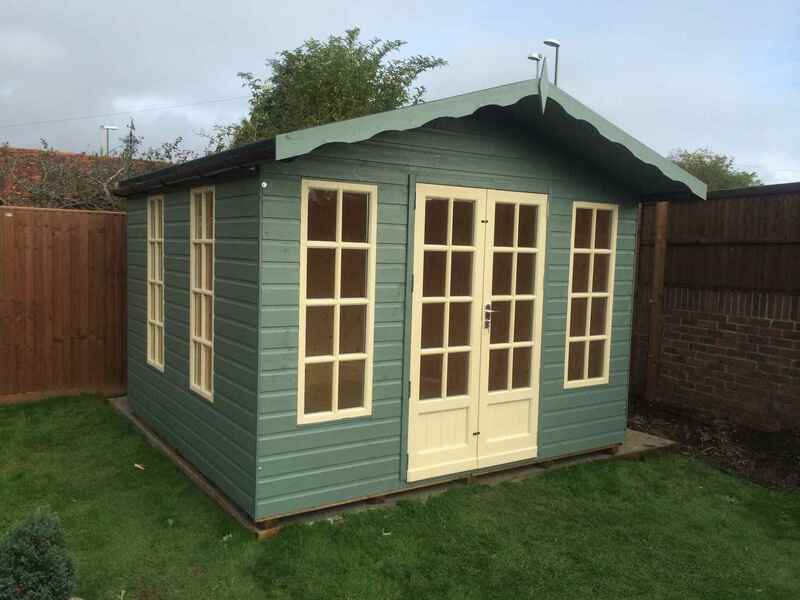 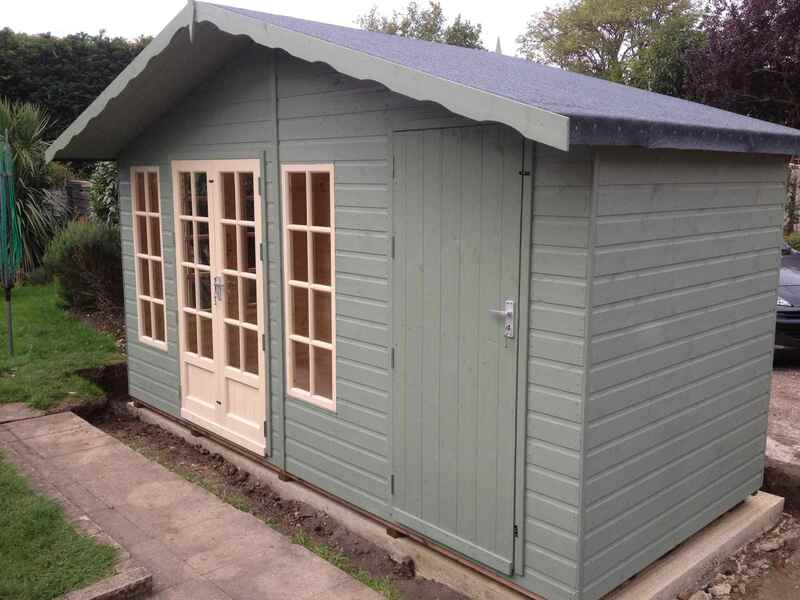 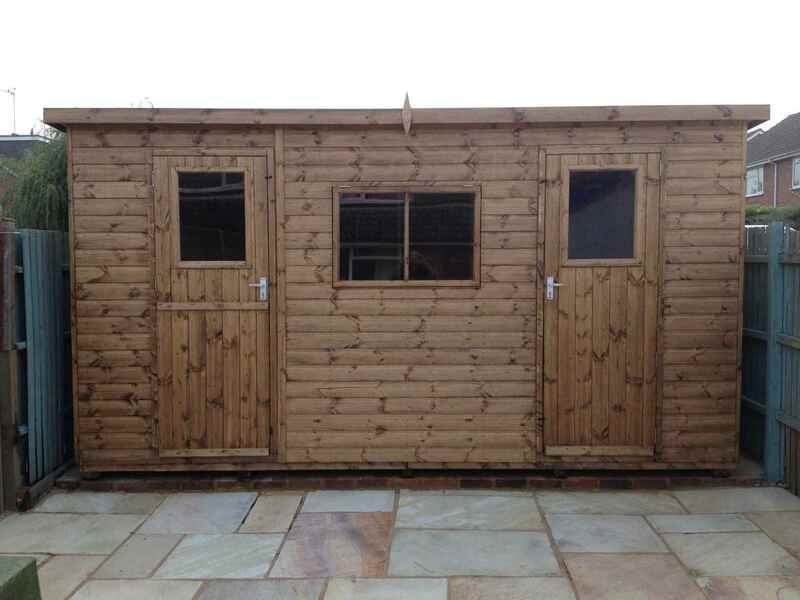 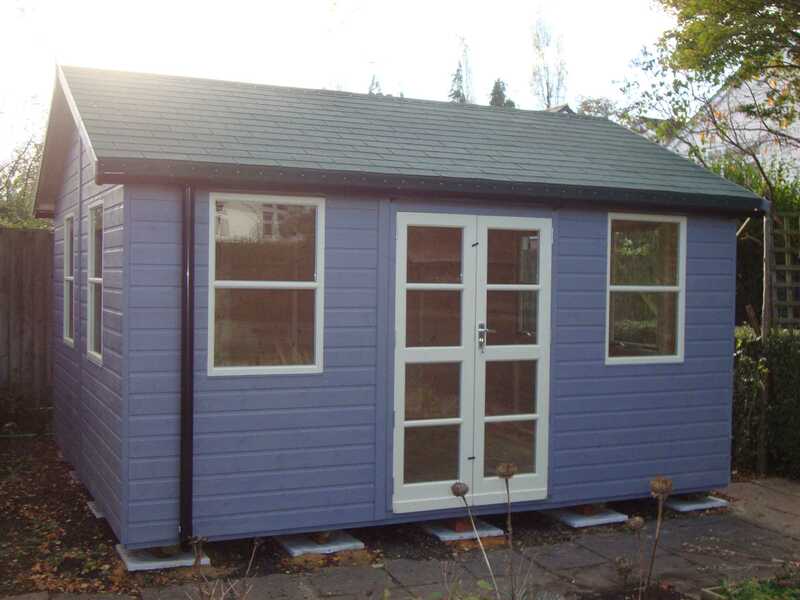 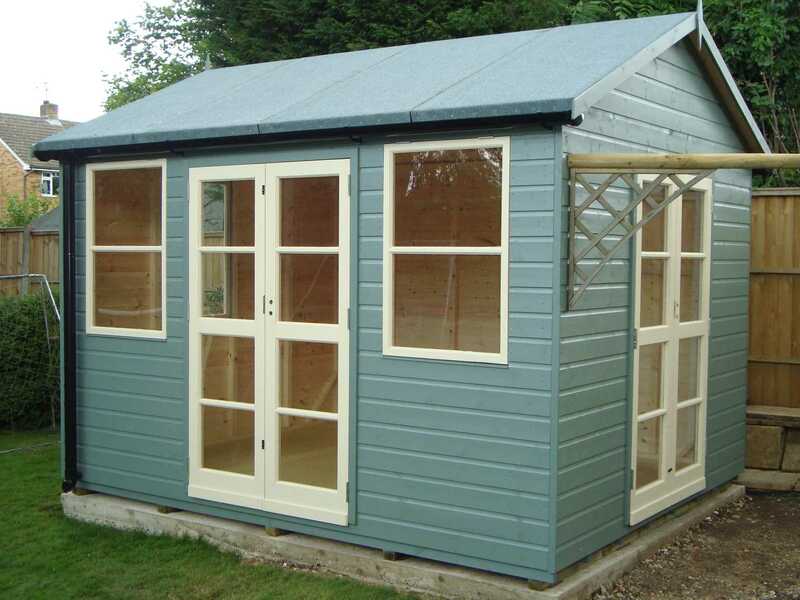 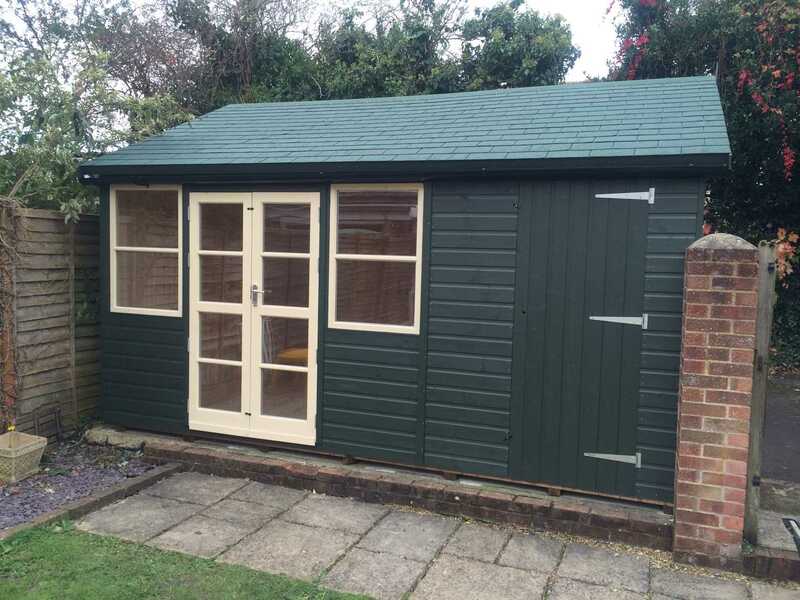 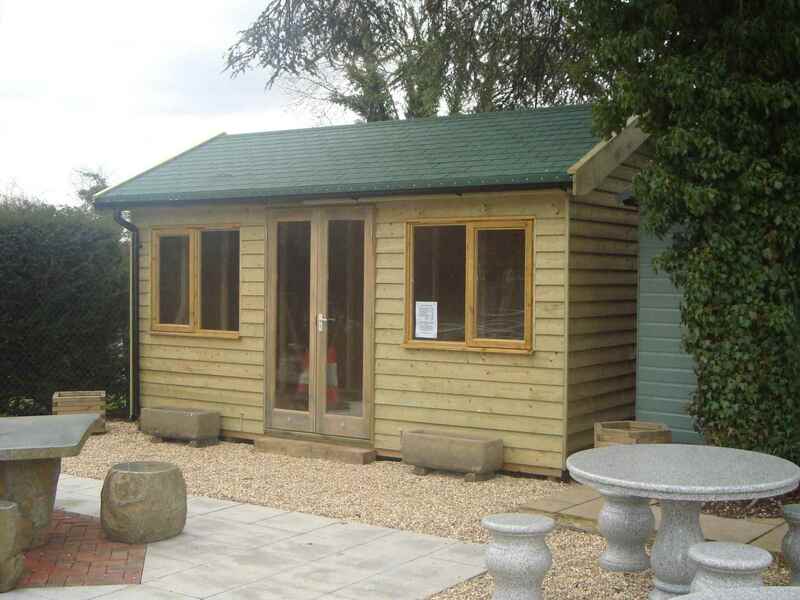 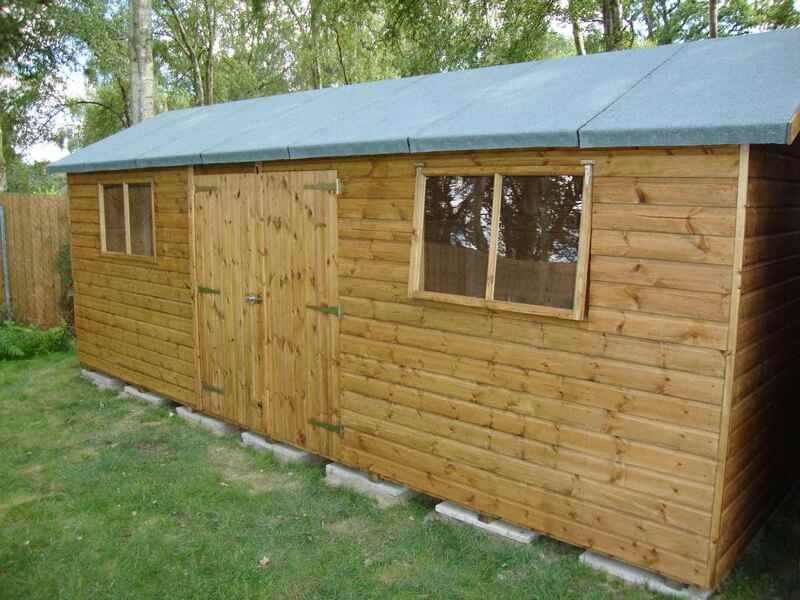 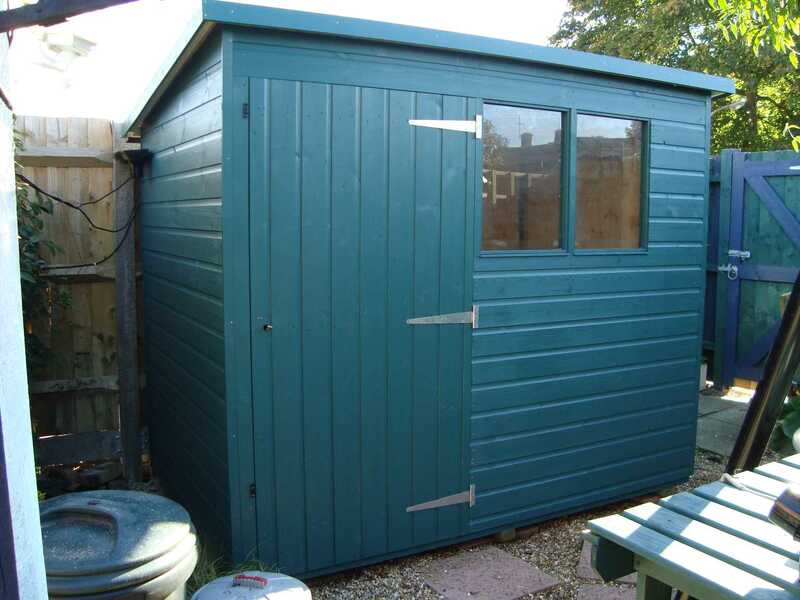 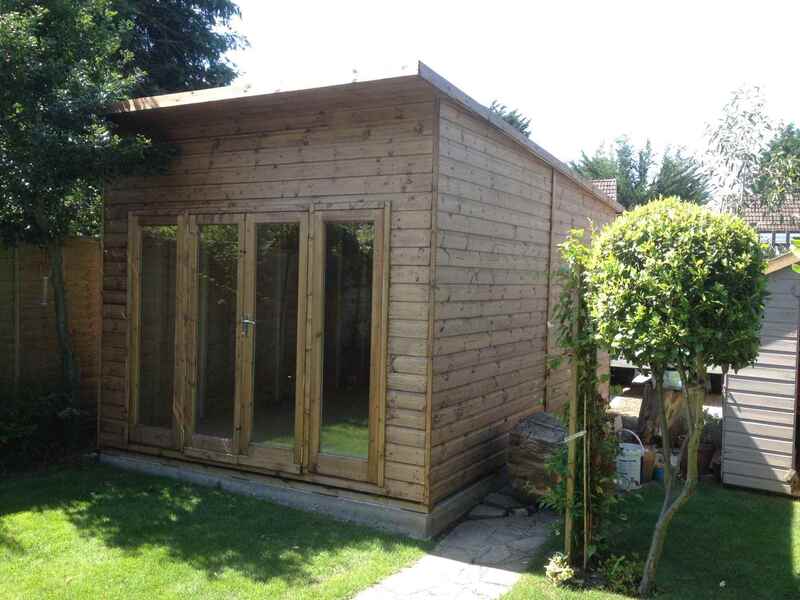 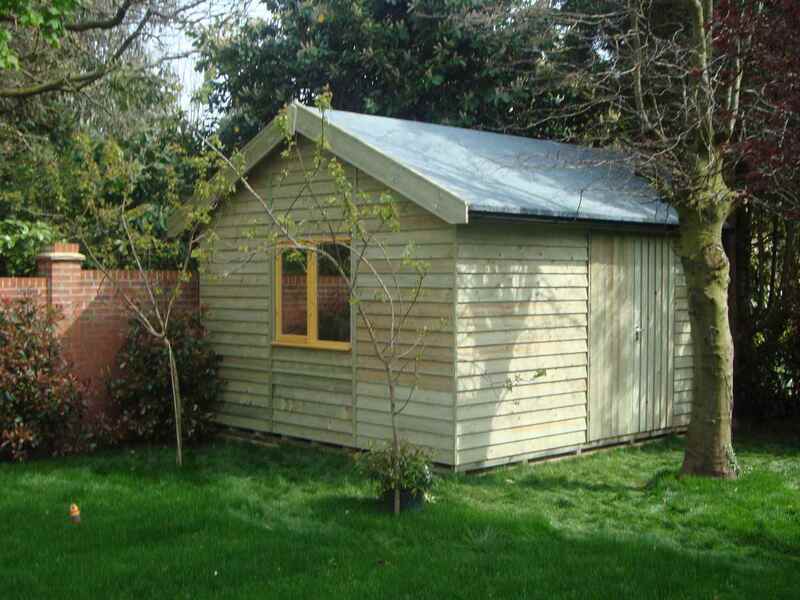 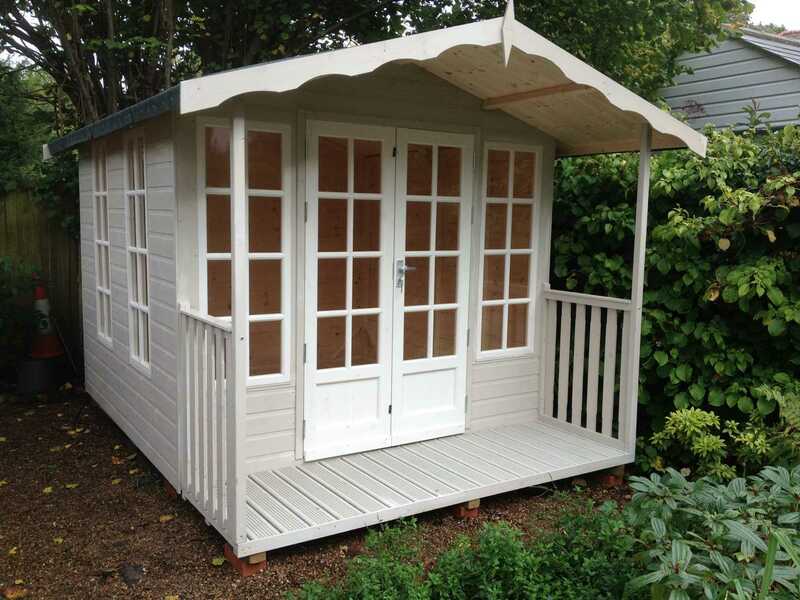 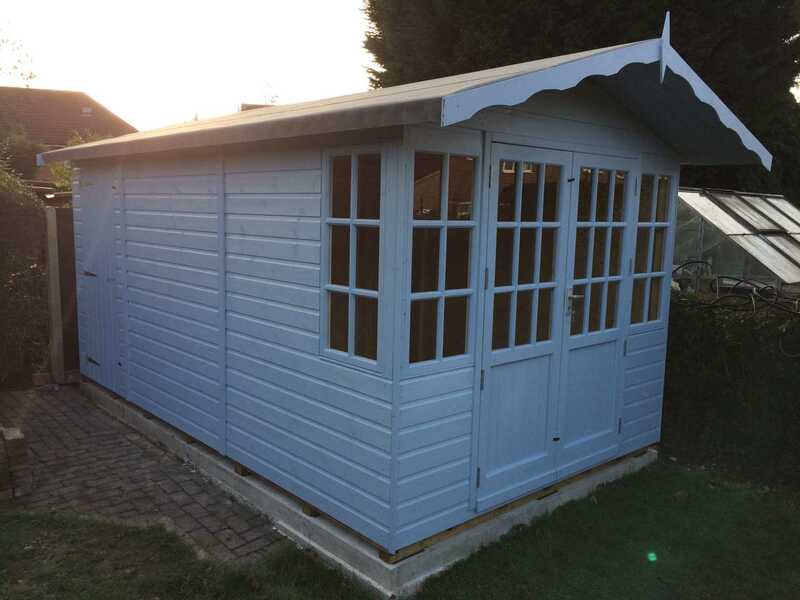 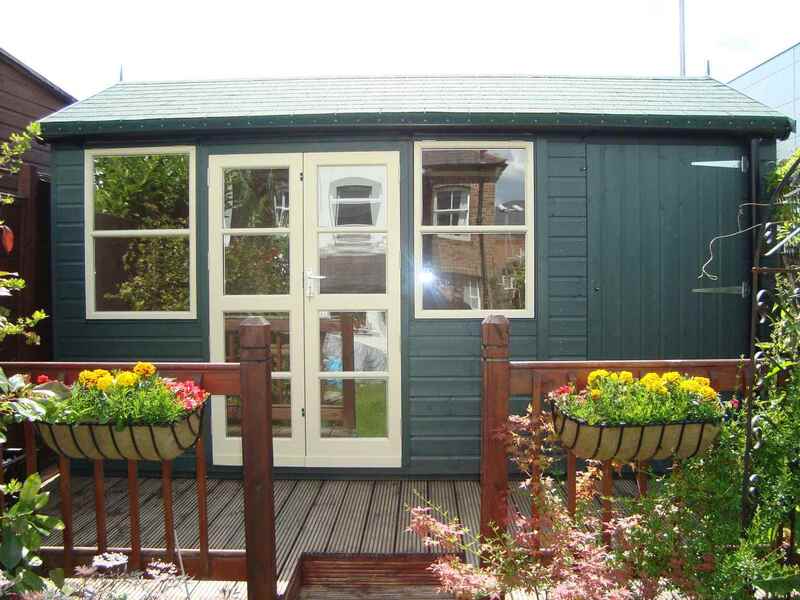 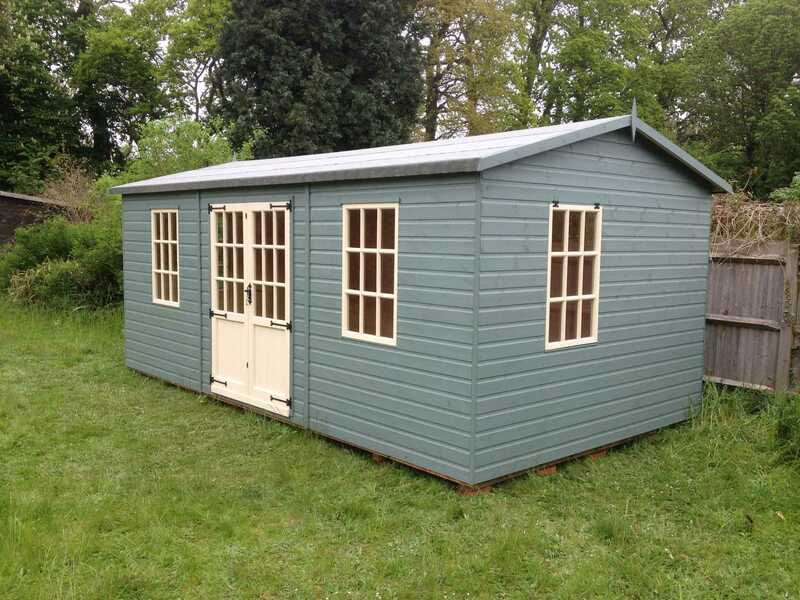 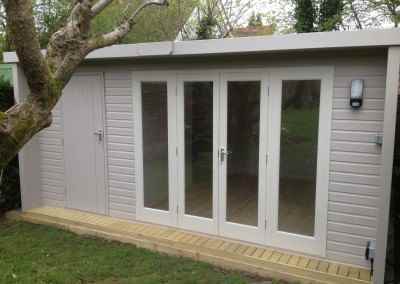 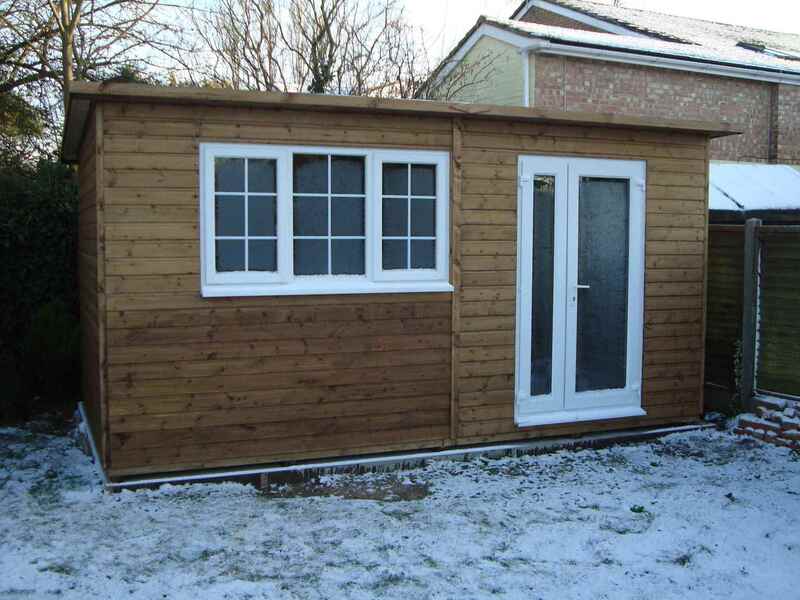 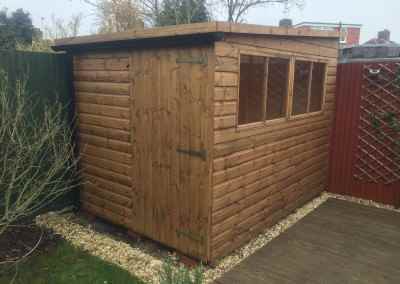 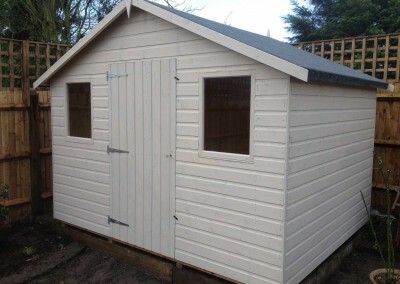 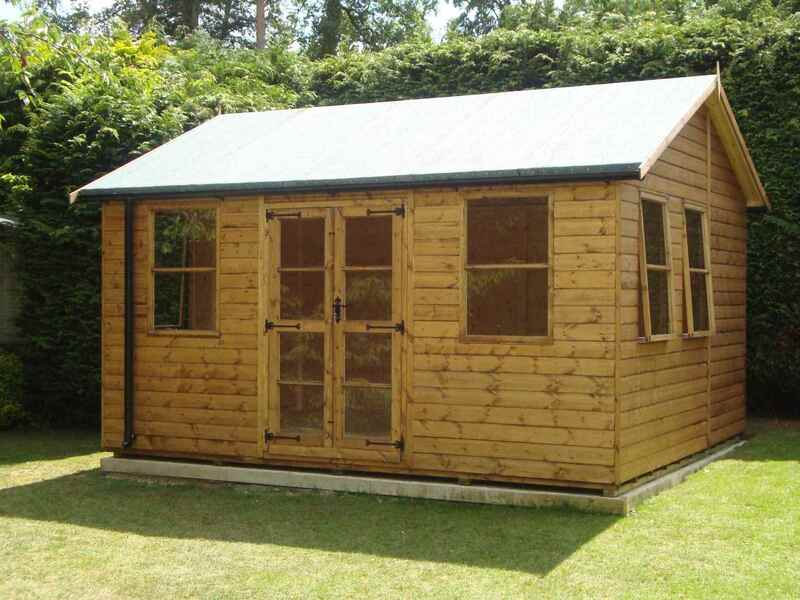 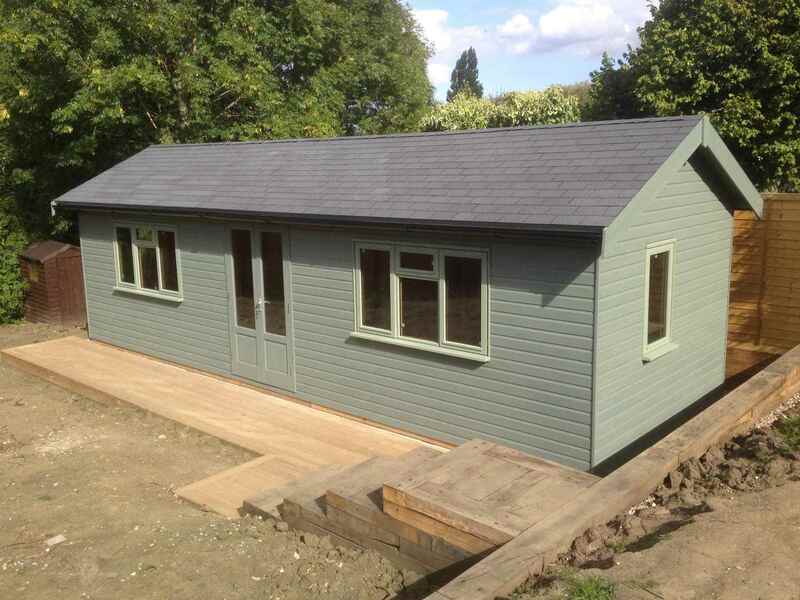 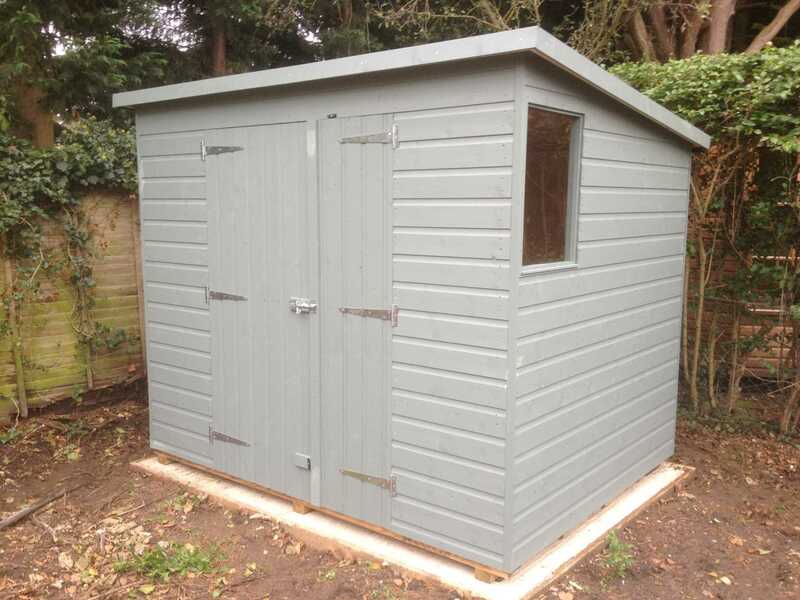 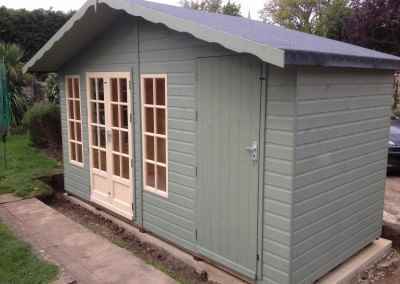 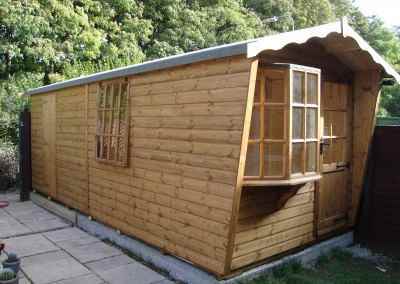 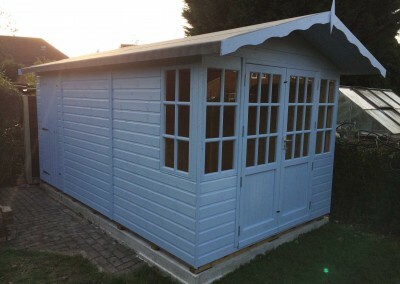 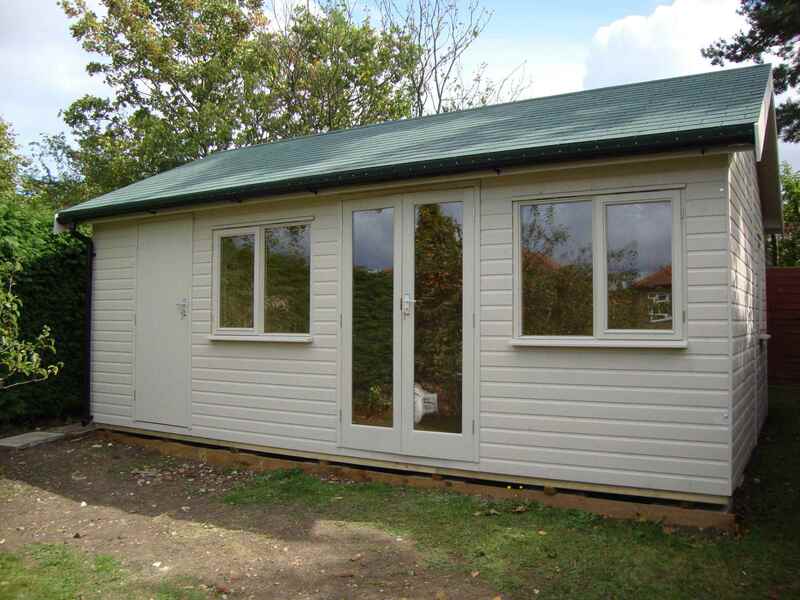 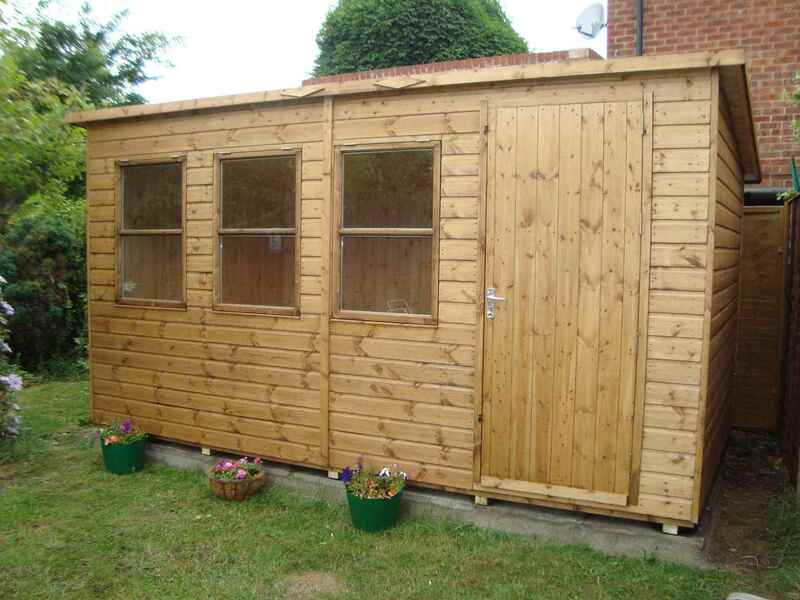 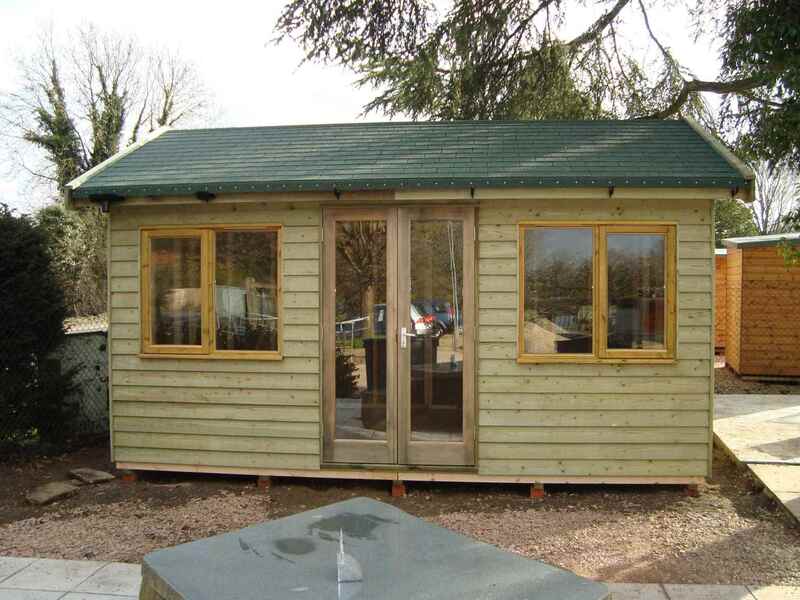 Deluxe Studio 12×10 with Tilford Doors & Windows, Heavy Felt, Guttering and Painted Finish. 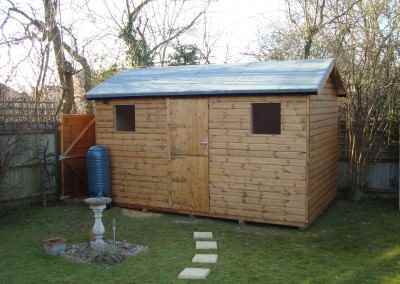 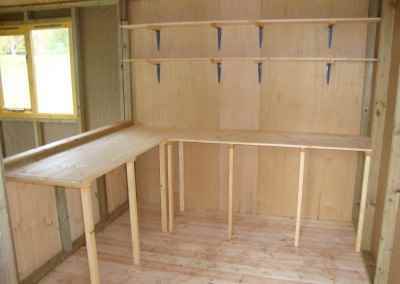 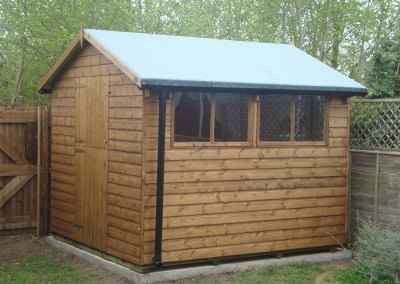 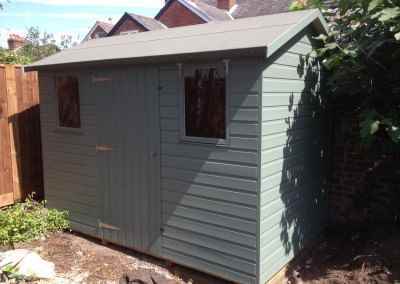 Deluxe Studio 12×10, Heavy Torch-On Felt, Shed Compartment, Guttering, Shades Finish. 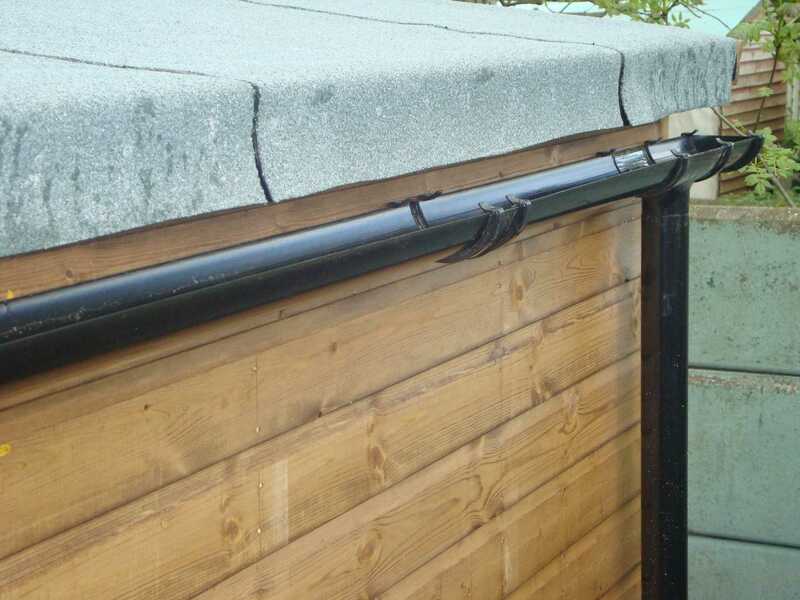 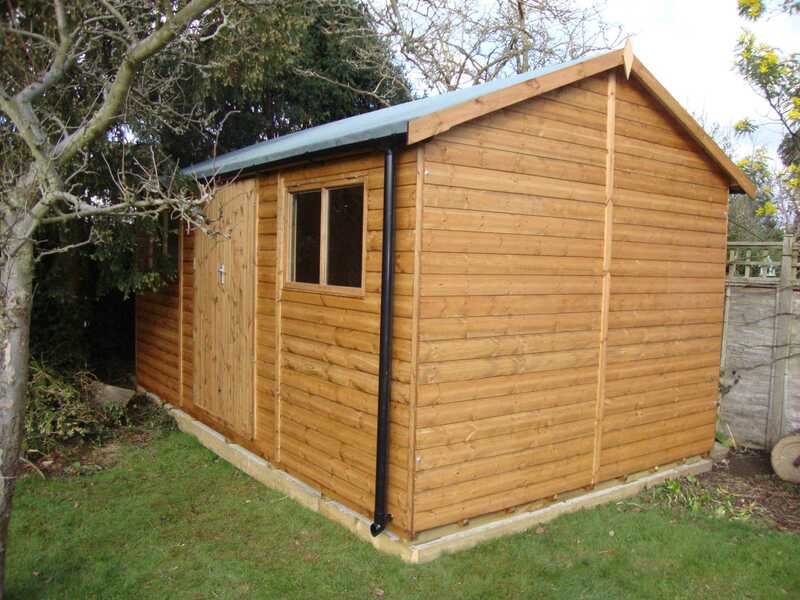 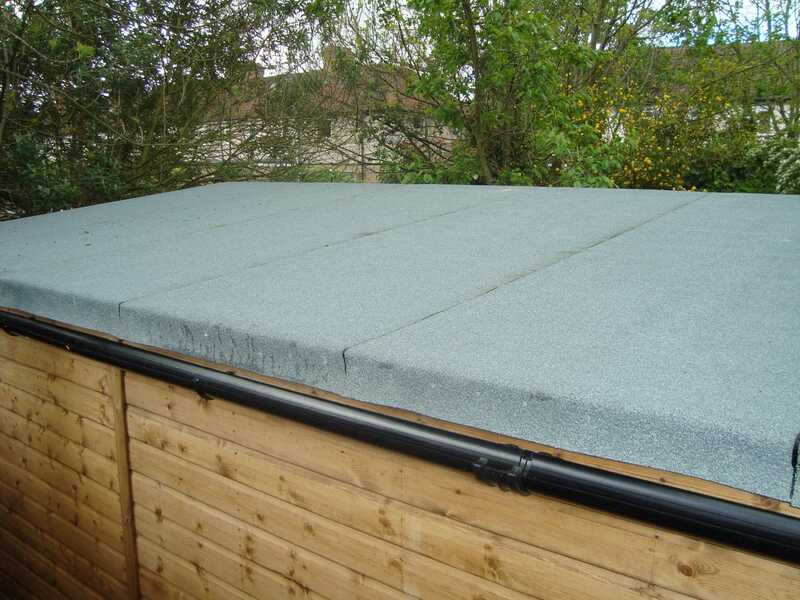 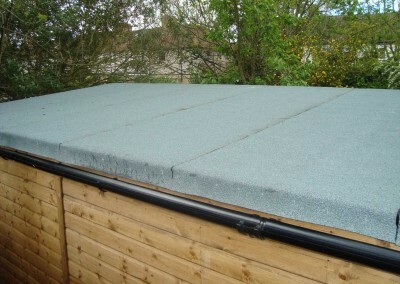 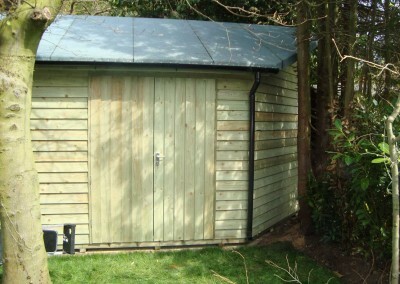 Deluxe Studio 14×12, Gutter & Dowpipe, Heavy Torch-On Felt, T&Gv Lined and Insulated. 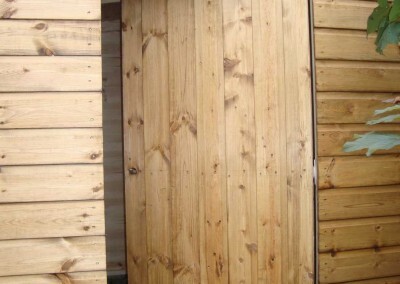 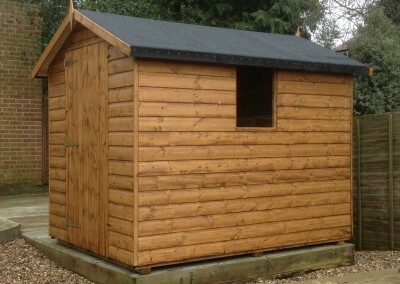 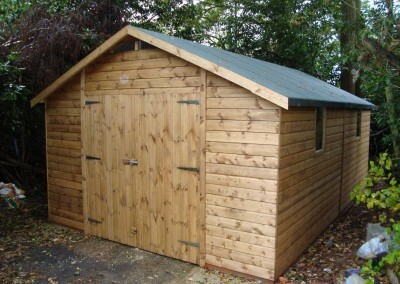 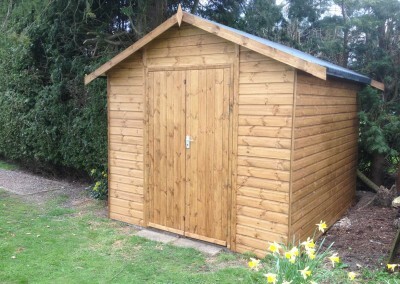 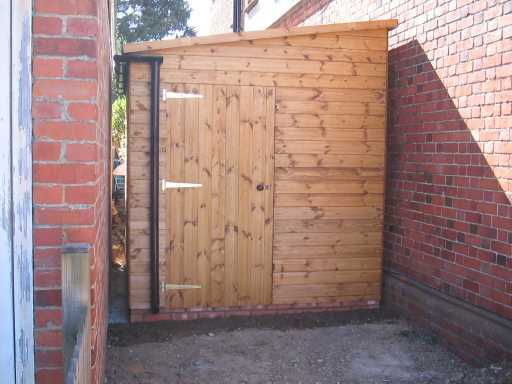 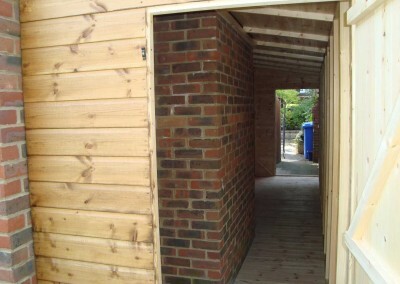 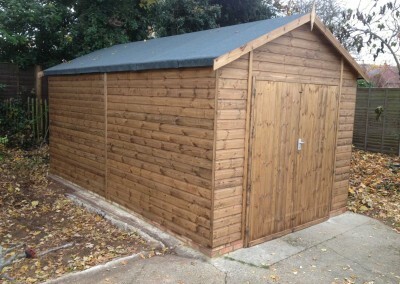 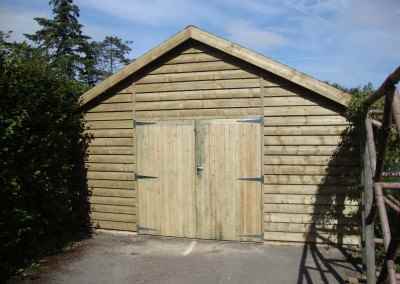 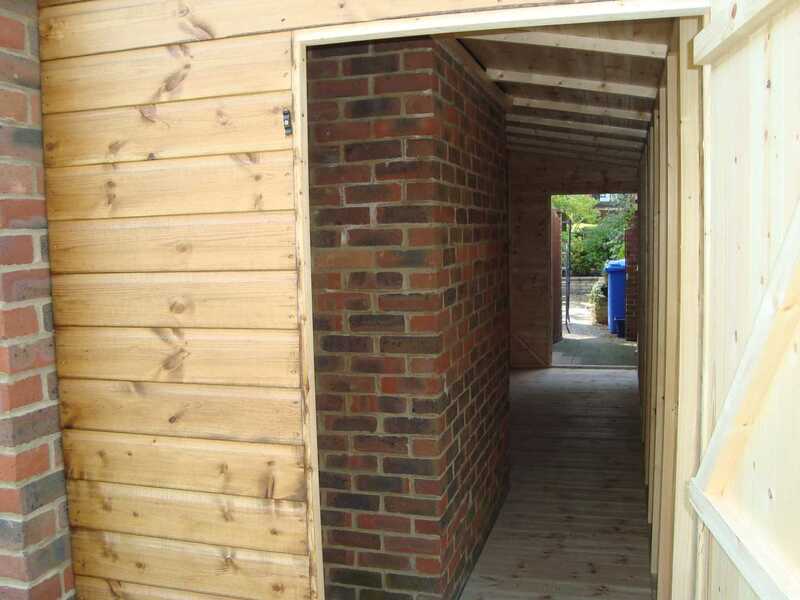 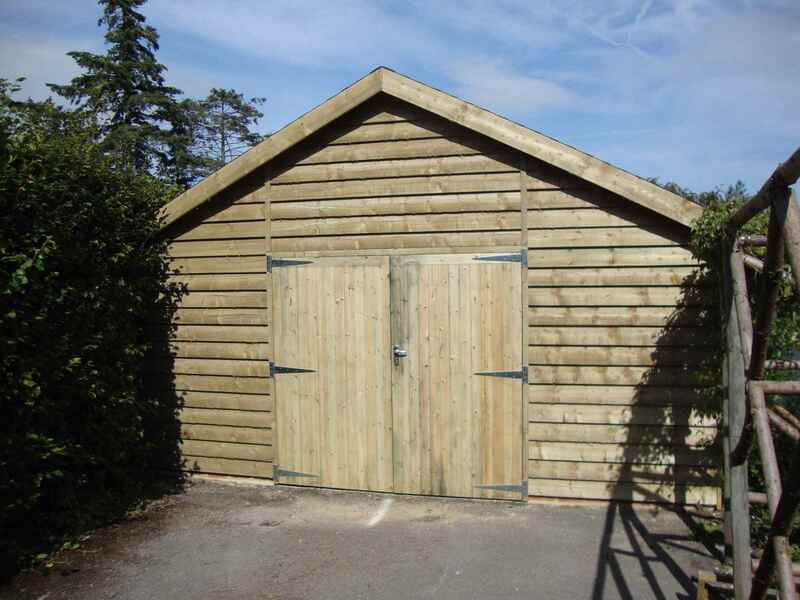 Hampton 10×8 with Log Lap Cladding and Painted Finish. 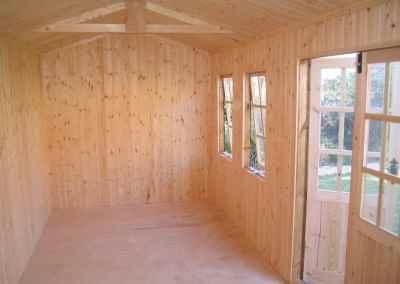 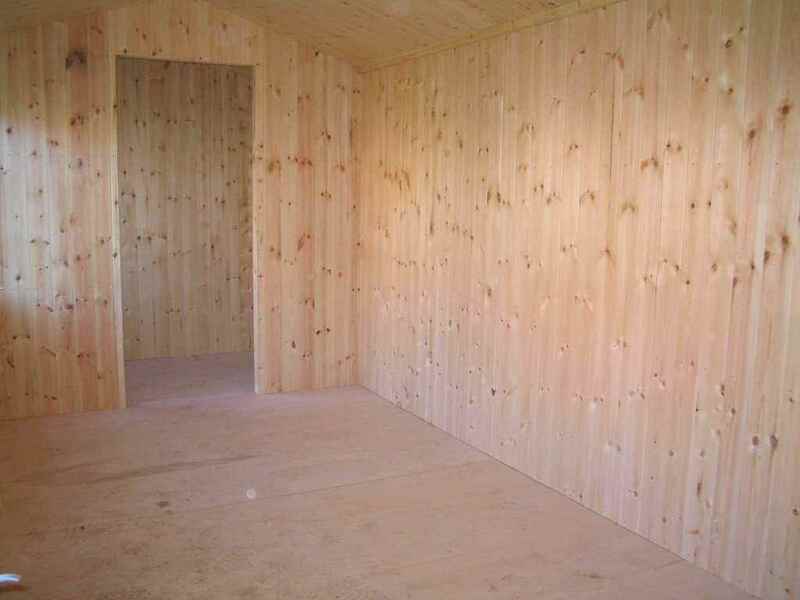 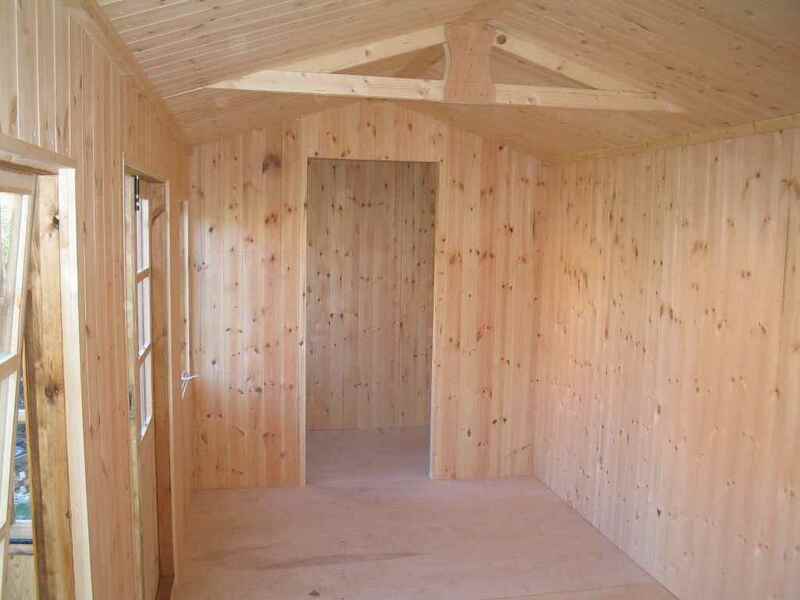 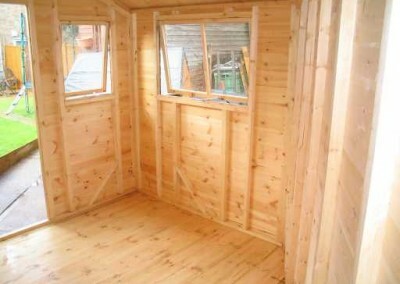 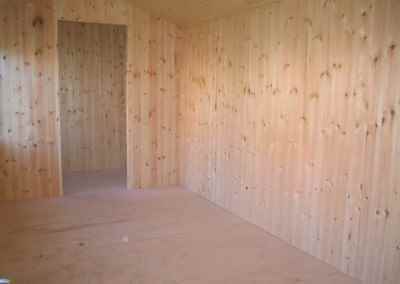 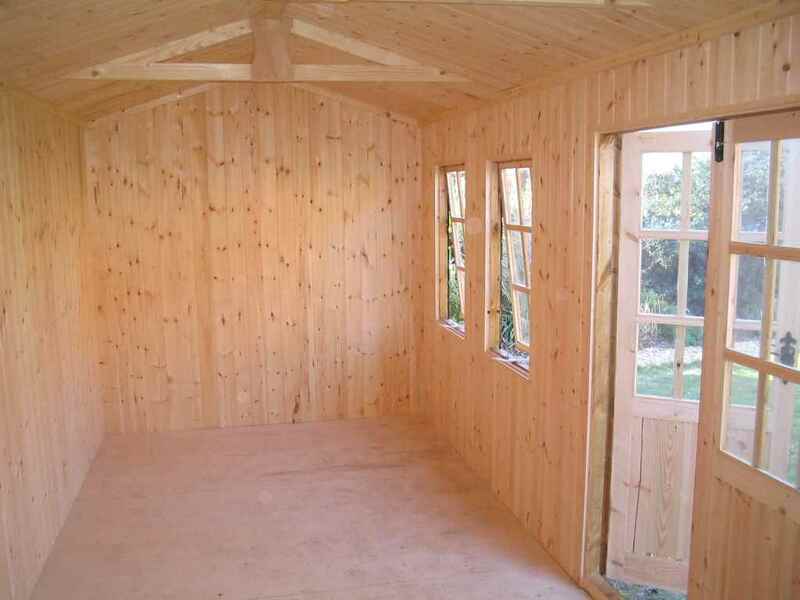 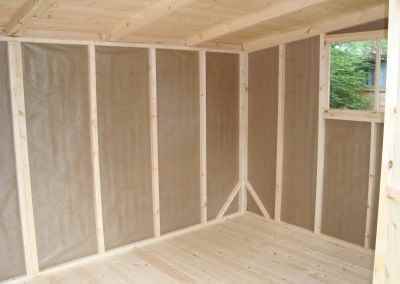 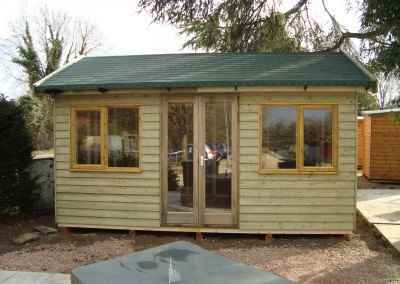 Hampton 12×8, Log-Lap Cladding, Shed Compartment, T&Gv Lined and Insulated, 2 Extra 4 Pane Windows. 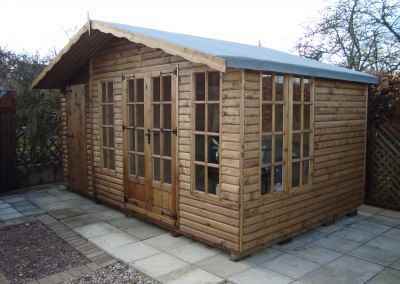 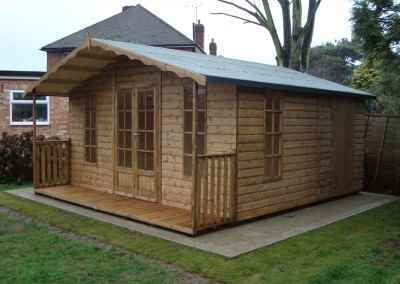 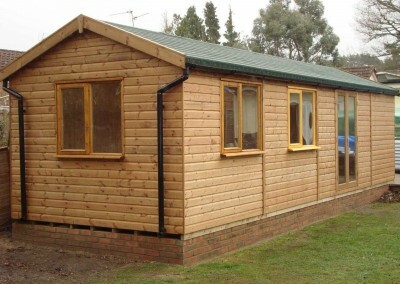 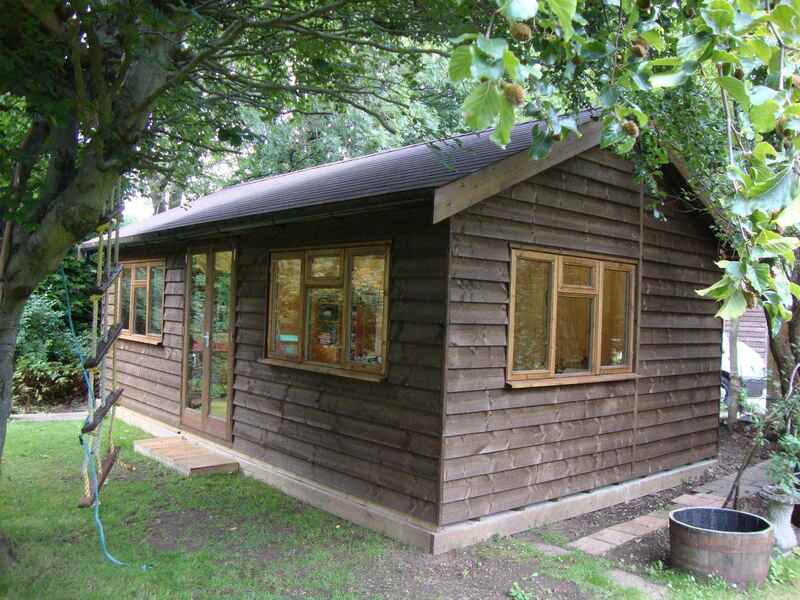 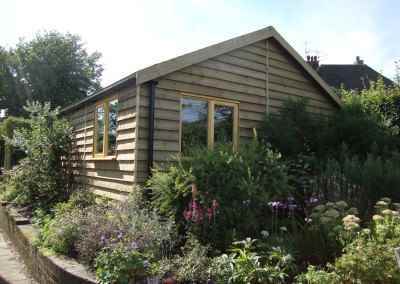 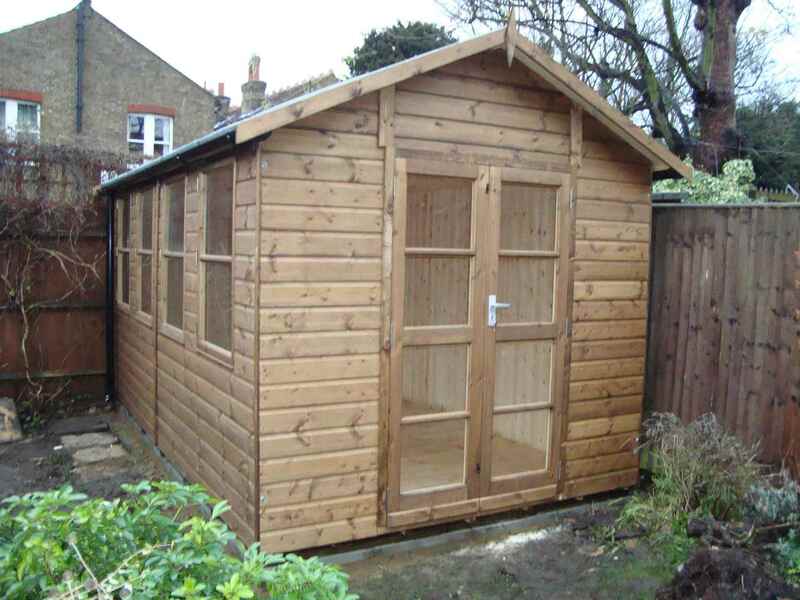 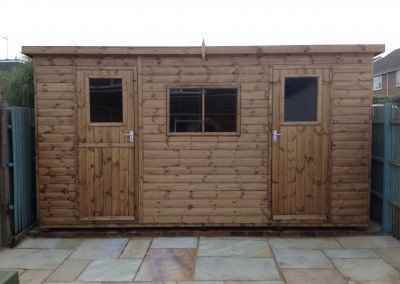 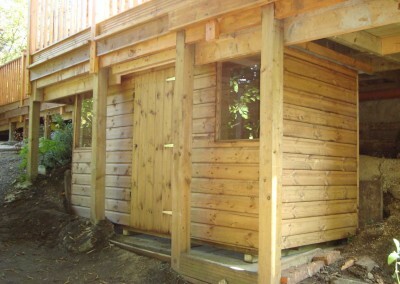 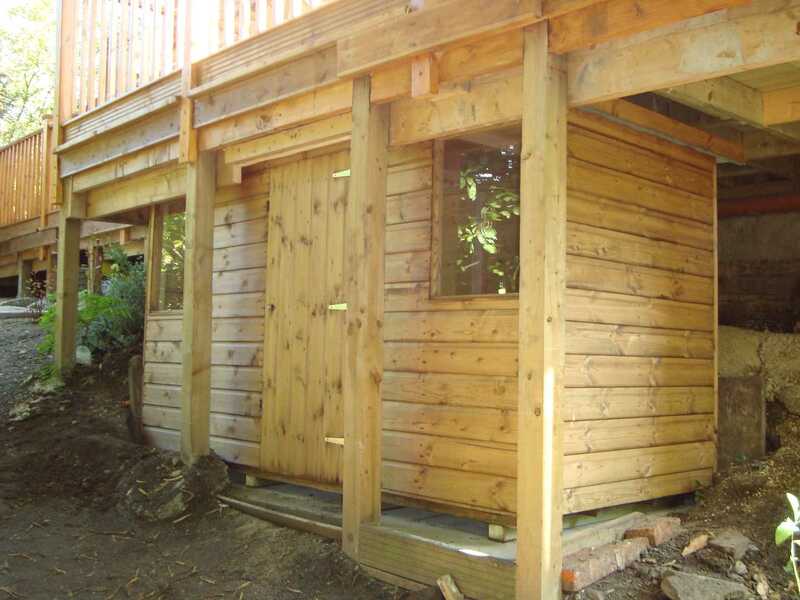 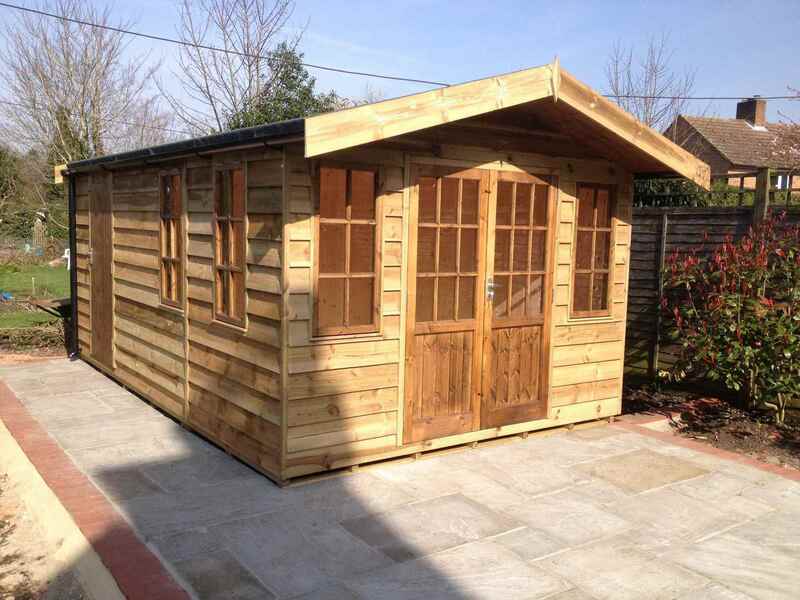 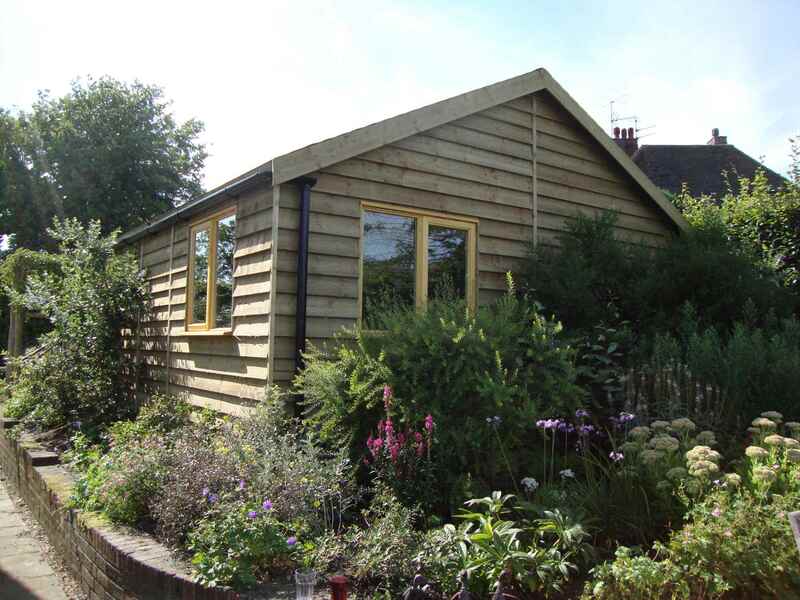 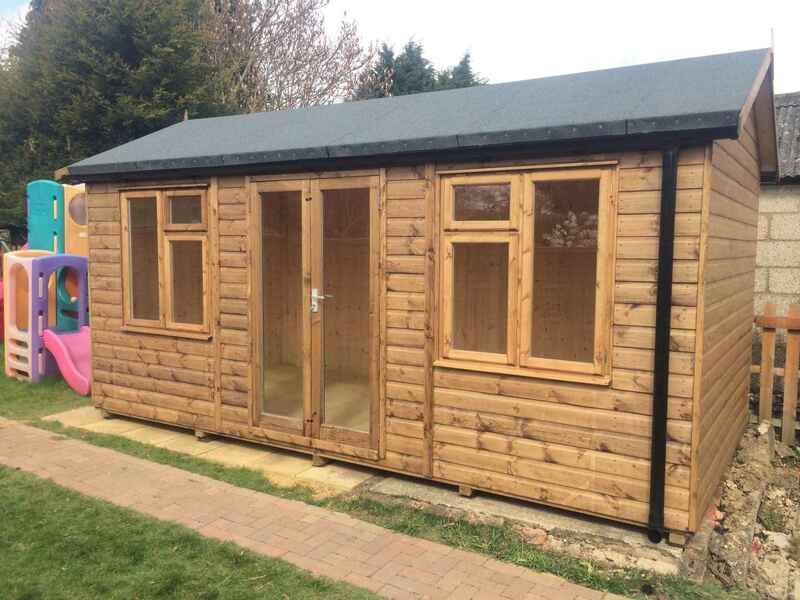 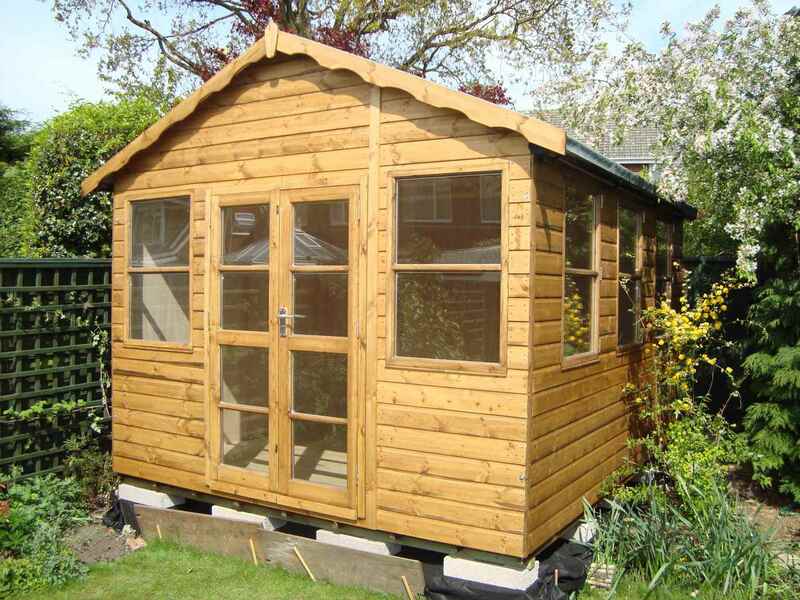 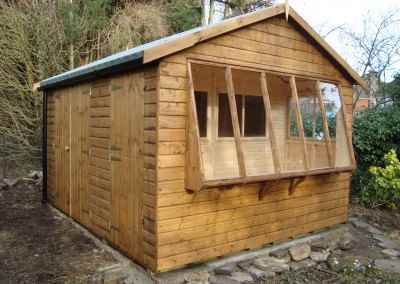 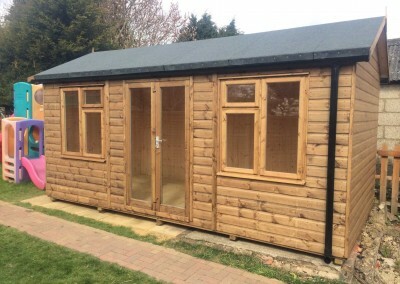 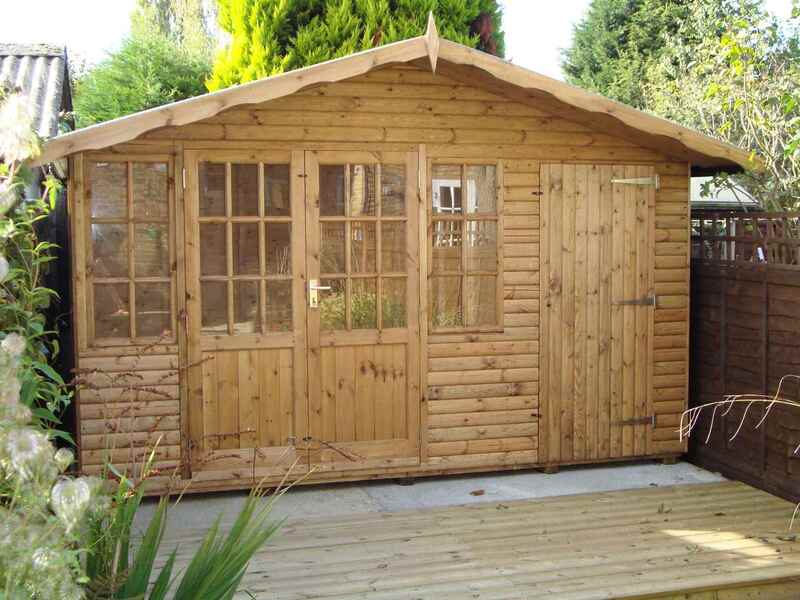 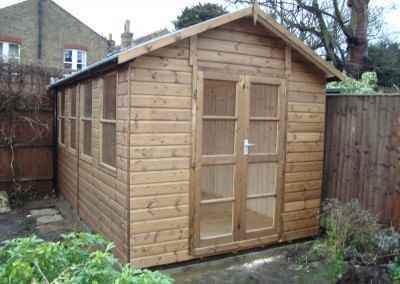 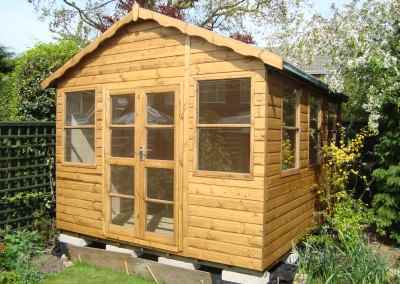 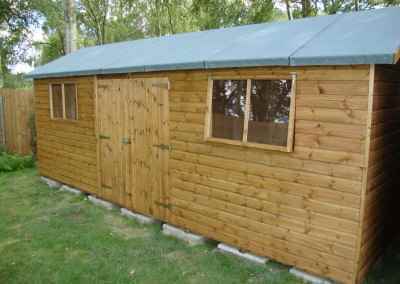 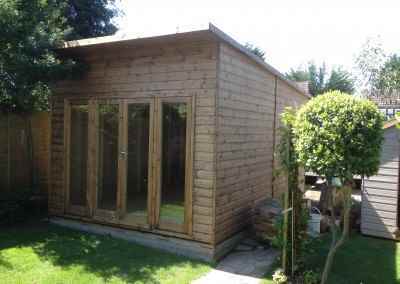 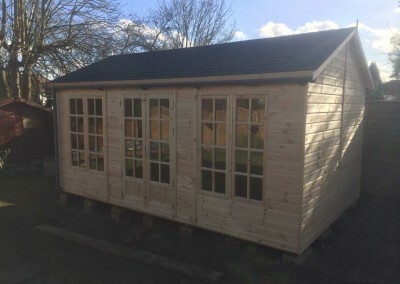 Hampton 14×7, Extra Windows, Log-Lap Cladding, Shades Finish. 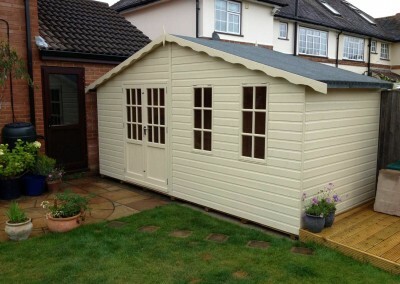 Hampton 17×6 with Seperate Shed Compartment and Tiled Roof. 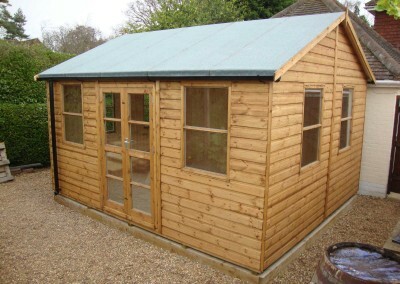 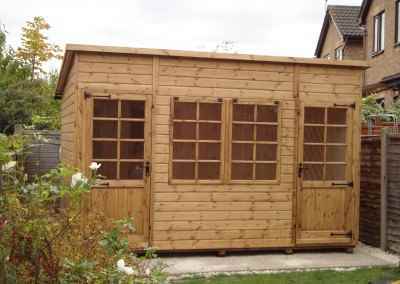 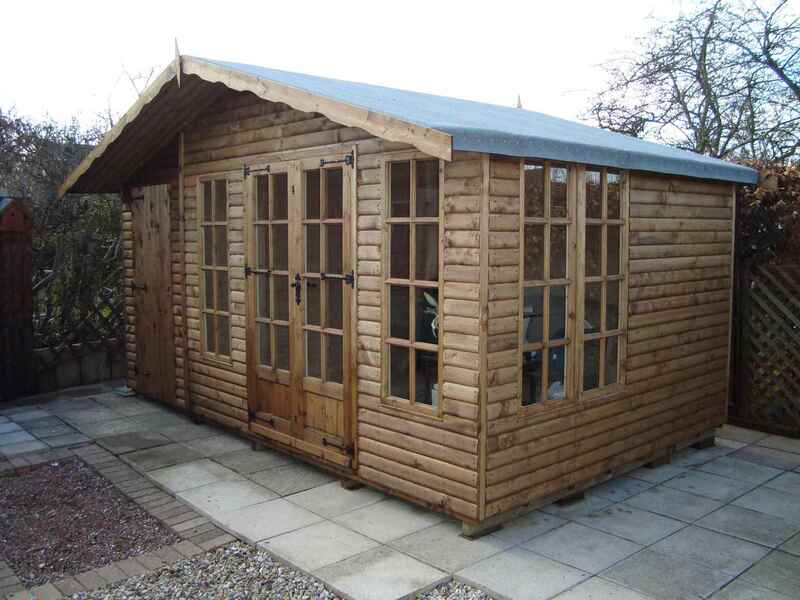 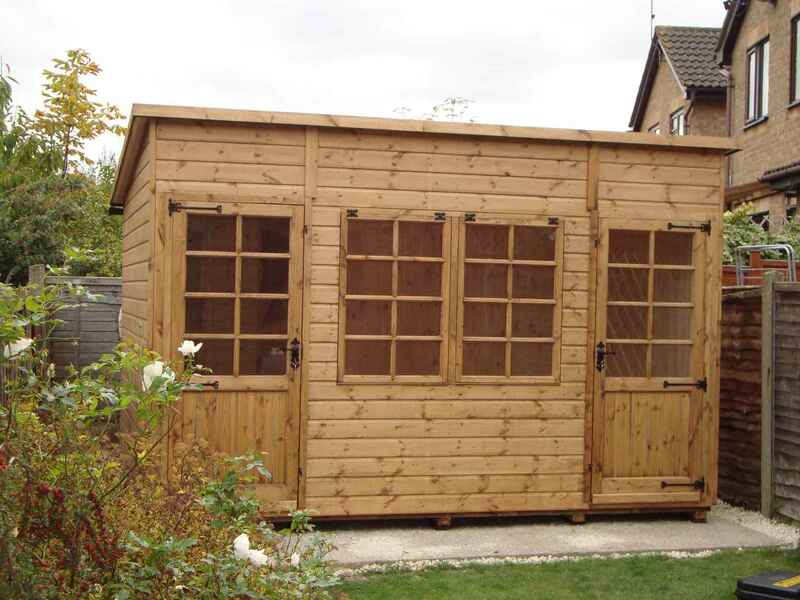 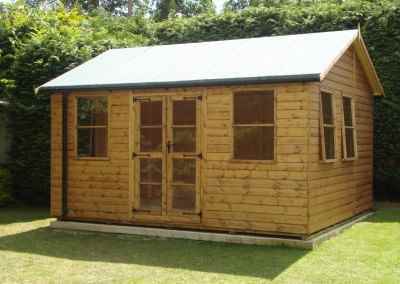 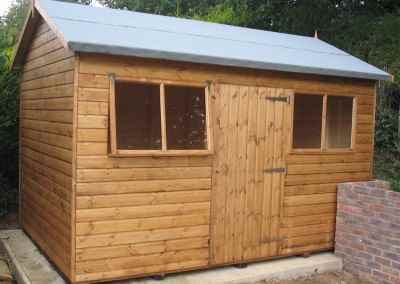 Deluxe Studio 12×8, Heavy Torch-On Felt, Gutter & Downpipes, Double Glazing, T&GV Lined and Insulated, Shades Finish. 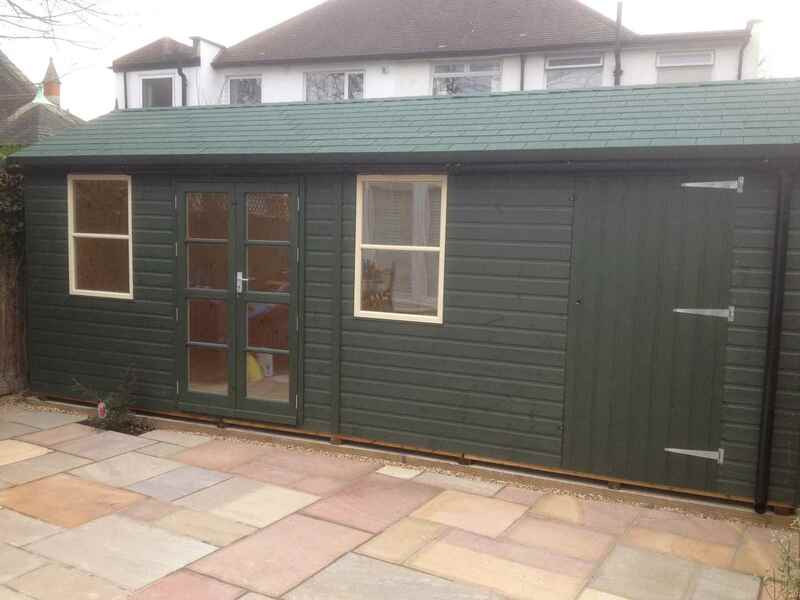 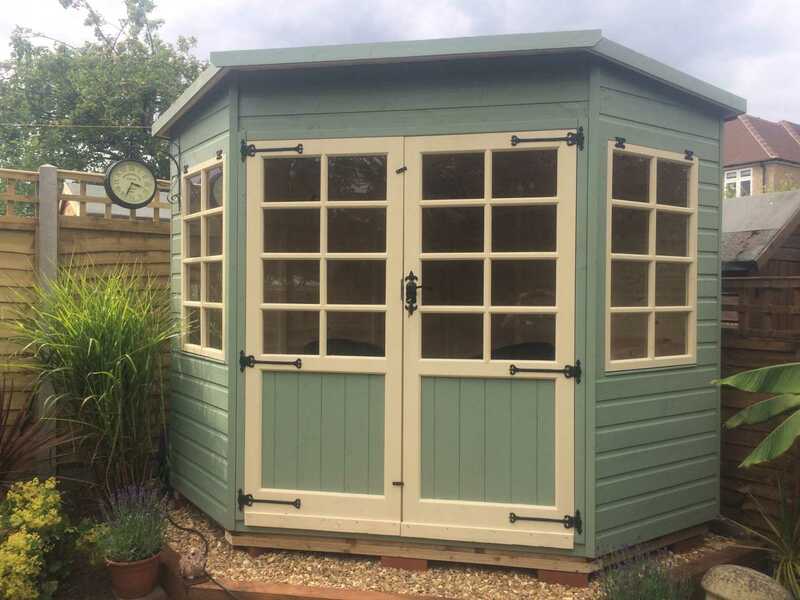 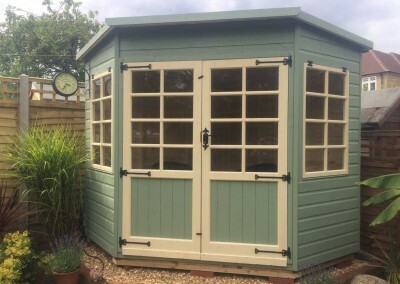 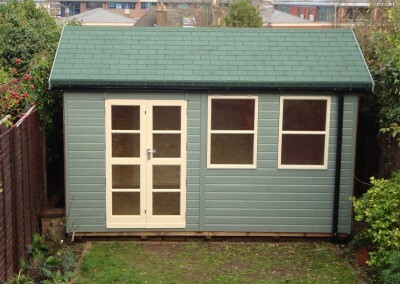 Deluxe Studio 14×8, Double Glazed, Shed Compartment, Green Felt Tiles, Shades Finish. 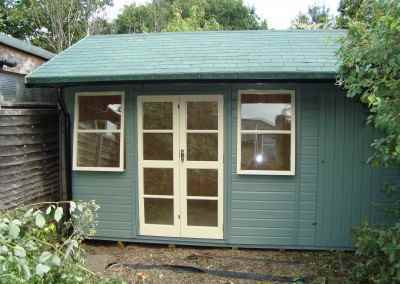 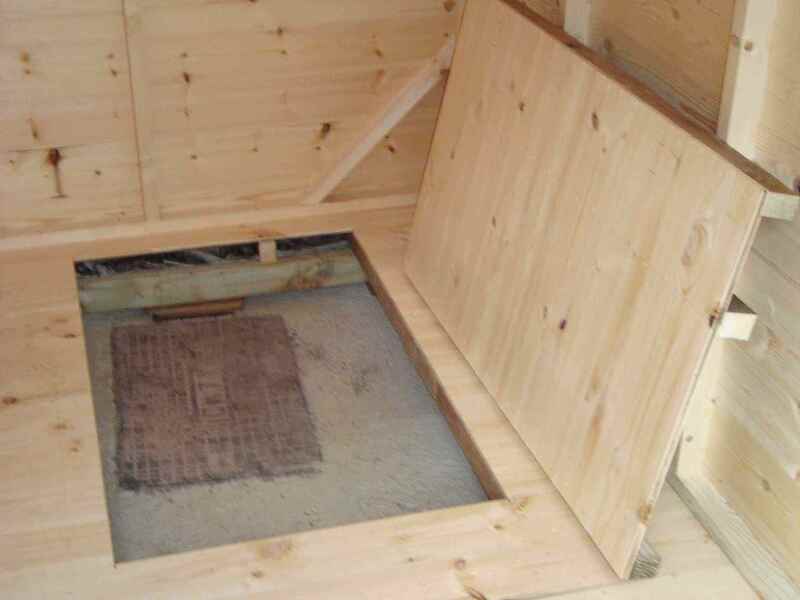 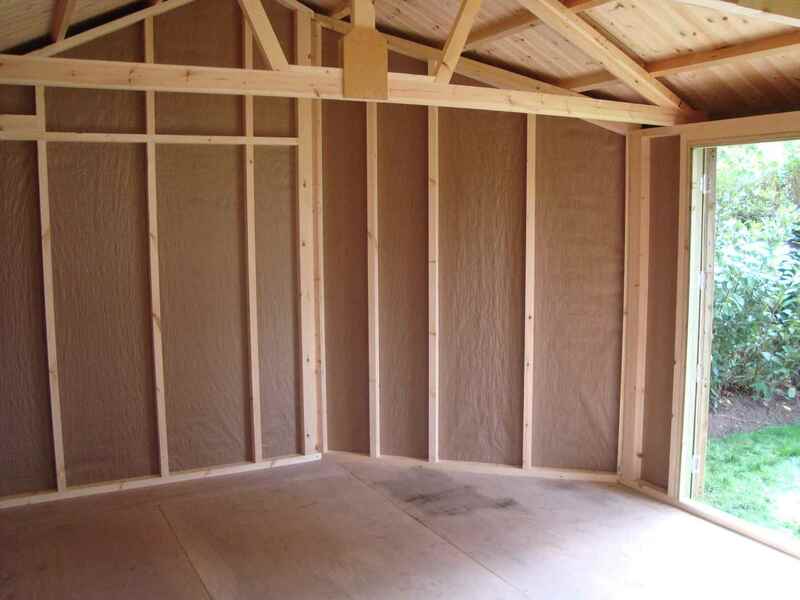 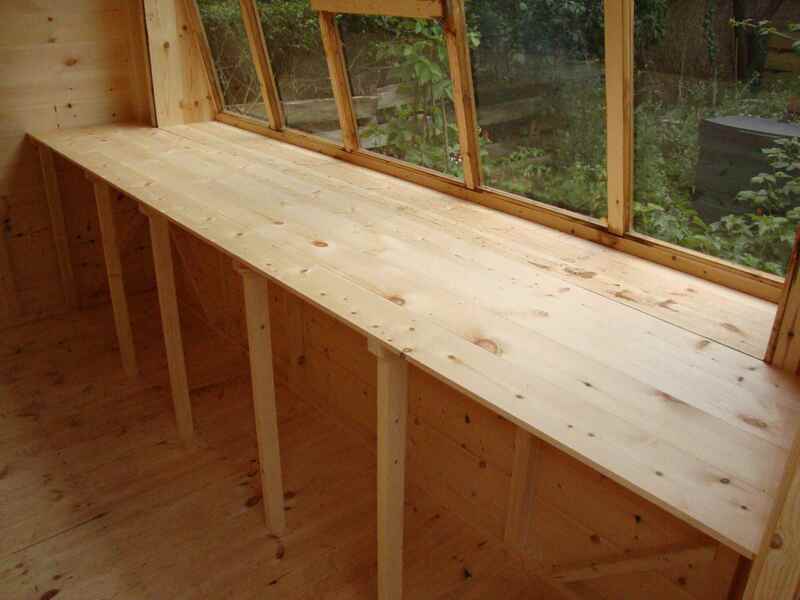 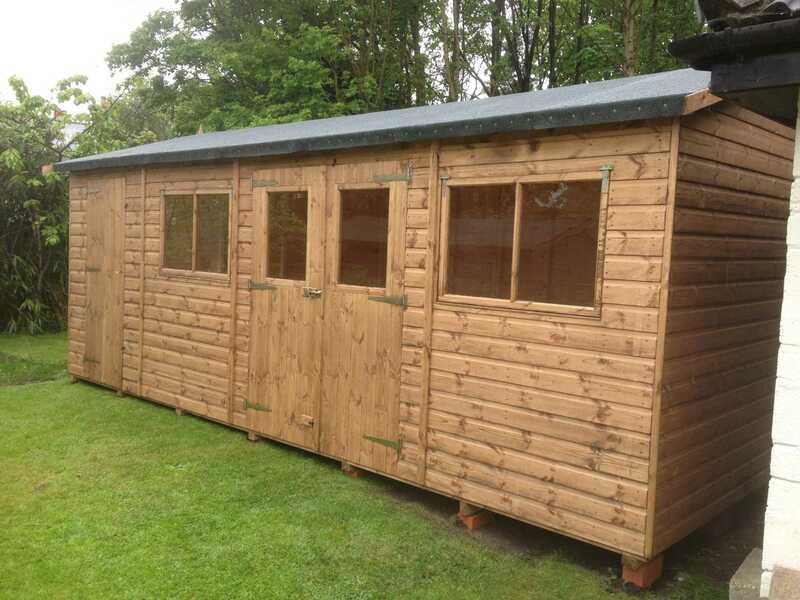 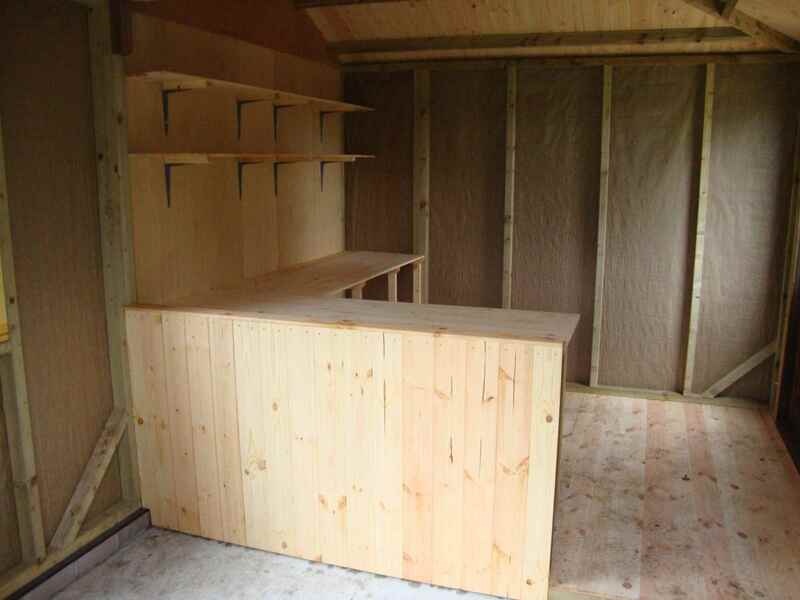 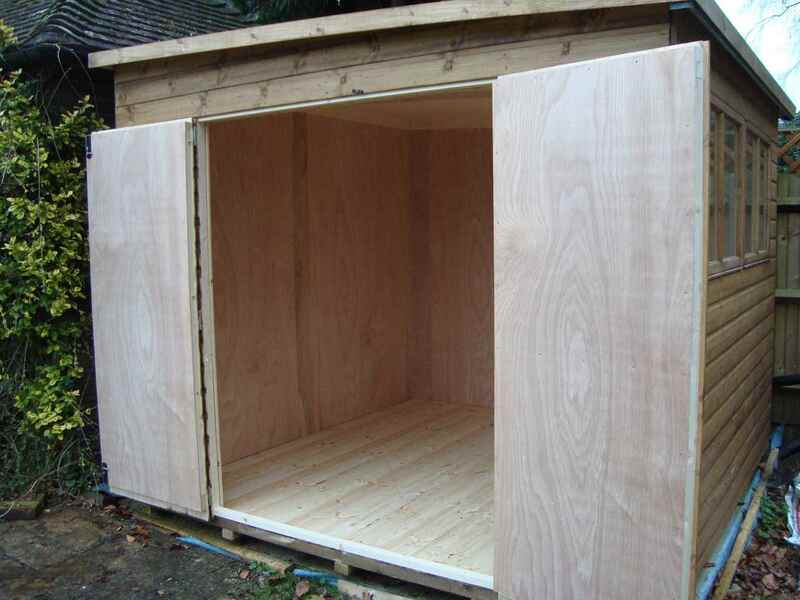 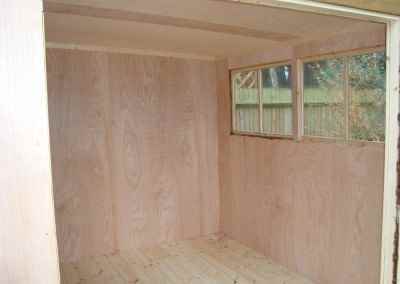 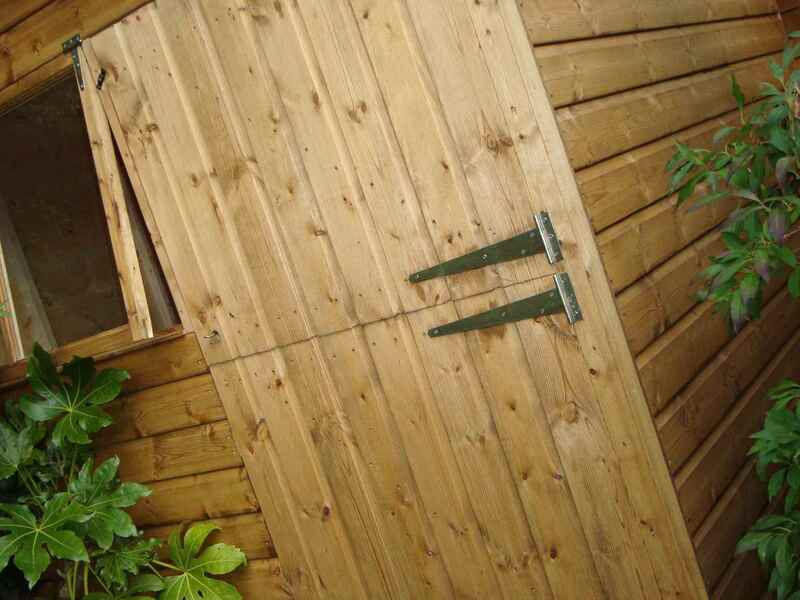 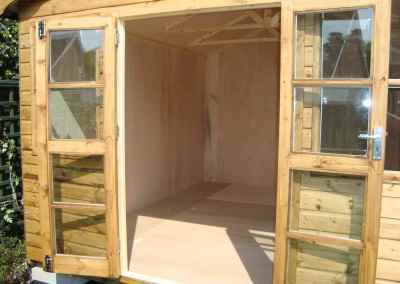 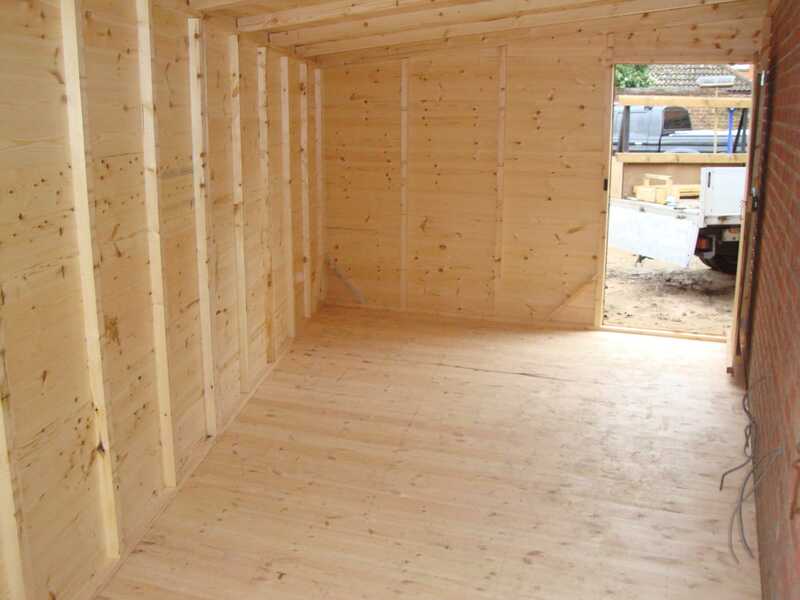 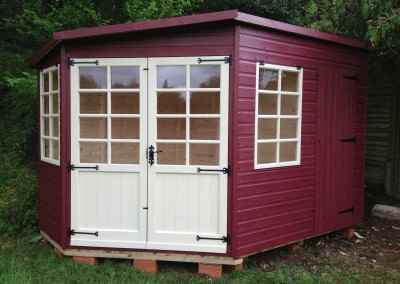 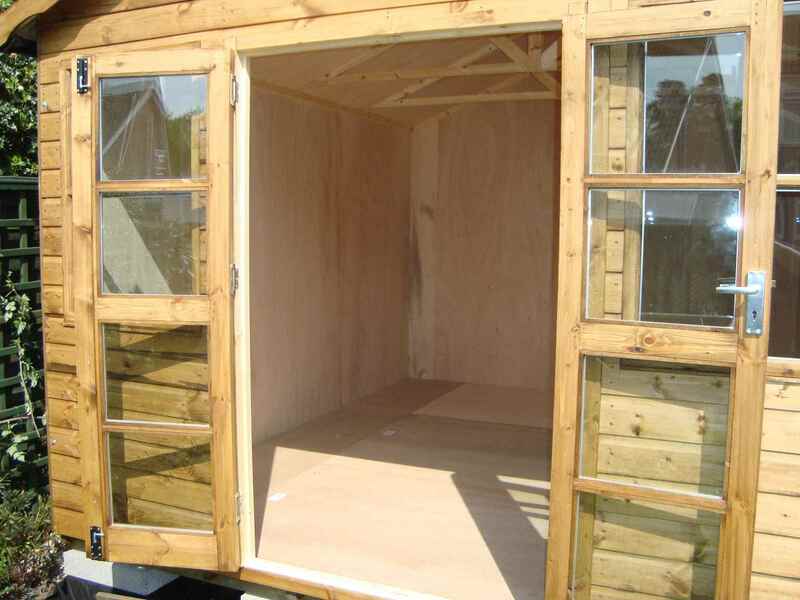 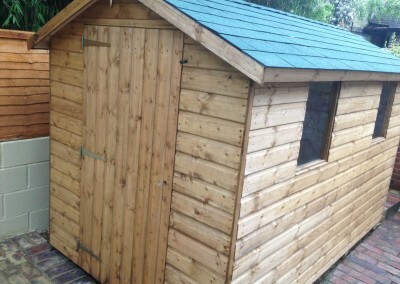 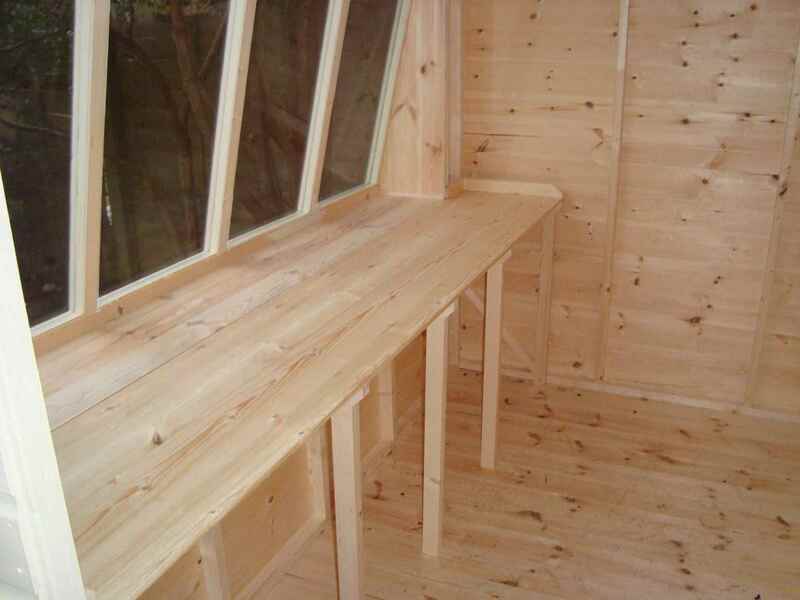 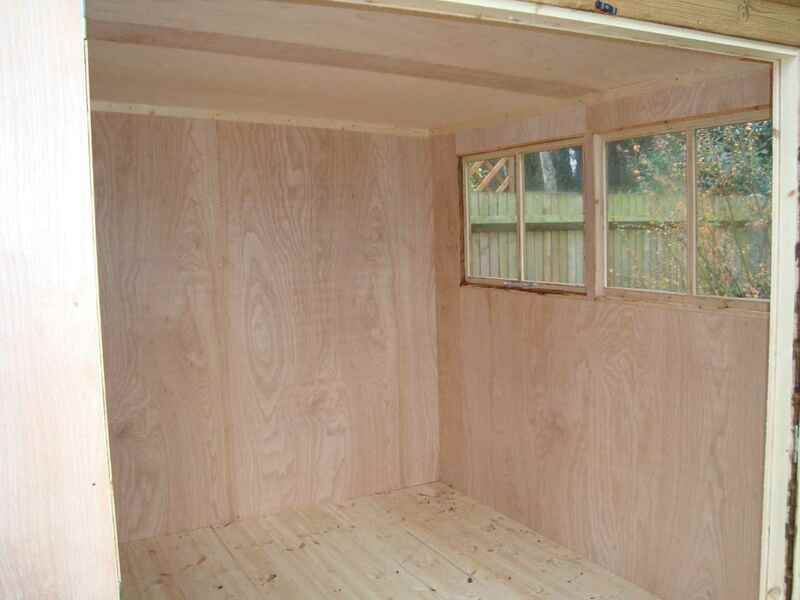 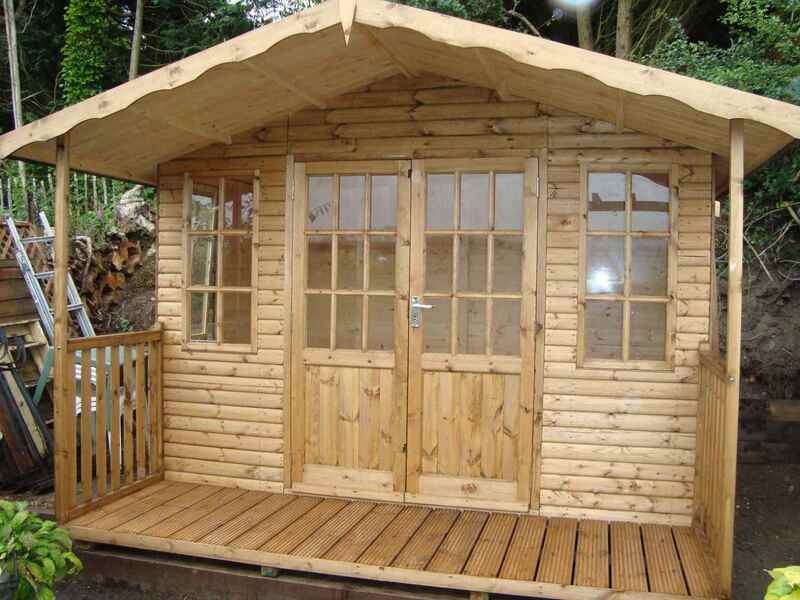 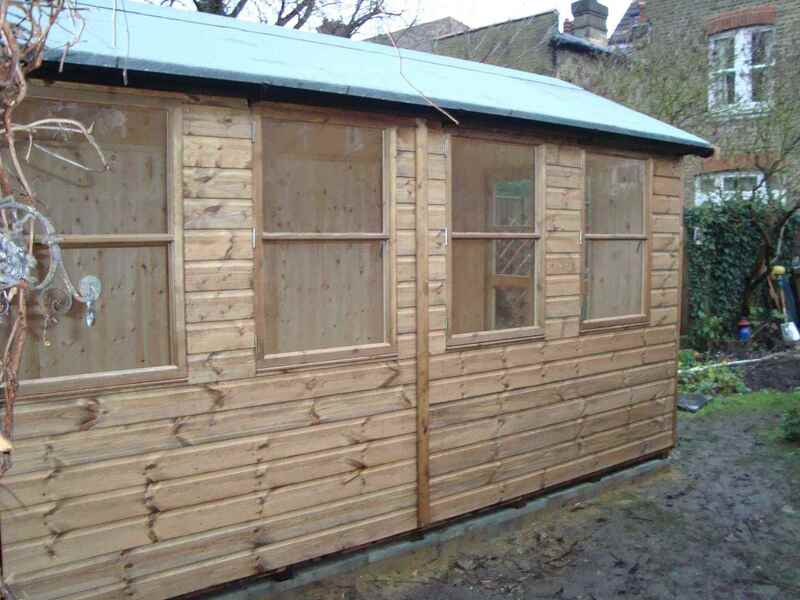 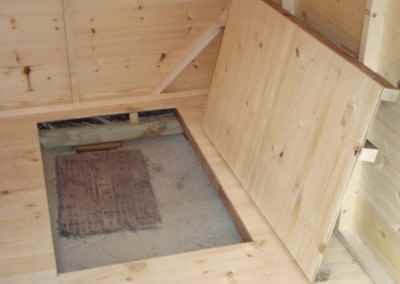 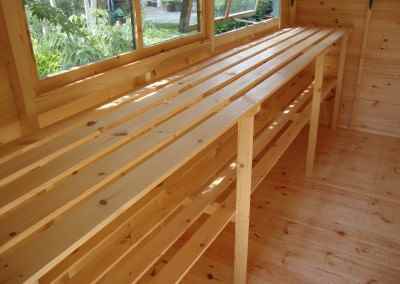 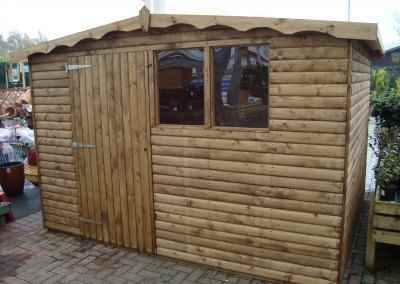 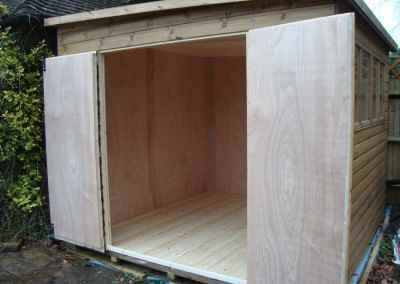 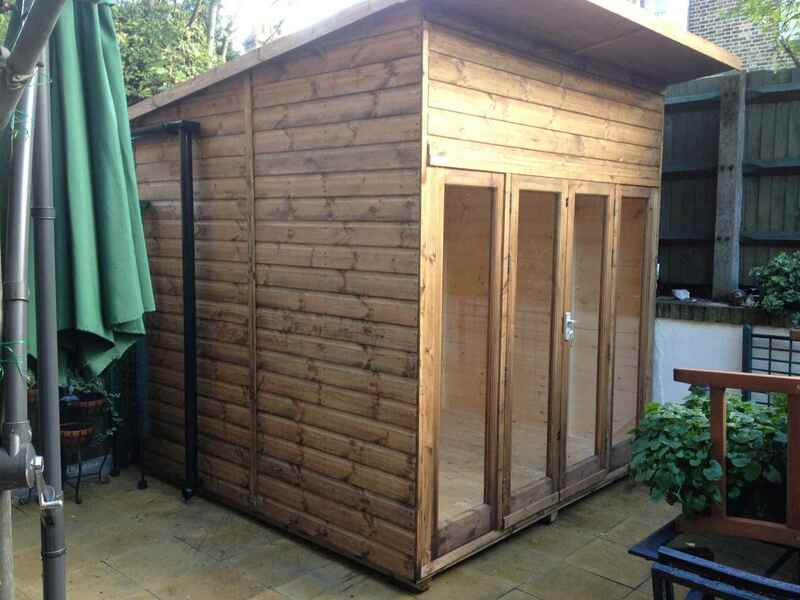 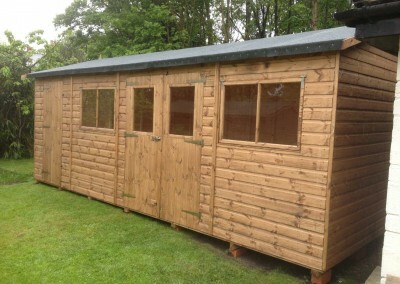 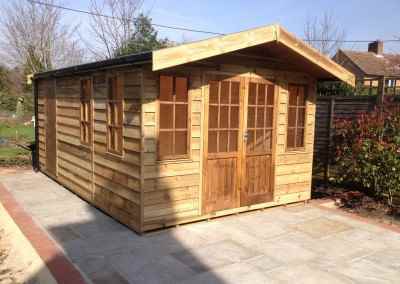 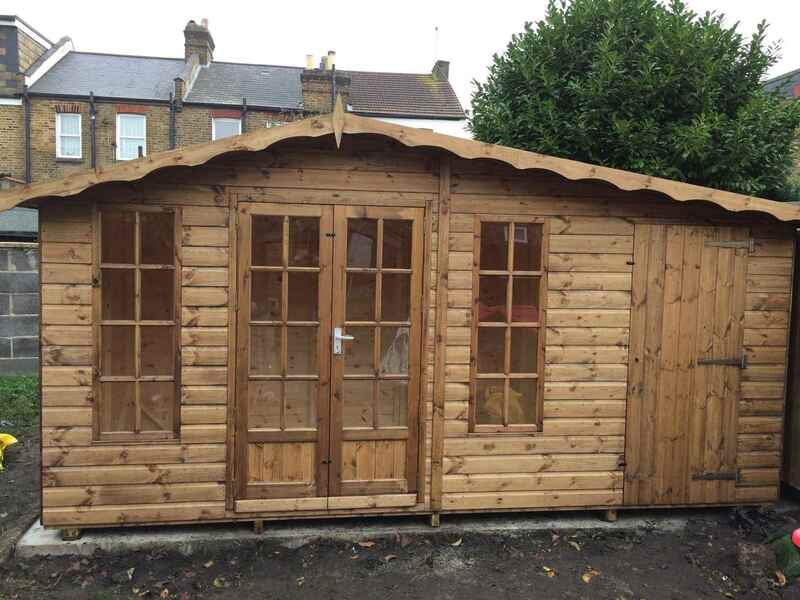 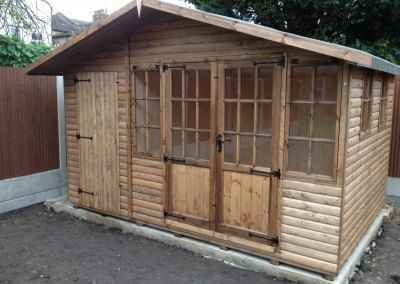 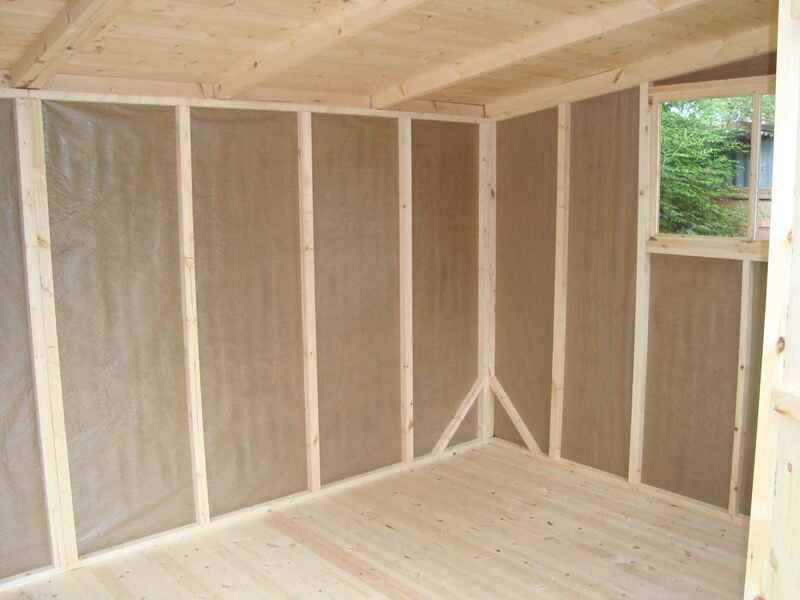 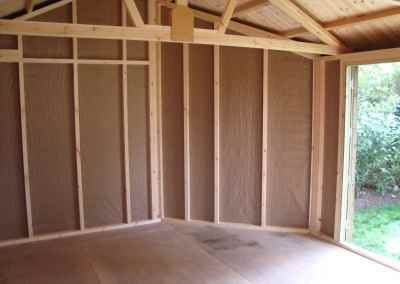 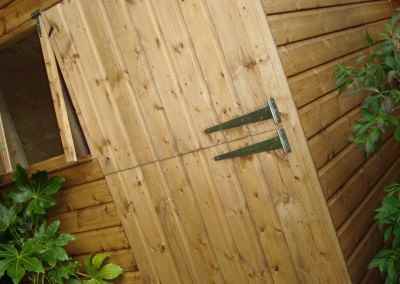 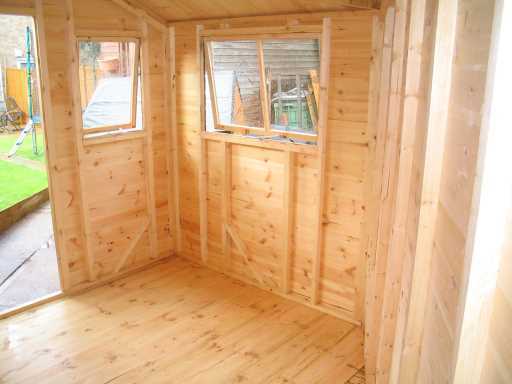 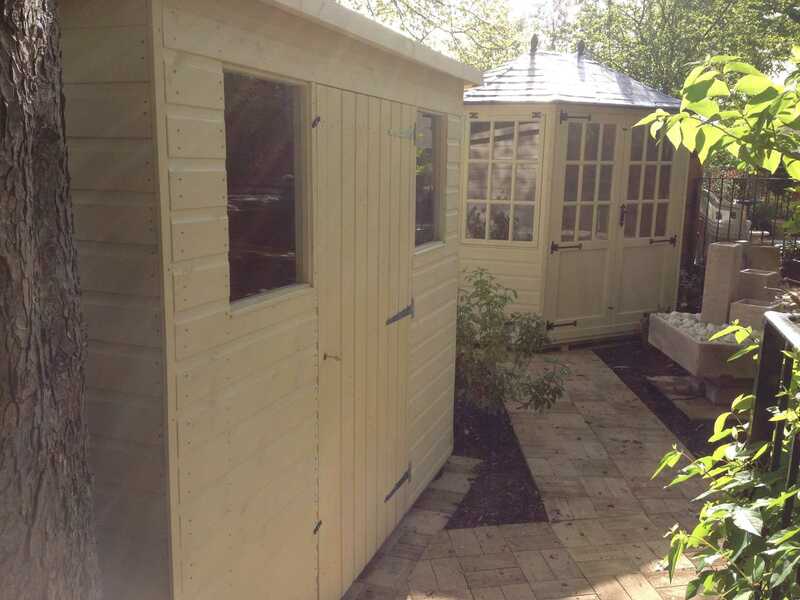 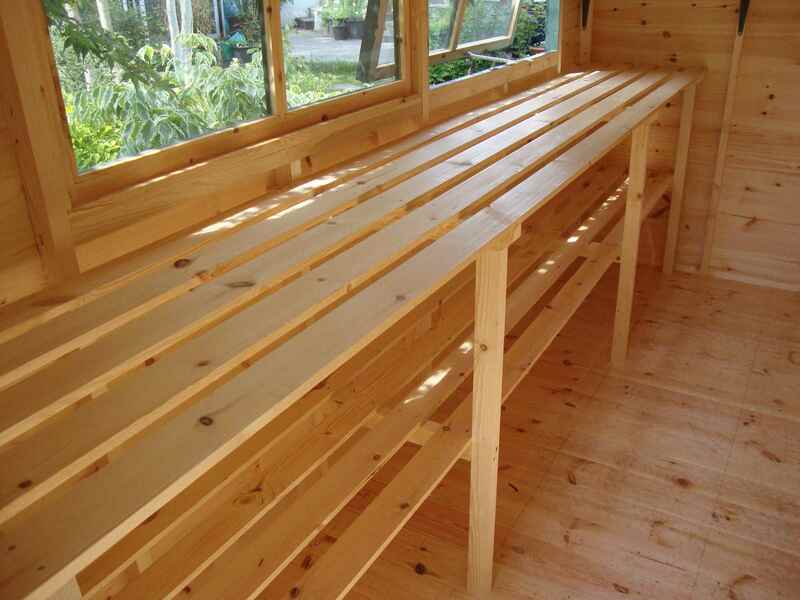 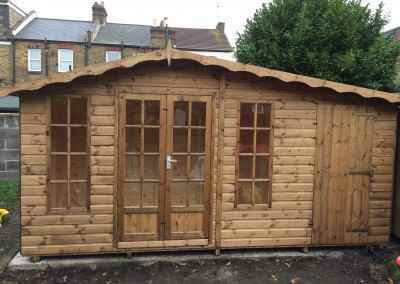 Deluxe Studio 14×10, Double Glazed, 6mm Ply Lining & Insulation, Shaped Barge Boards. 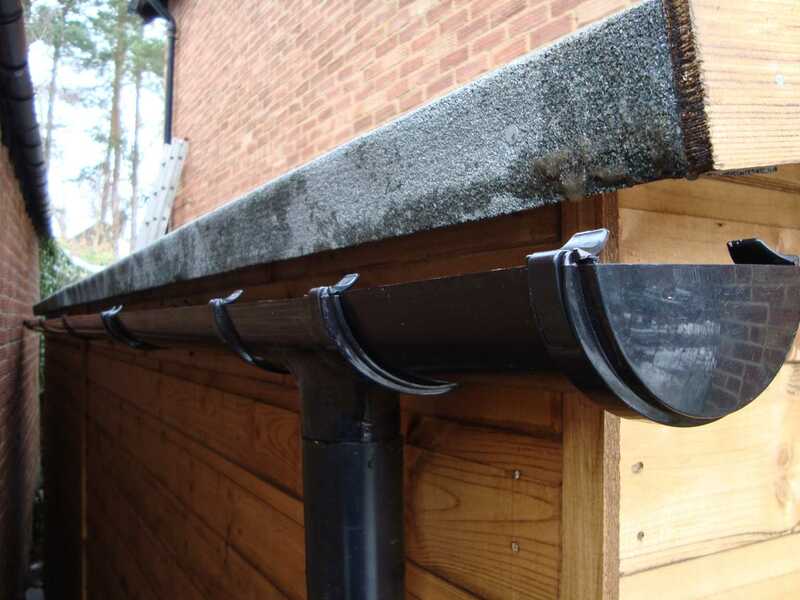 Ascot 8×8, Extra Height, Gutter & Downpipes. 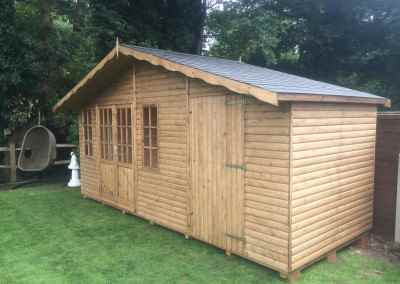 Petersham 12×10, T&Gv Lined and Insulated, Heavy Torch-On Felt, Extra Height, Gutter & Downpipe, Both Windows on Same Side, Shades Finish. 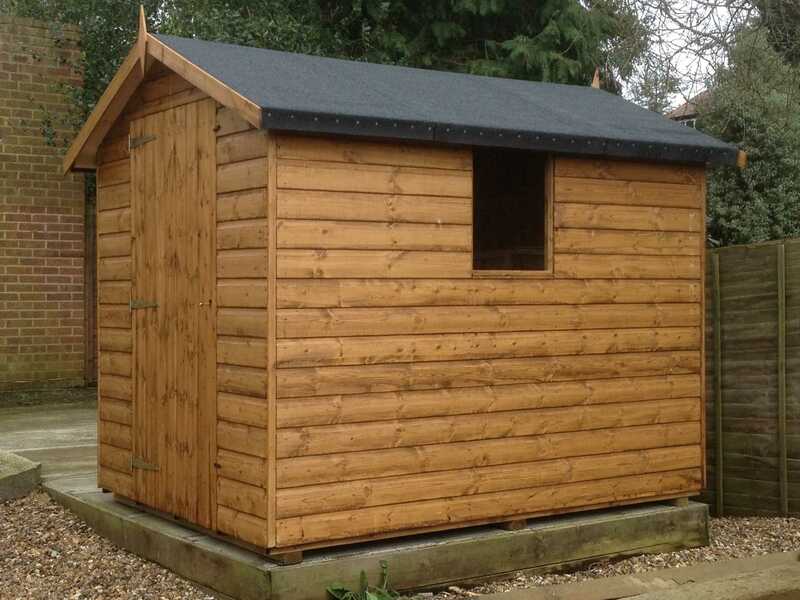 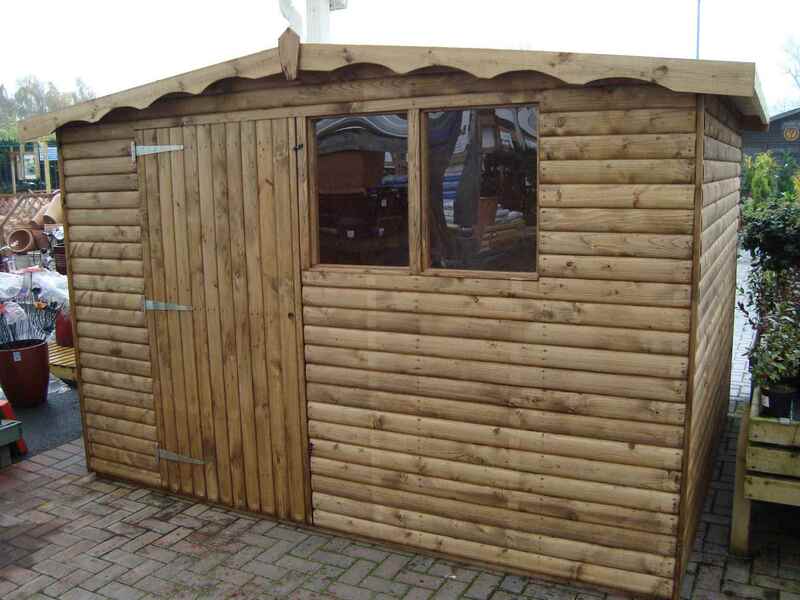 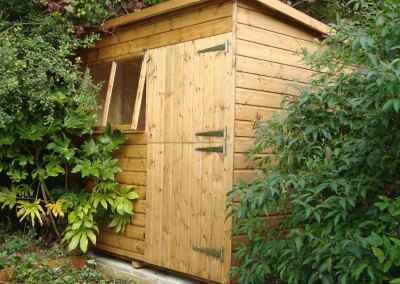 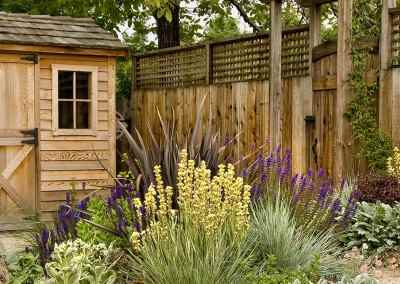 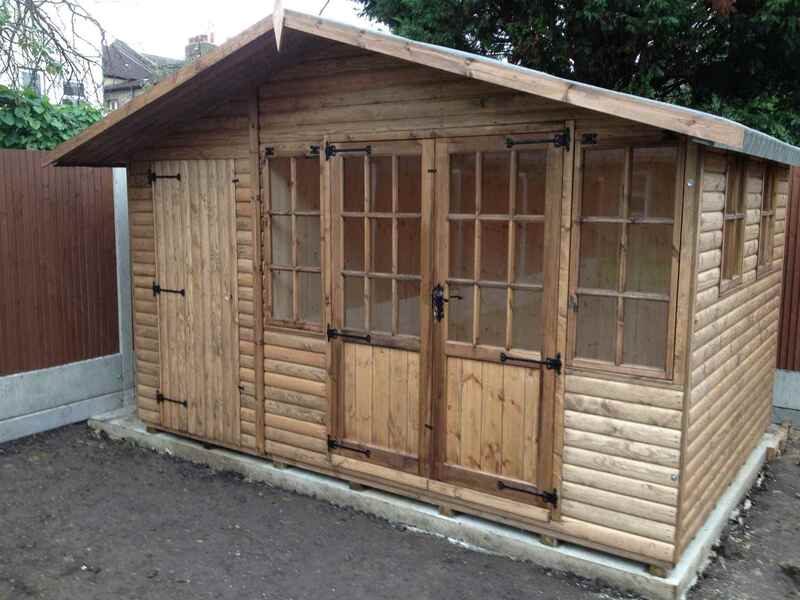 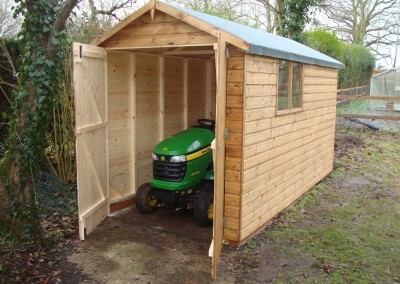 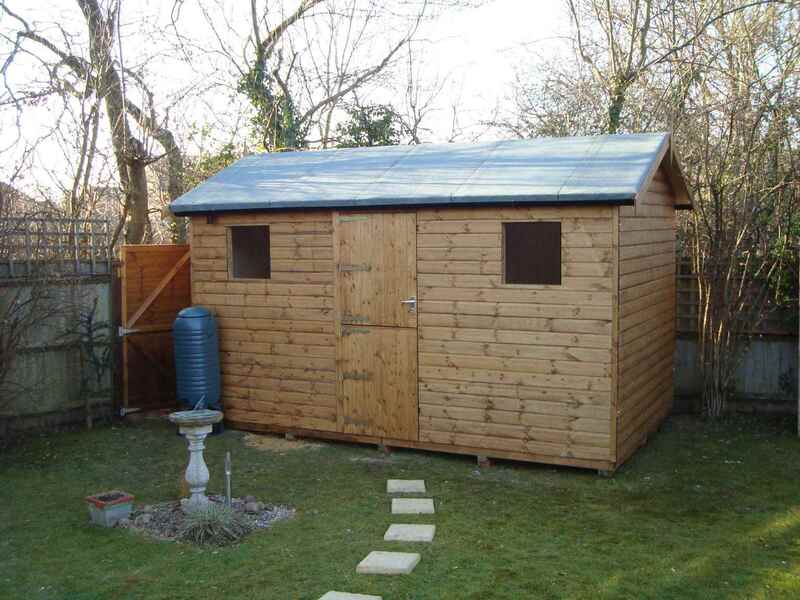 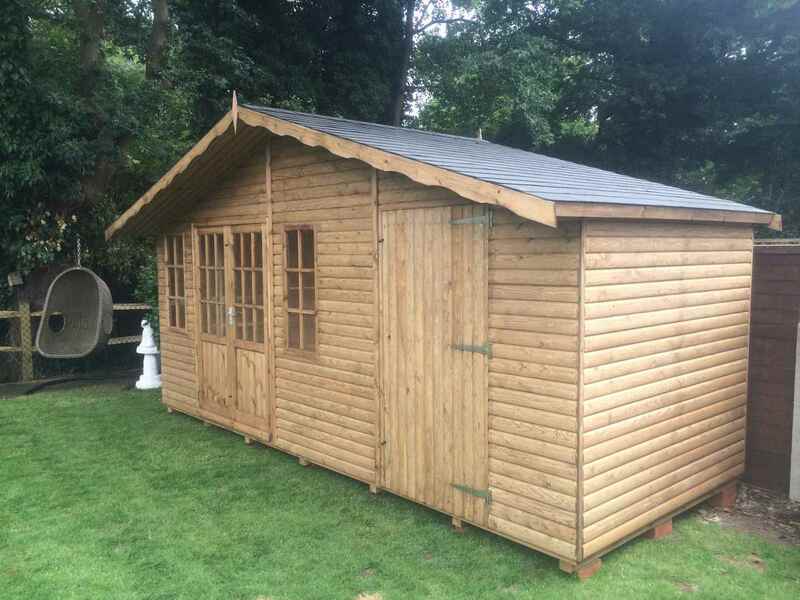 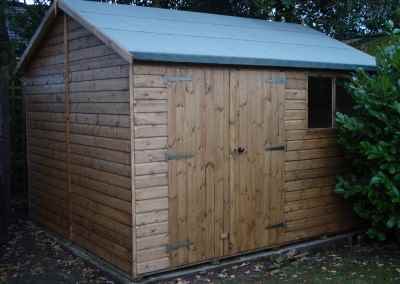 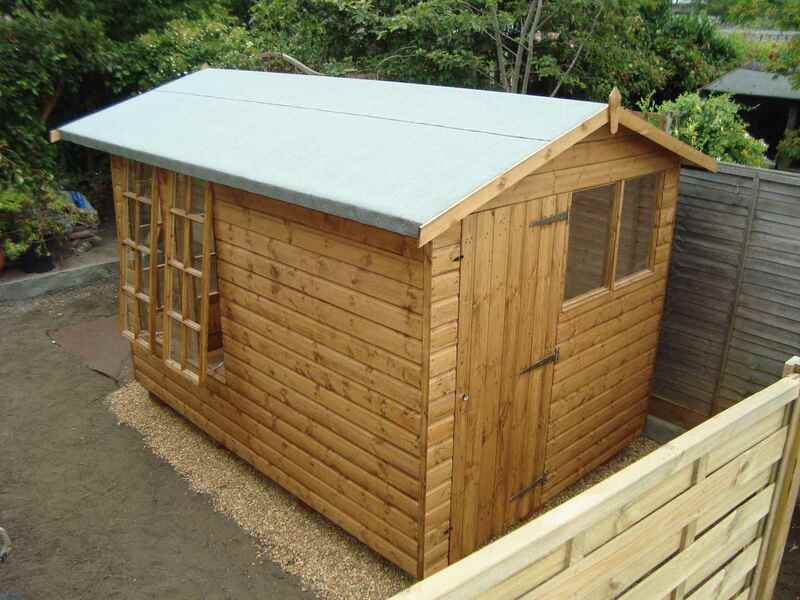 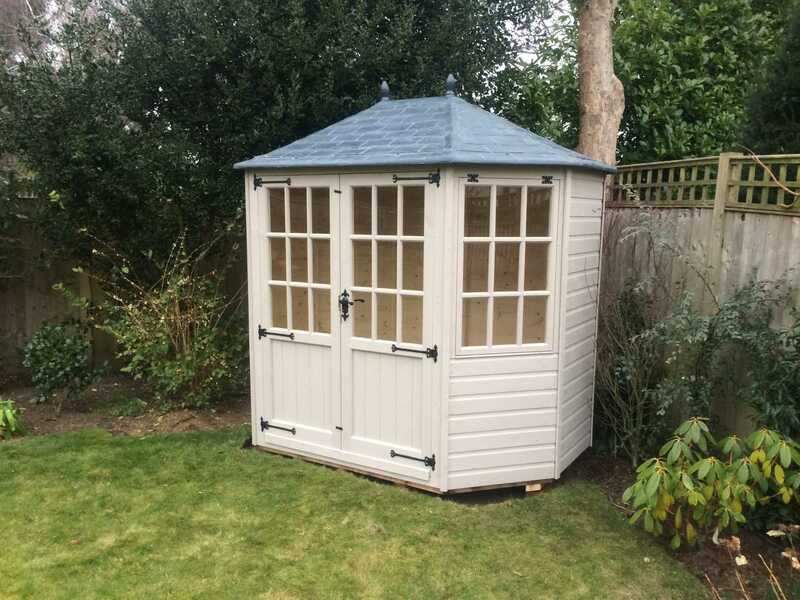 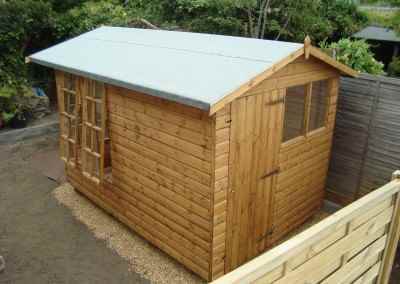 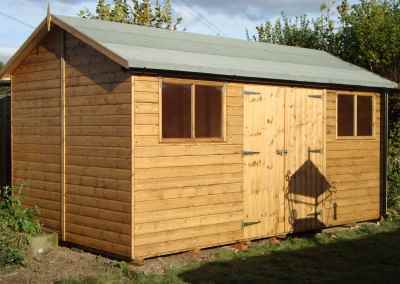 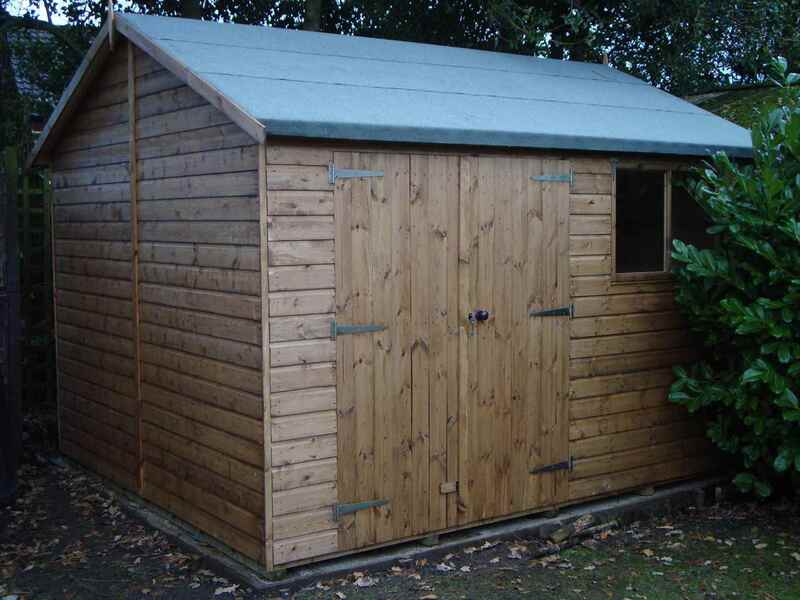 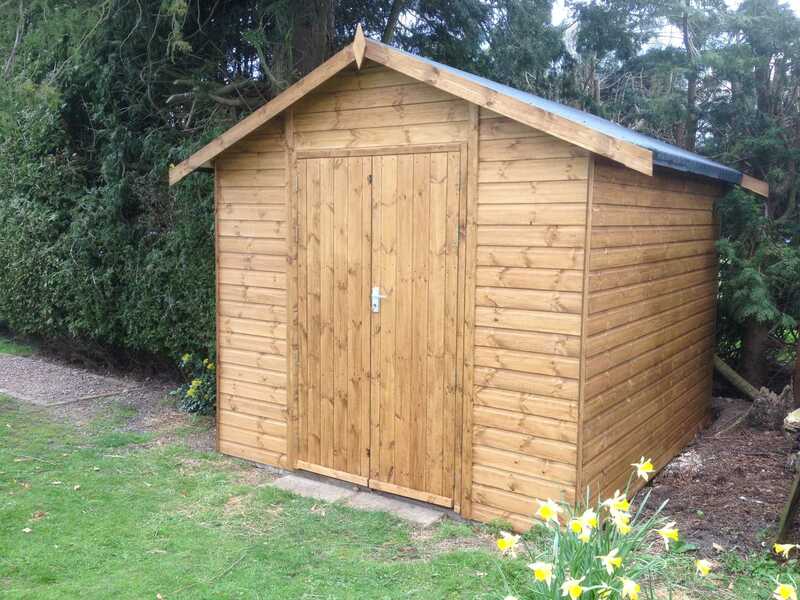 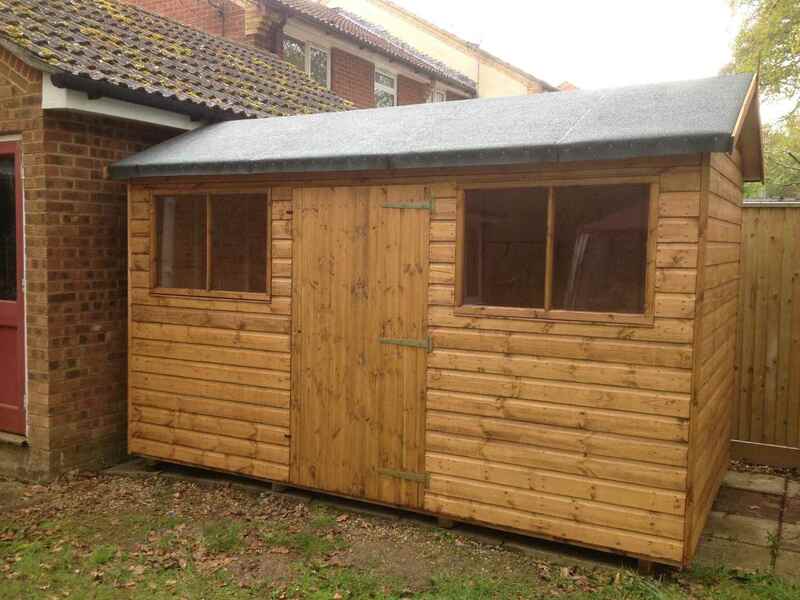 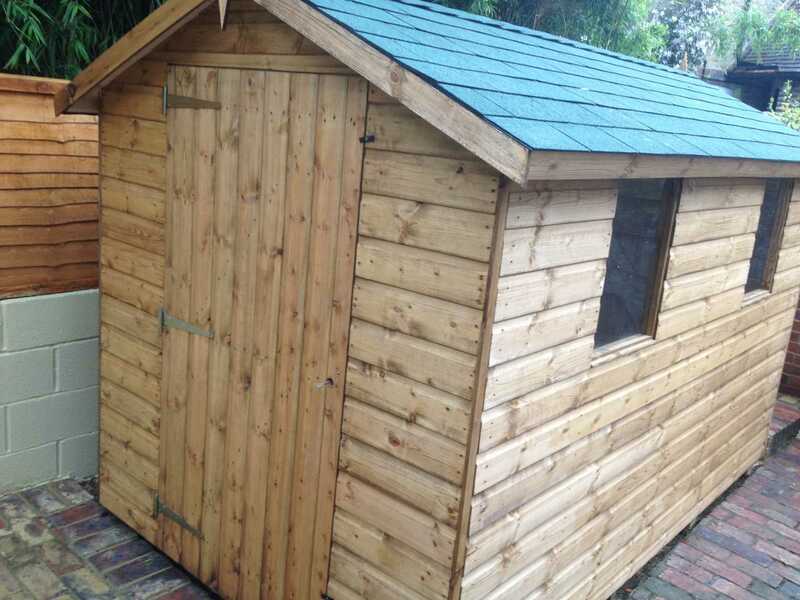 Petersham 14×6, Extra Height, Shed Compartment with Heavy Duty Door, Heavy Torch-On Felt, Shades Finish. 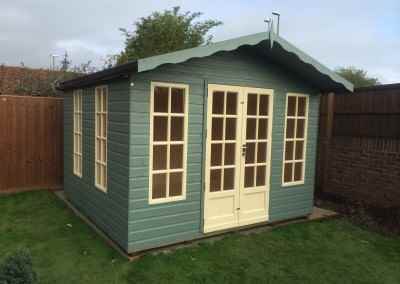 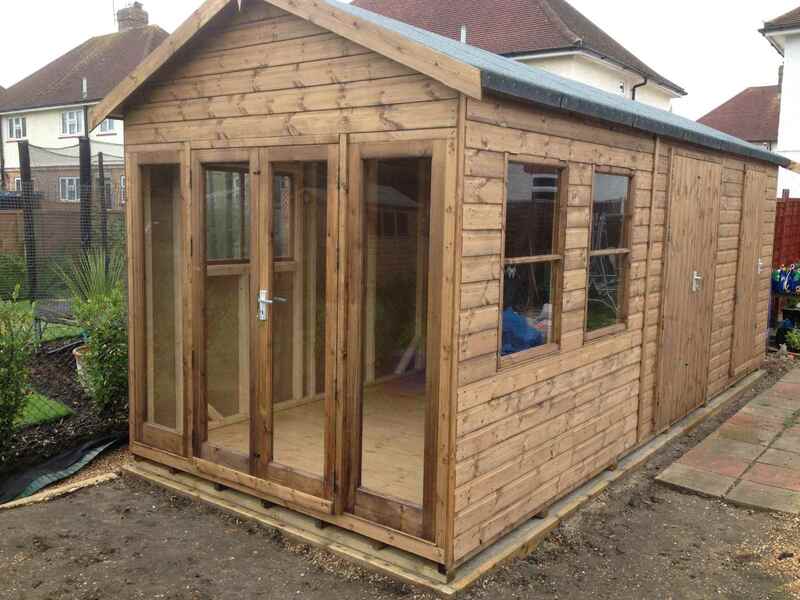 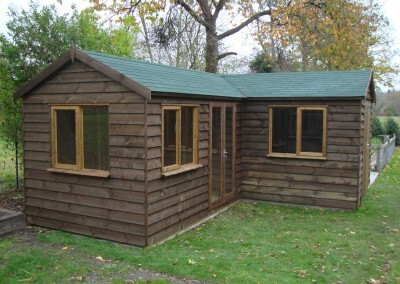 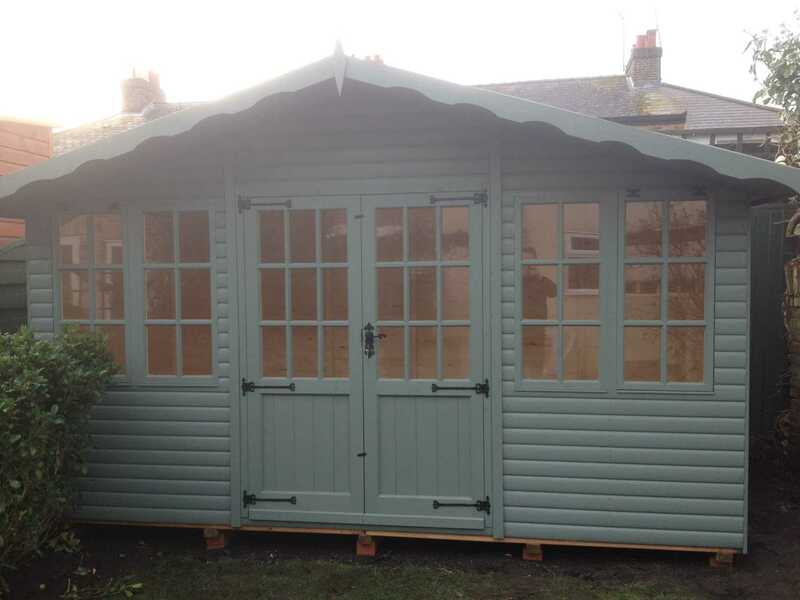 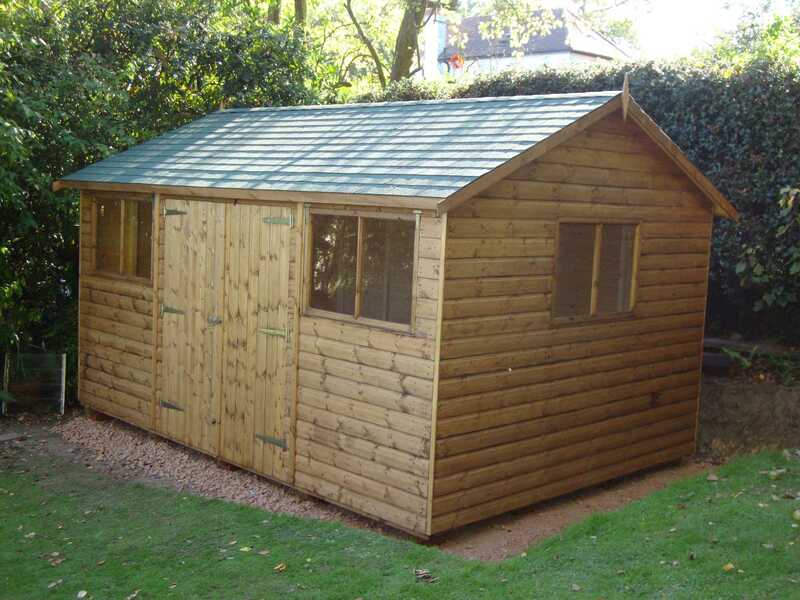 Deluxe Studio 16×14, T&Gv Lined and Insulated,Green Tiled Roof, Gutter & Downpipes, Shed Compartment, Shades Finish. Deluxe Studio 22×8, T&Gv Lined and Insulated, Green Felt Tiles, Shed Compartment, Shades Finish. Hampton 8×14 with Seperate Shed Compartment and Painted Finish. 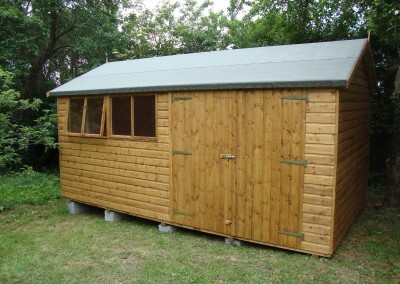 Hampton 15×7 with offset ridge and seperate shed compartment. 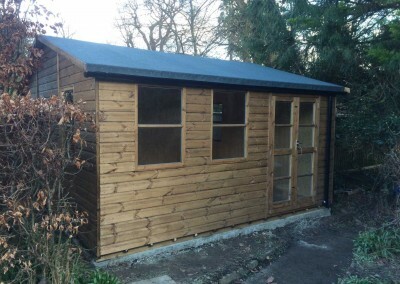 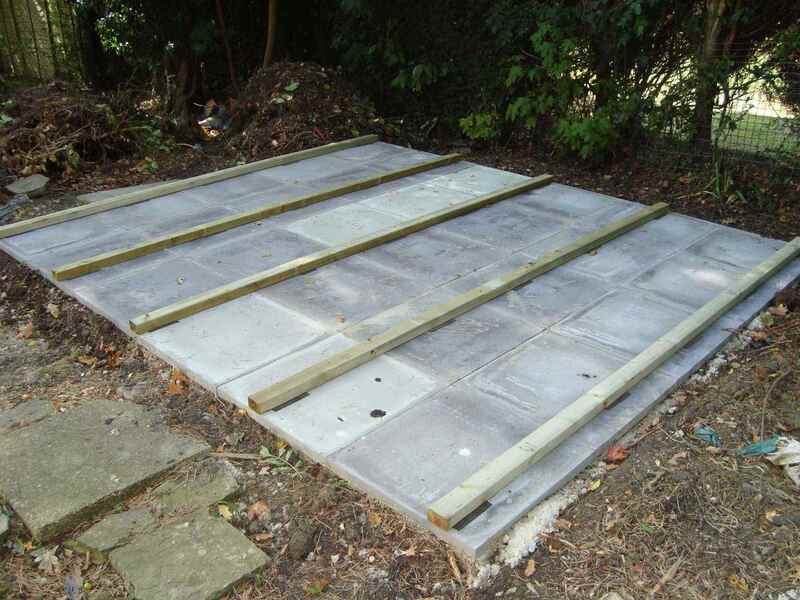 Petersham 8×10, Rear Shed Compartment. 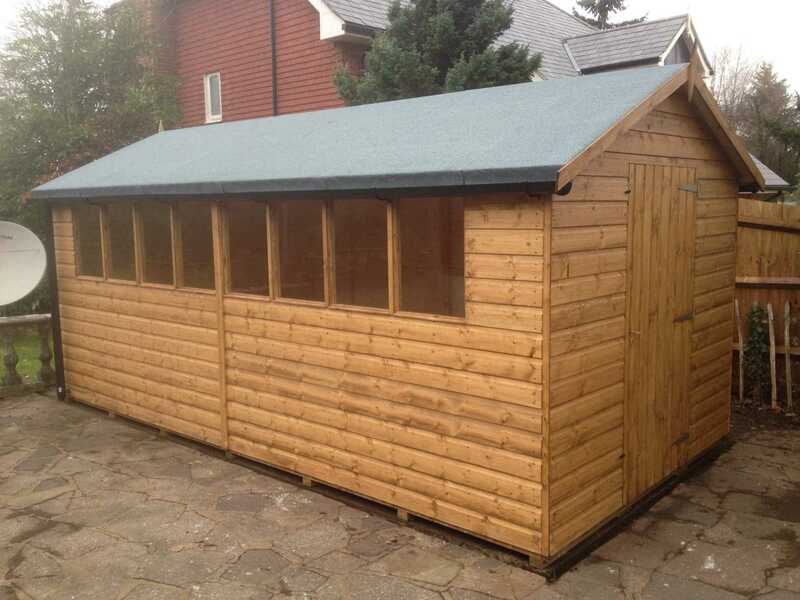 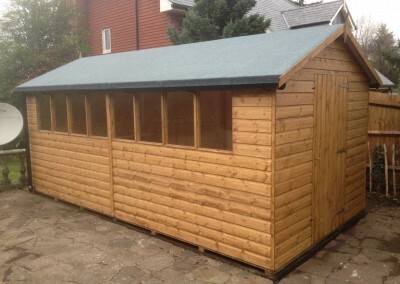 Petersham 14×8, Pent Roof, Shed Compartment, Shades Finish. 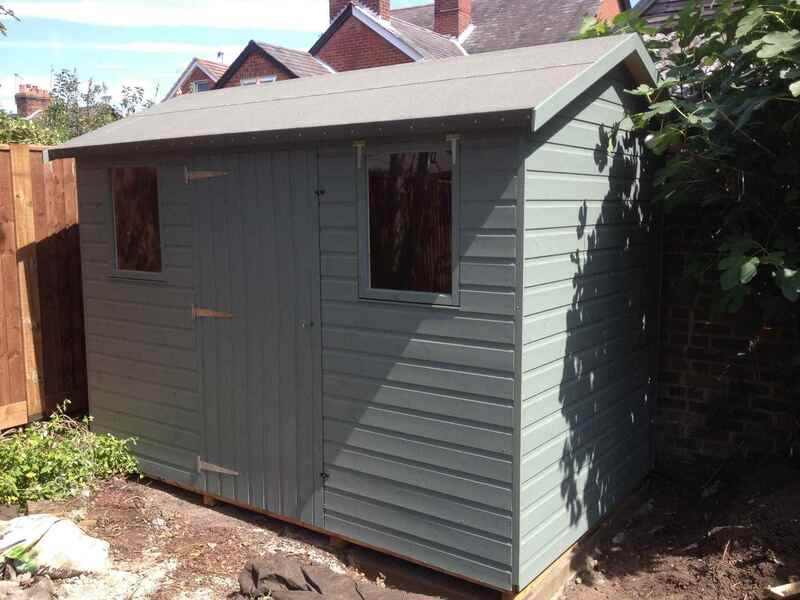 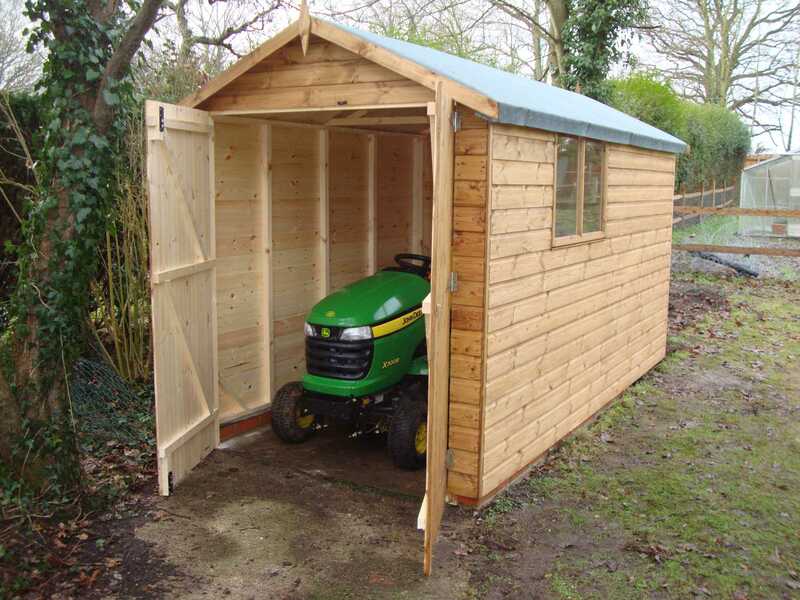 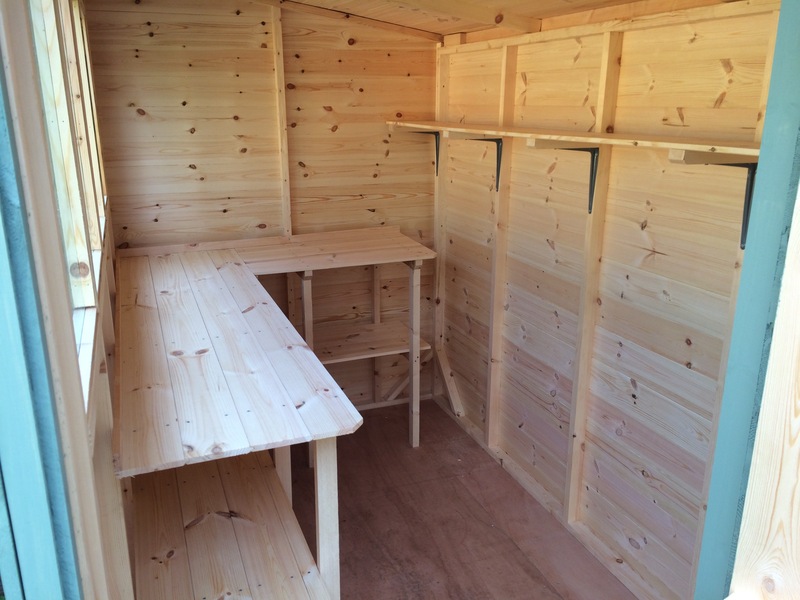 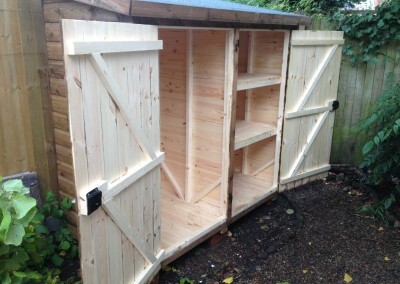 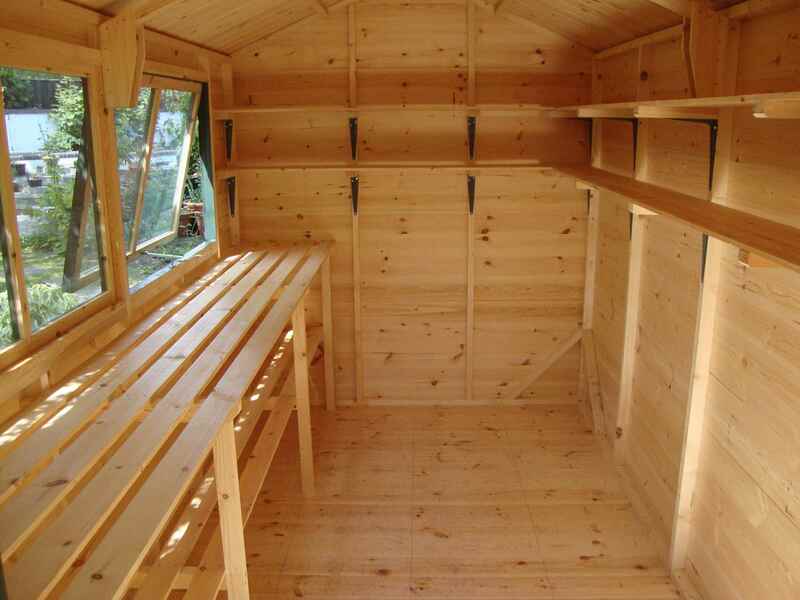 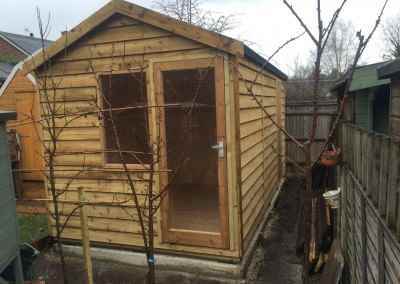 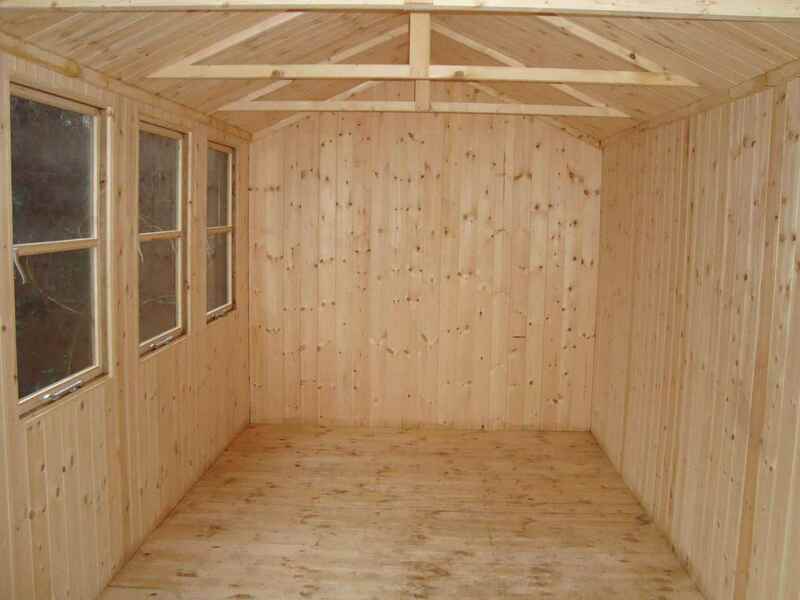 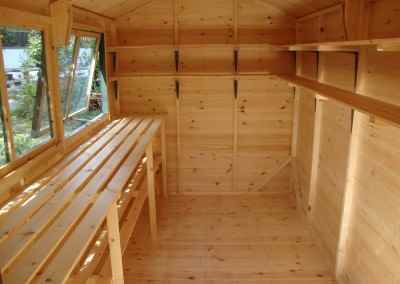 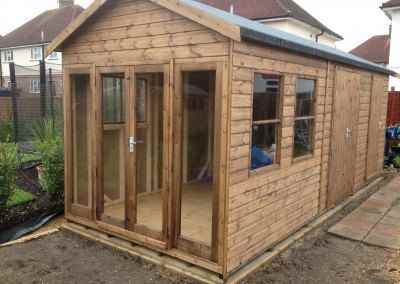 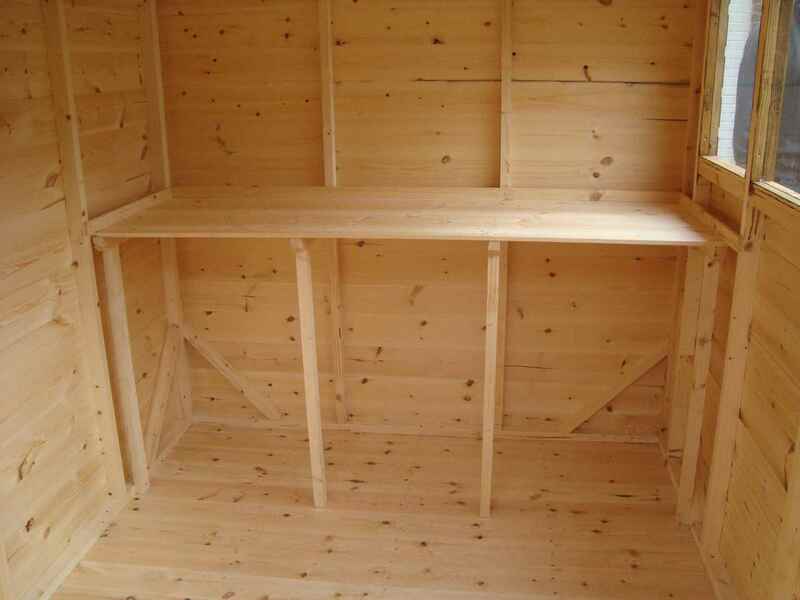 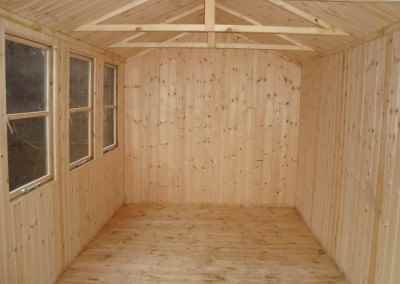 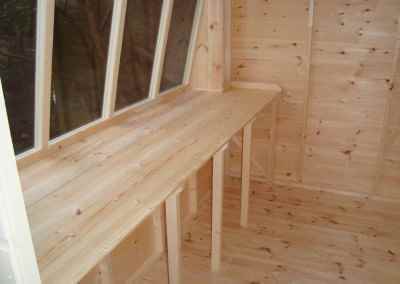 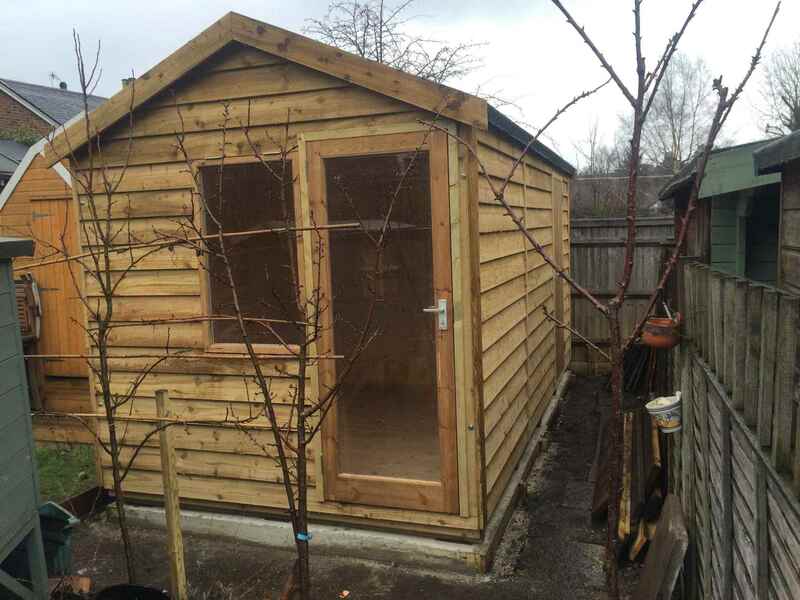 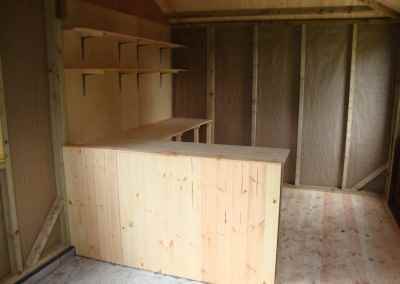 Tilford 10×7, Shed Compartment, Shades Finish. 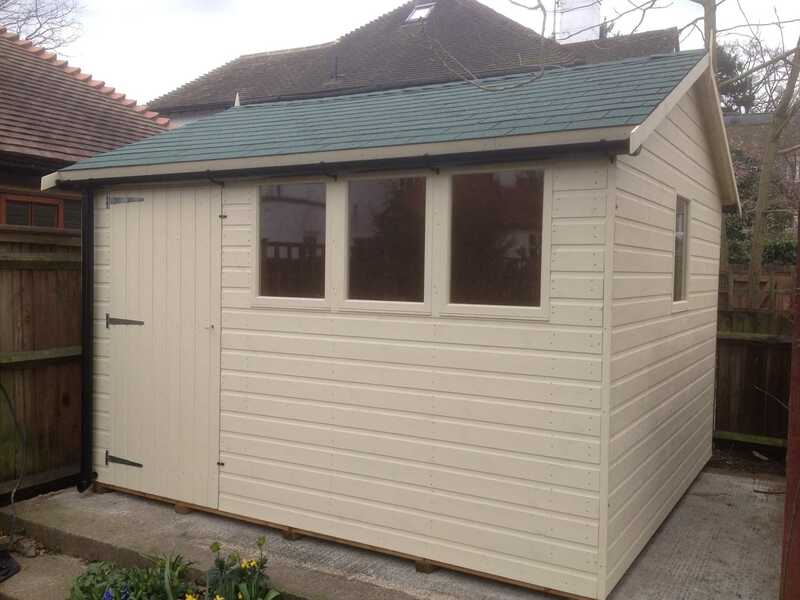 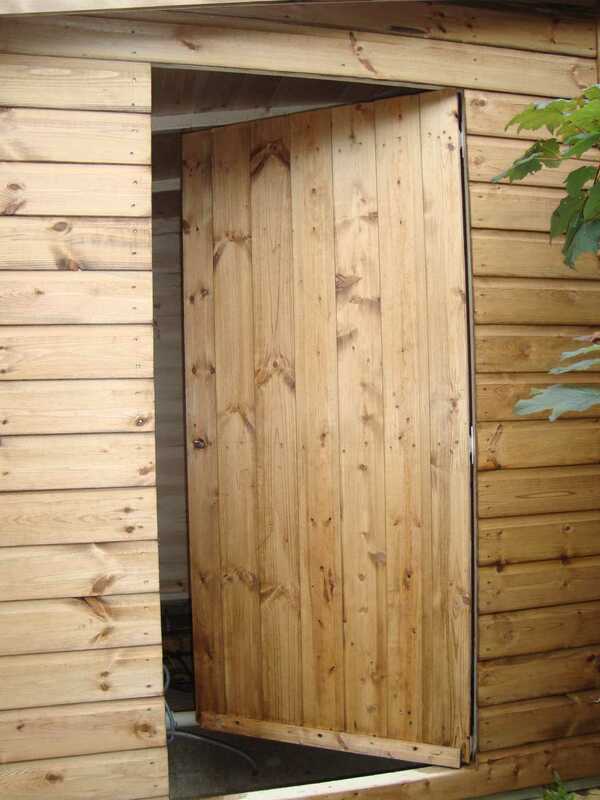 Windsor 16×10, Extra Door, Partition, Shades Finish, Lined & Insulated. 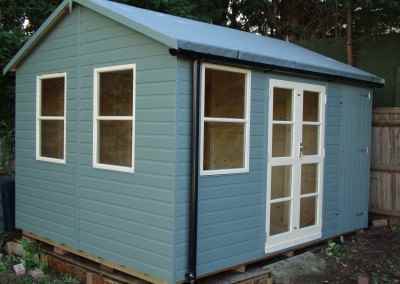 Deluxe Studio 12×10, Heavy Torch-On Felt, Gutter & Downpipes, Shades Finish. 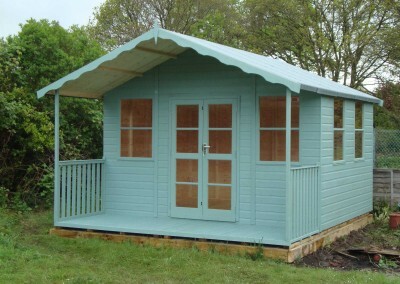 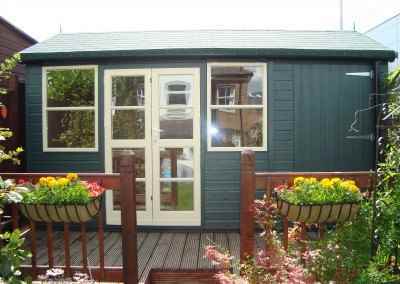 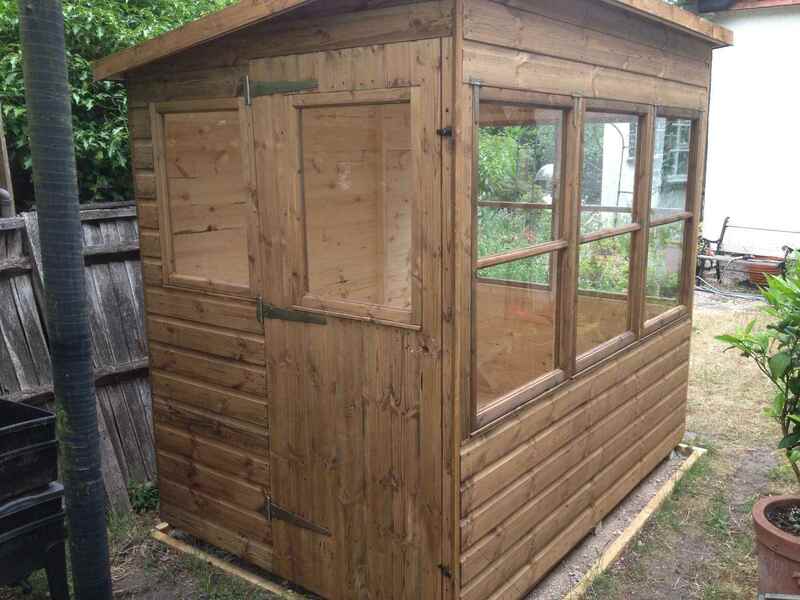 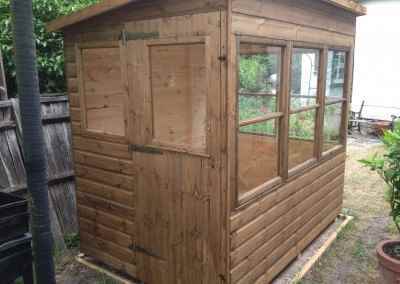 Deluxe Studio 14×10, 4′ Verandah, Sash Windows, Heavy Torch-On Felt, Shades Finish. 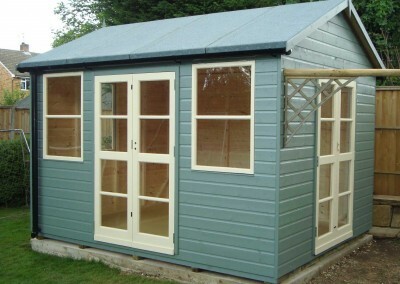 Deluxe Studio 18×10, Georgian Doors & Windows, Shades Finish. 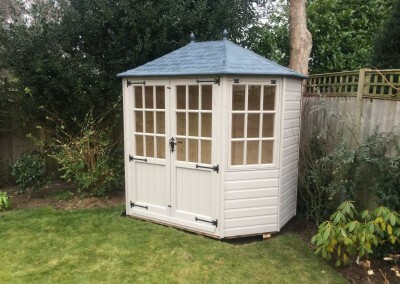 Frensham Gazebo 8X6 with Painted Finish. 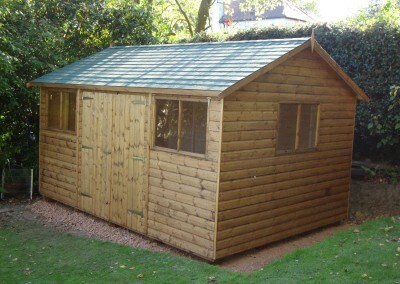 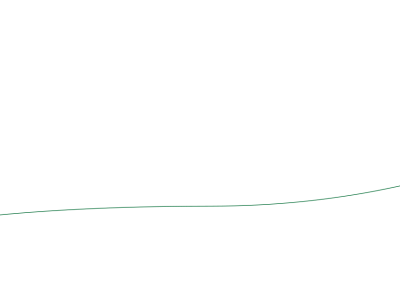  Hampton 14×7, Off-Set Doors, Reduced Roof Overhang, Shades Finish. 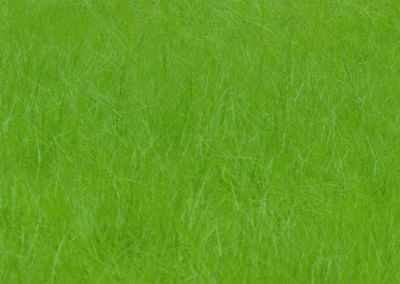 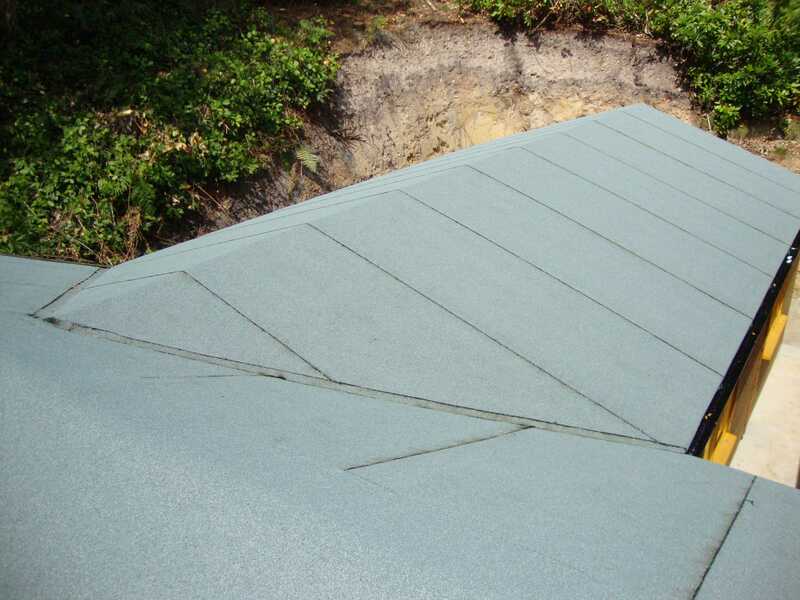 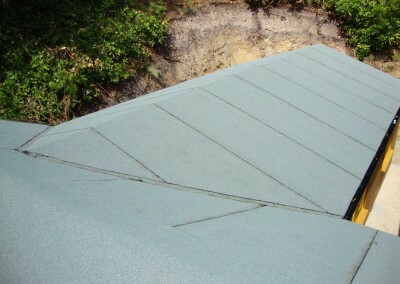 Petersham 8×8, 2’6 Verandah, Heavy Torch-On Felt, Shades Finish. 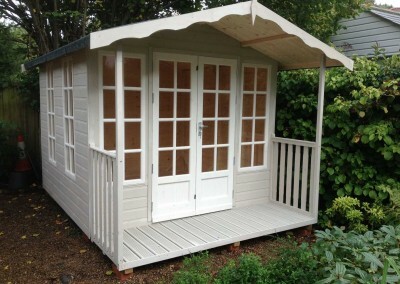 Petersham 12×8, 2’6 Verandah, Old English Fittings, Shades Finish. Tilford Corner House with Painted Finish 7×7. Deluxe Studio 11×9, 2 Pairs of Doors, Heavy Torch-On Felt, Shades Finish. 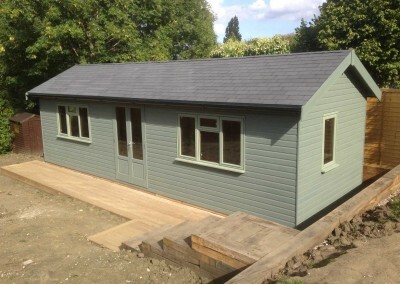 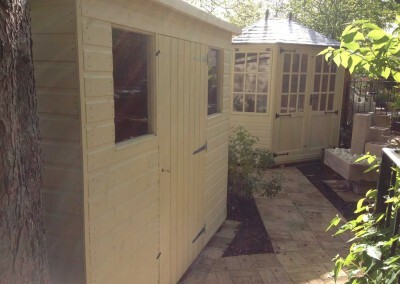 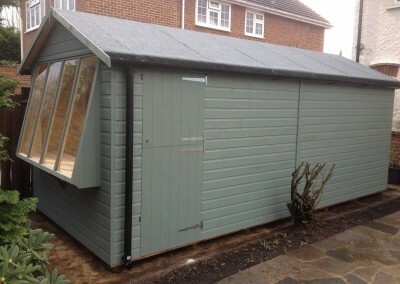 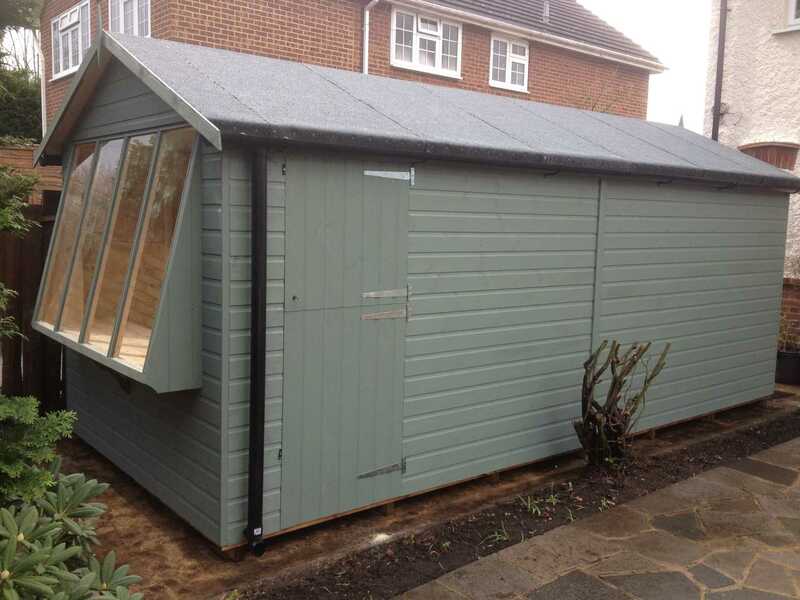 Deluxe Studio 16×10 with Petersham Doors & Windows, Grey Felt Tiled Roof, Guttering, Supplied Un-Treated.